Each year we are lukcy enough to be invited along to a number of amazing weddings, sharing and capturing the special day with the bride, groom and their wedding guests, we’ve created three separate blog posts to showcase some of our recent images and those we have used in updating our wedding gallery. 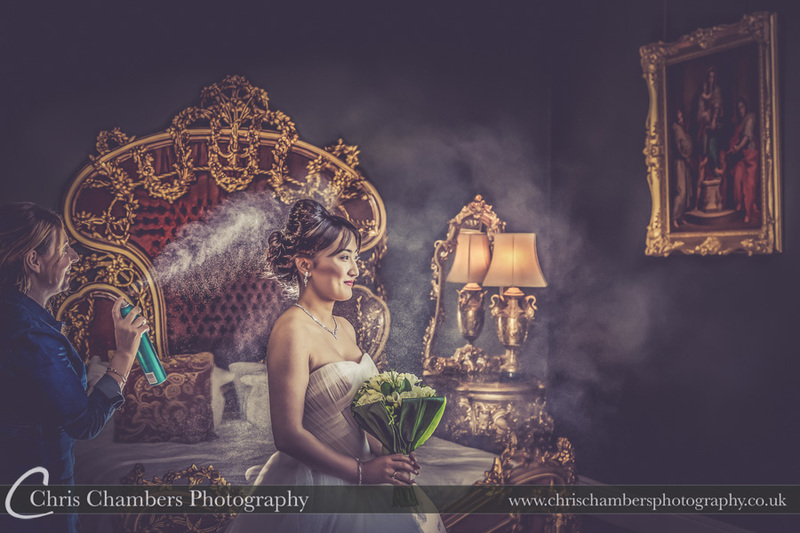 This wedding photography blog post includes some bridal preparation and detail photographs, groom preparation and ceremony photographs from weddings in and around Leeds, Wakefield and Yorkshire with a few a little further afield. Please feel free to pin these images on Pinterest or share this post on Facbook. 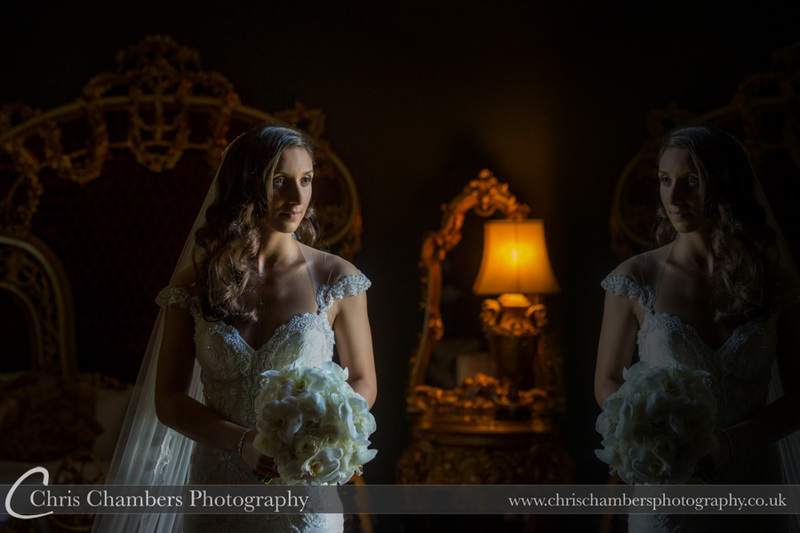 Bridal accessories photographed during a wedding at Allerton Castle North Yorkshire. 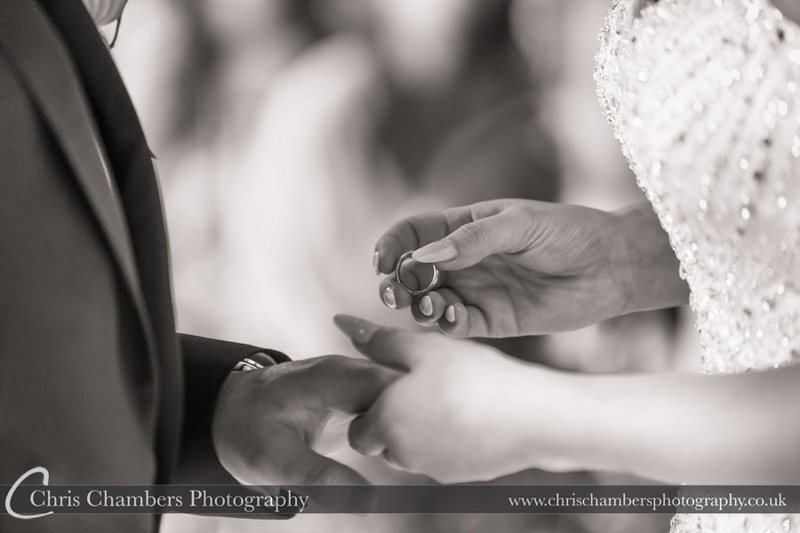 We always try and capture some of the bridal details during the preparation before the wedding ceremony. 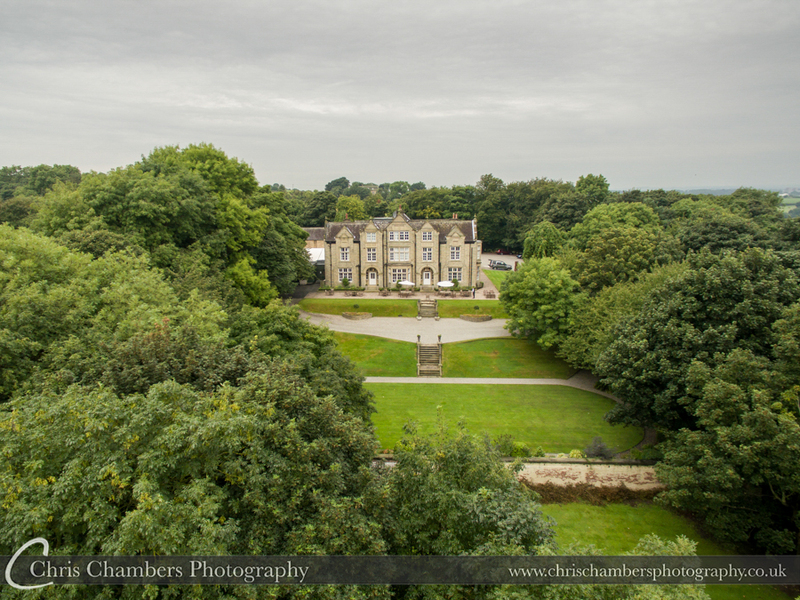 Where possible and as in the above photograph at Allerton Castle we try and include features or locations unique to the wedding venue. 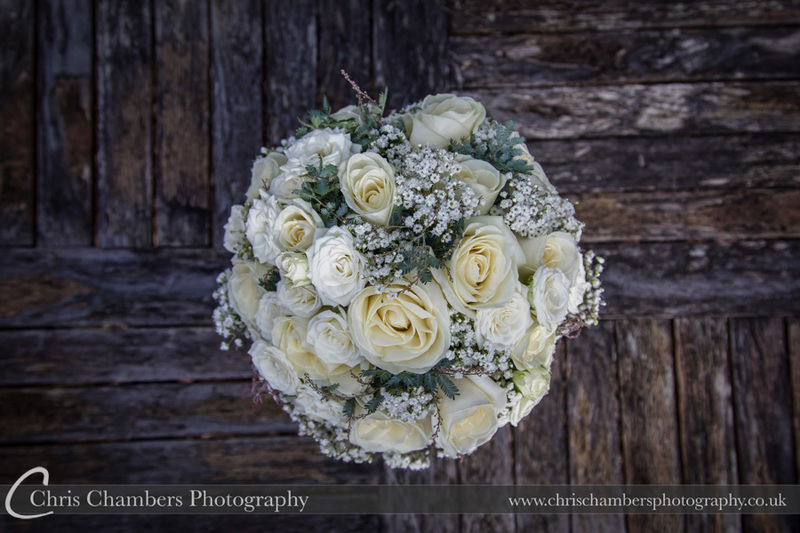 The bridal bouquet – wedding photograph of the brides flowers. Photographed in the hotel bathroom the wedding dress hangs out of the way of make up and hairspray before the wedding. Wedding photography Chris Chambers. 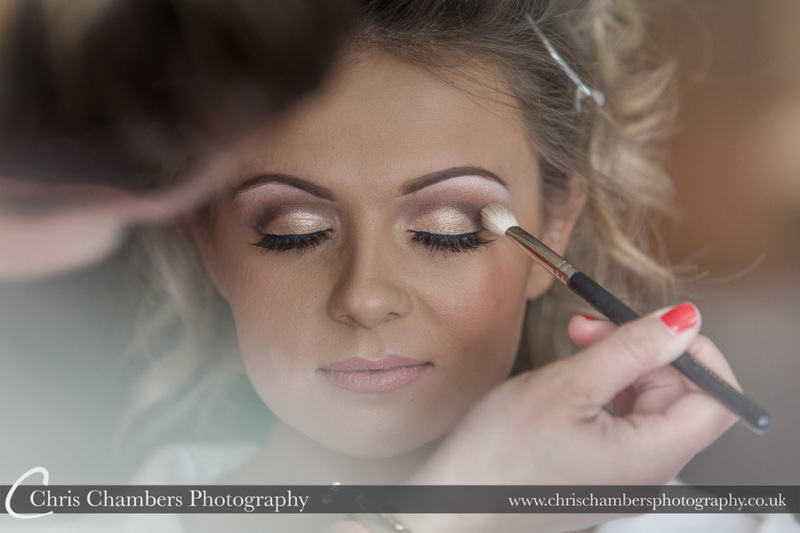 Bridal make up images, we usually tray and wait until he make up is almost finished before move in for some touch up photographs. 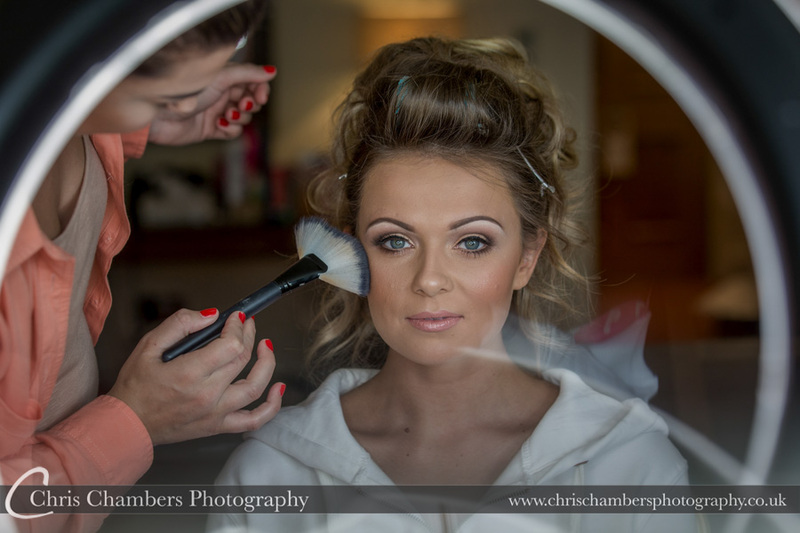 Brides sometimes prefer to do their own make up as above with Rachel earlier this year. 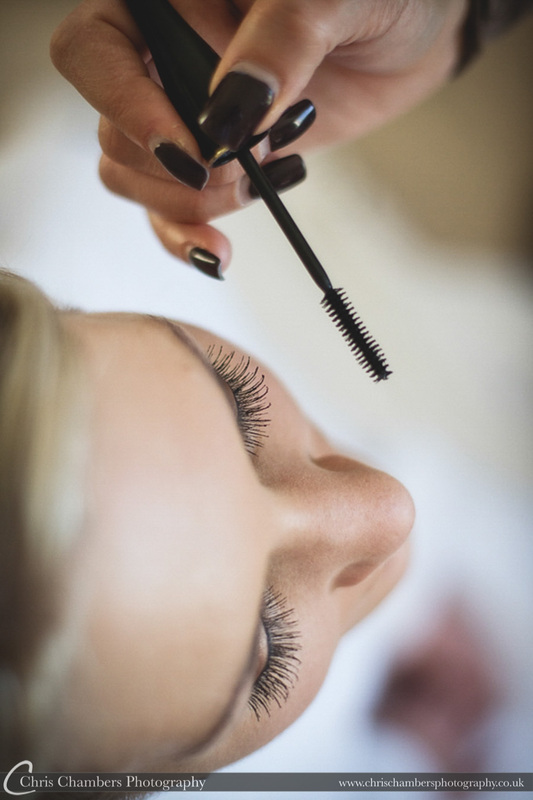 An often copied shot we often do for mascara. 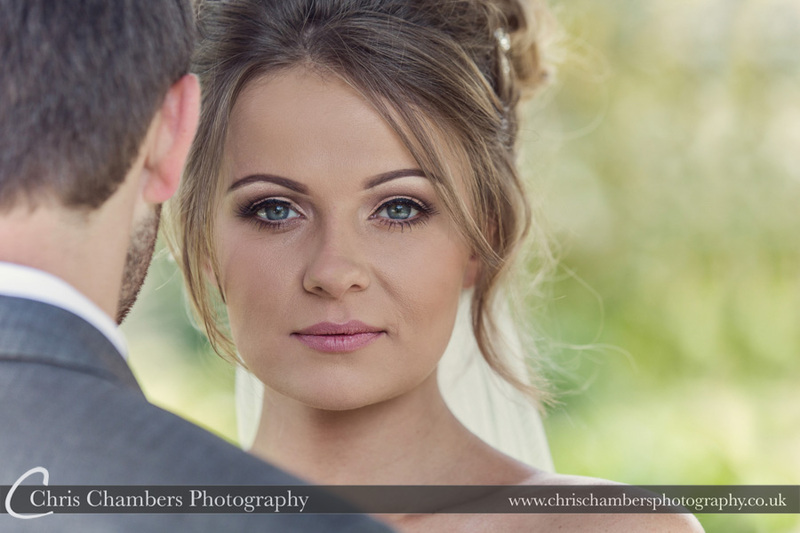 we’ve seen so many bad examples where wedding photographers try and copy this signature make up photograph! 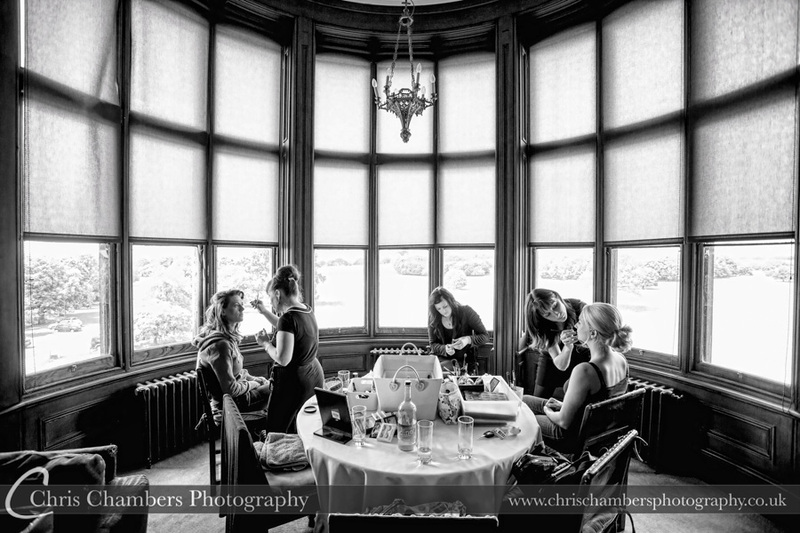 Allerton Castle bridal preparation with Kristy and her bridesmaids. 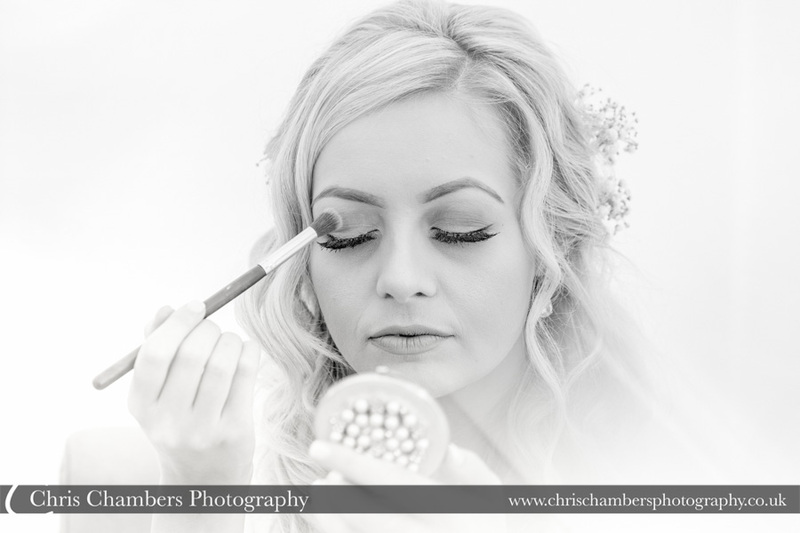 Jess again at Wentbridge House for makeup. 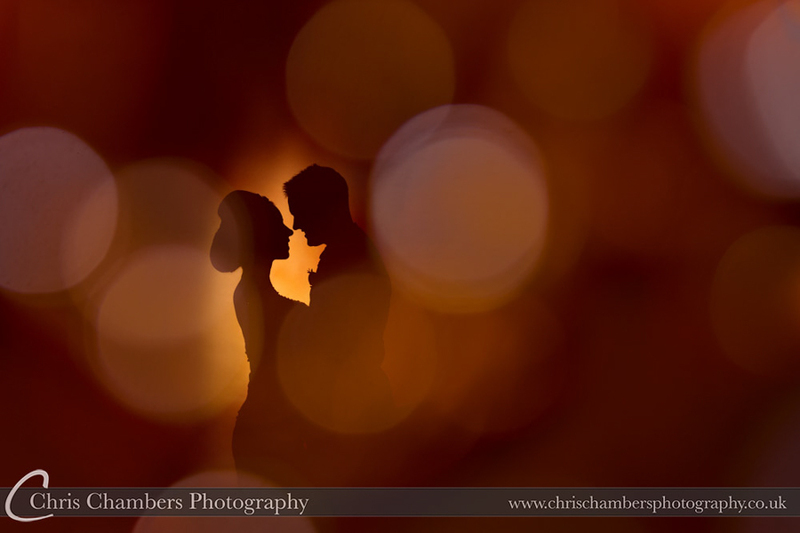 Wedding photography from Chris Chambers. 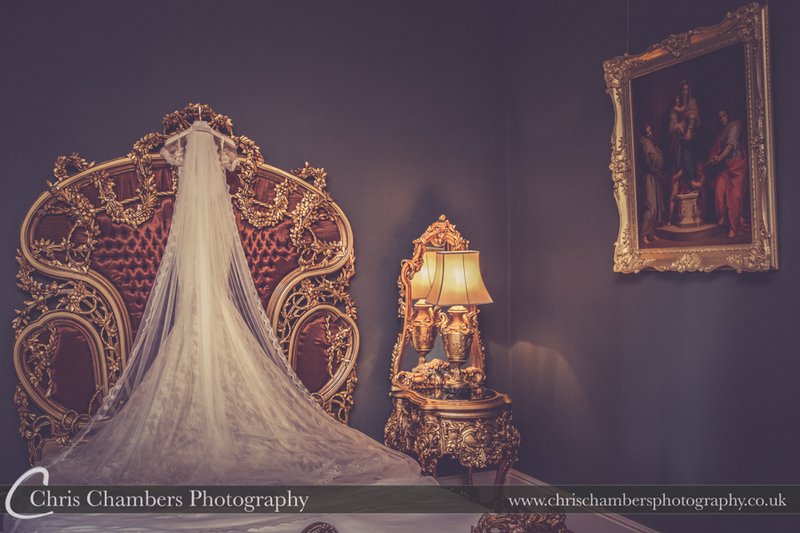 Allerton Castle bridal preparation in the Palace Suite. 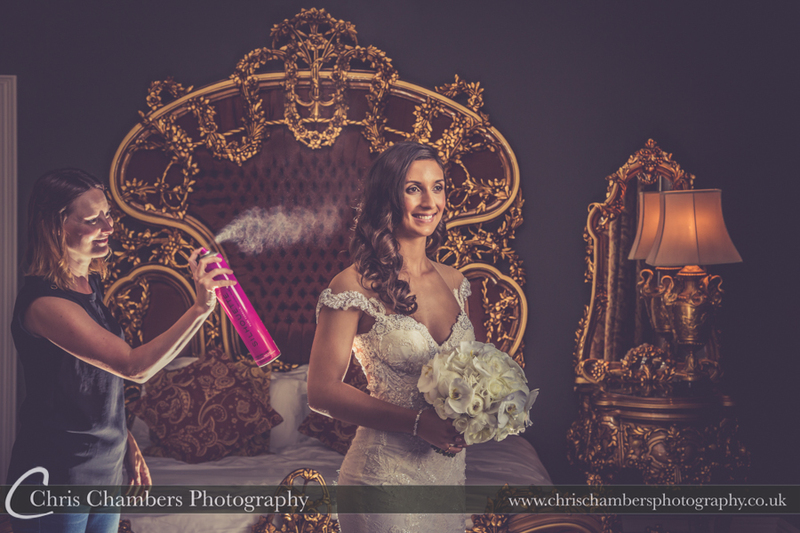 Liberal amounts of hairspray applied to Shumin ahead of her wedding at Allerton castle earlier this year. 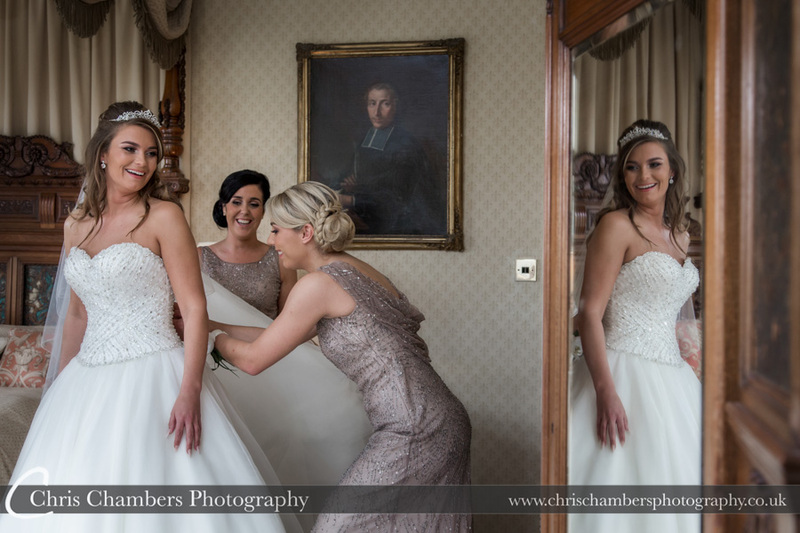 Once the bride has stepped into the dress and is no longer feeling exposed we head back into the room to capture the bridesmaids / mum or whoever is fastening the dress, hopefully smiles and giggles all round. 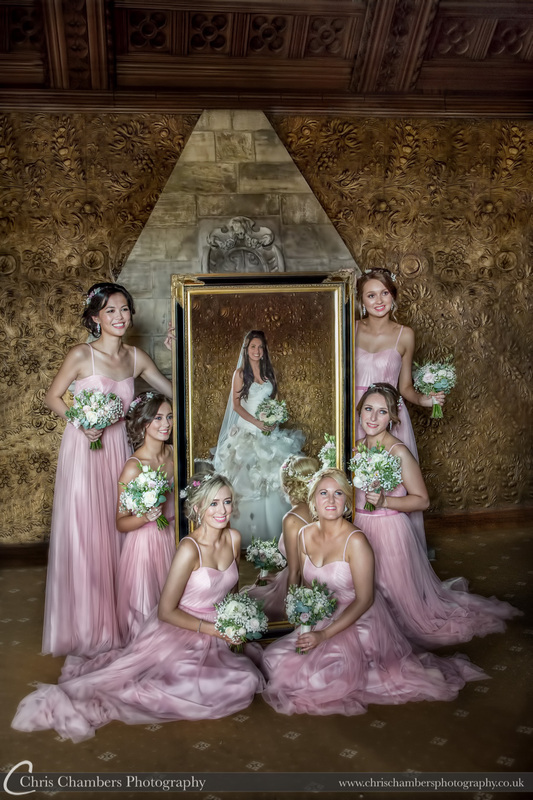 Hayley and her bridesmaids in the Victoria Room at Hazlewood Castle near York. Ahead of the wedding ceremony hayley had asked for a photograph with the bridesmaids in the Victoria room. 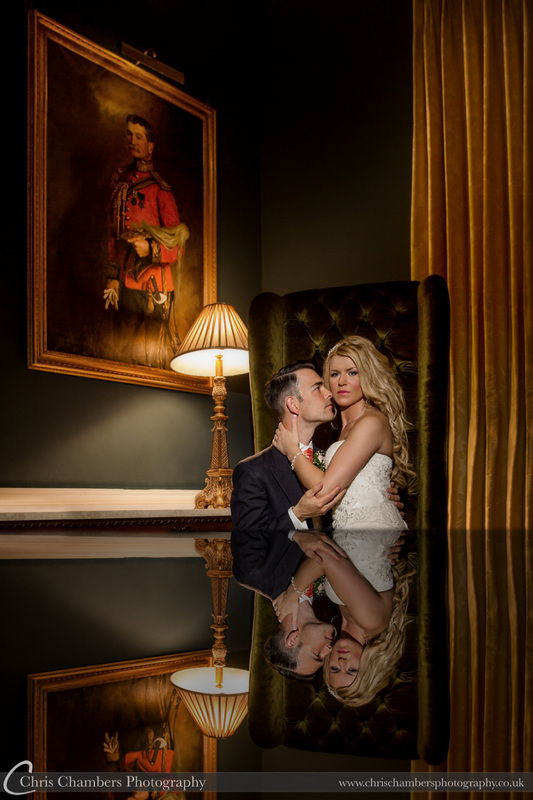 The large mirror was perfect for creating this reflection photograph. 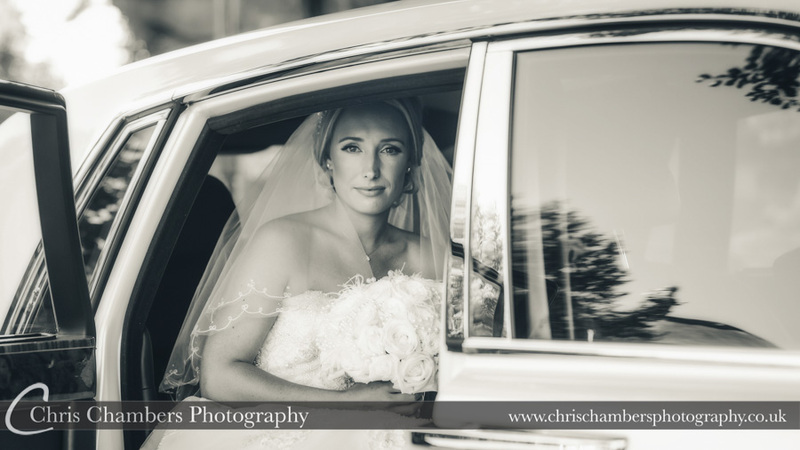 Elles all dressed and ready to go ahead of her wedding to Matt at Allerton Castle. 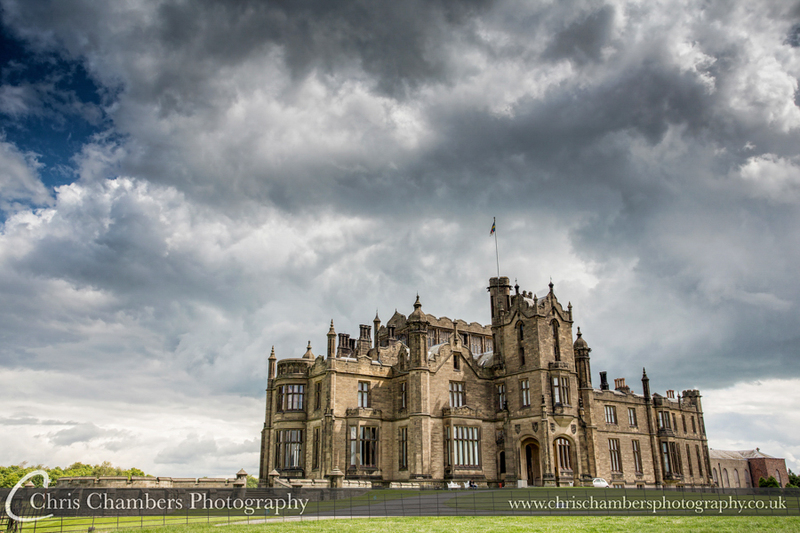 Allerton Castle wedding photography. 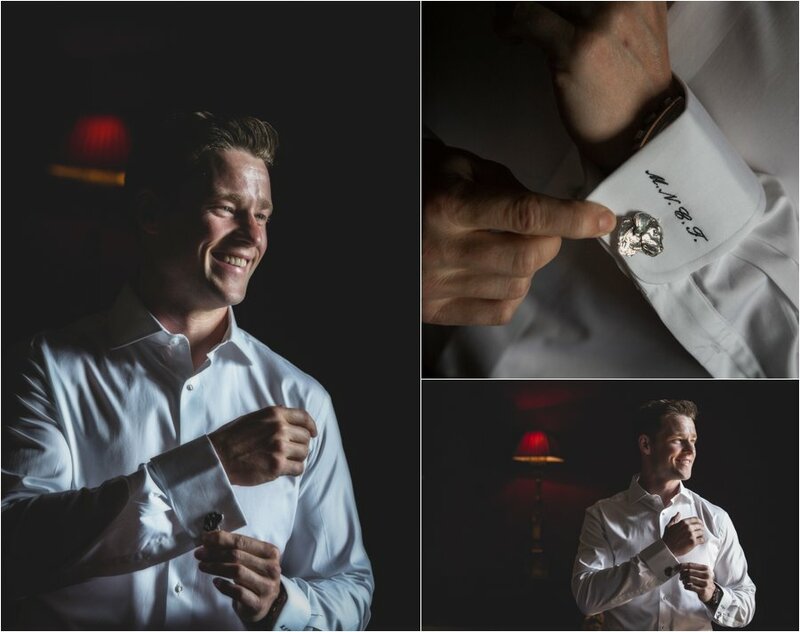 Groom accessories, we often cover the grooms preparation and try to include some photographs of his accessories, shoes etc before he dresses fully. 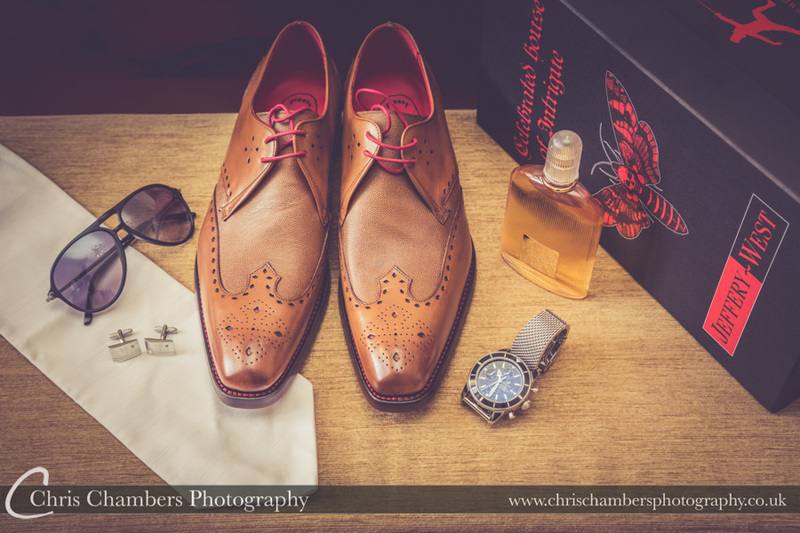 Will’s Jeffery West wedding shoes and assortment of accessories before his wedding at Stoke Rochford Hall earlier this year. 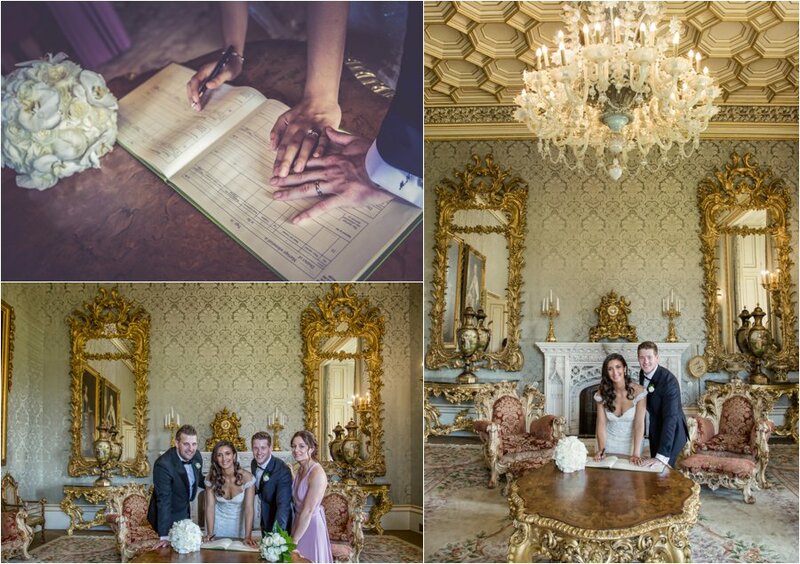 Allerton Castle wedding photography, Julian in the Billiard room before his wedding to Hayley in July this year. 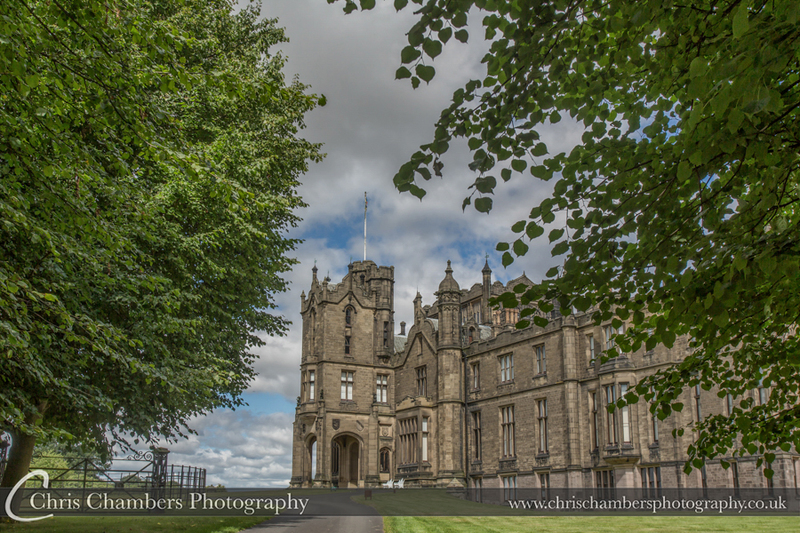 Allerton Castle wedding photographer. 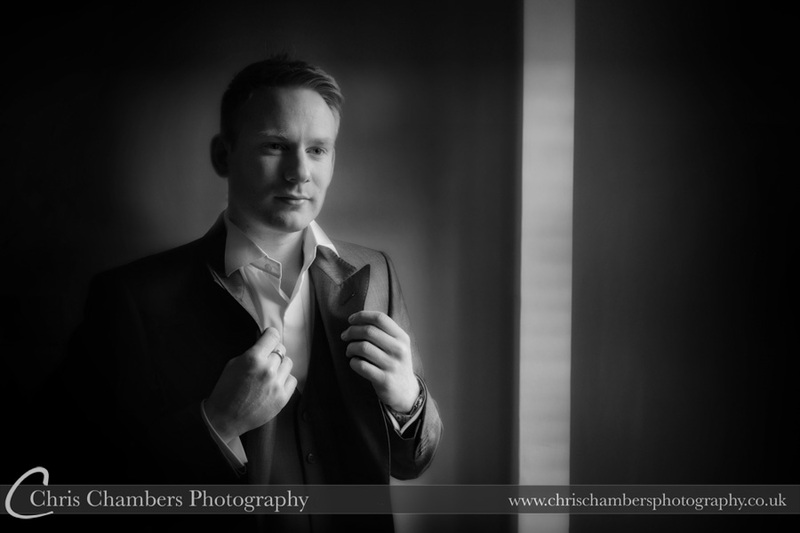 David ahead of his Ripley Castle wedding. 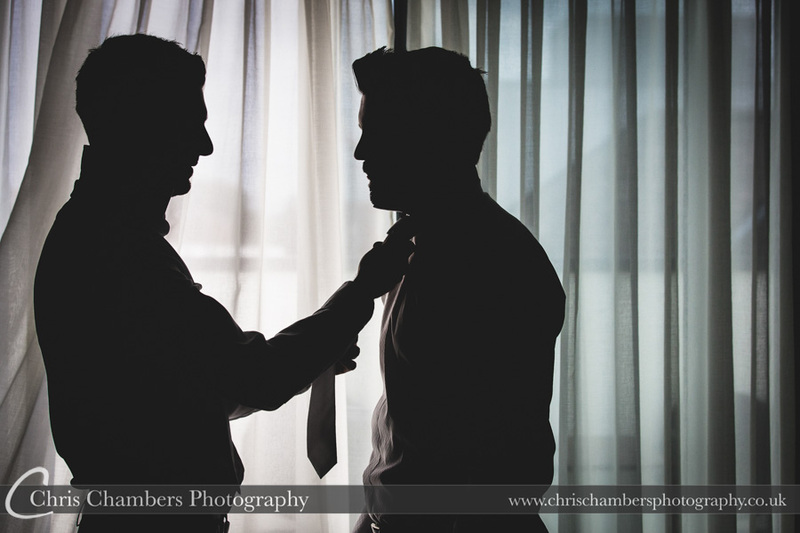 Photographed during groom preparations in Harrogate. Matthew in the billiard room of Allerton Castle. 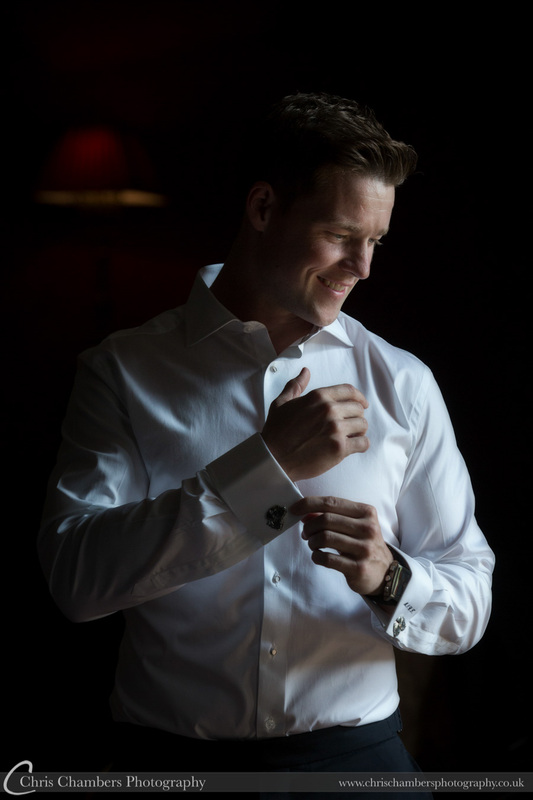 We try and include groom prep where possible, often grooms arrive at the wedding venue part dressed which gives us the ideal opportunity to capture some wedding photographs of the guys getting ready to match those of the bridal preparations. 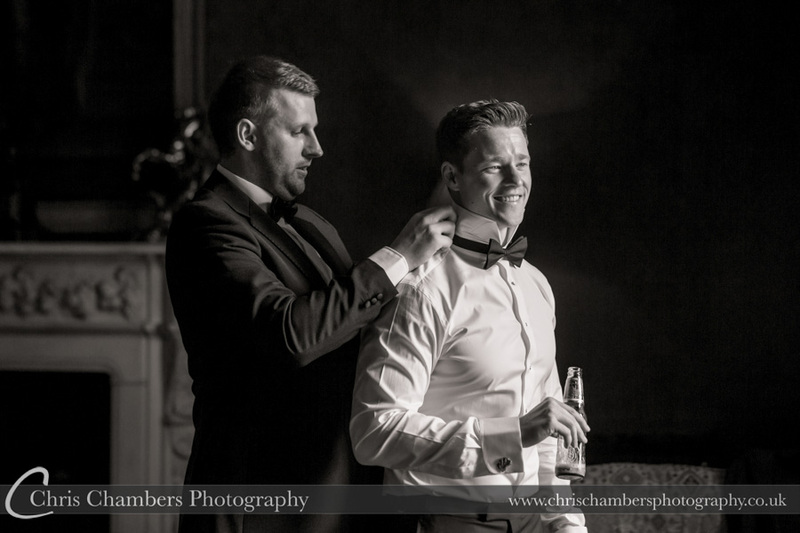 Another of Matt at Allerton Castle as his bow tie is adjusted before his wedding to Elles. 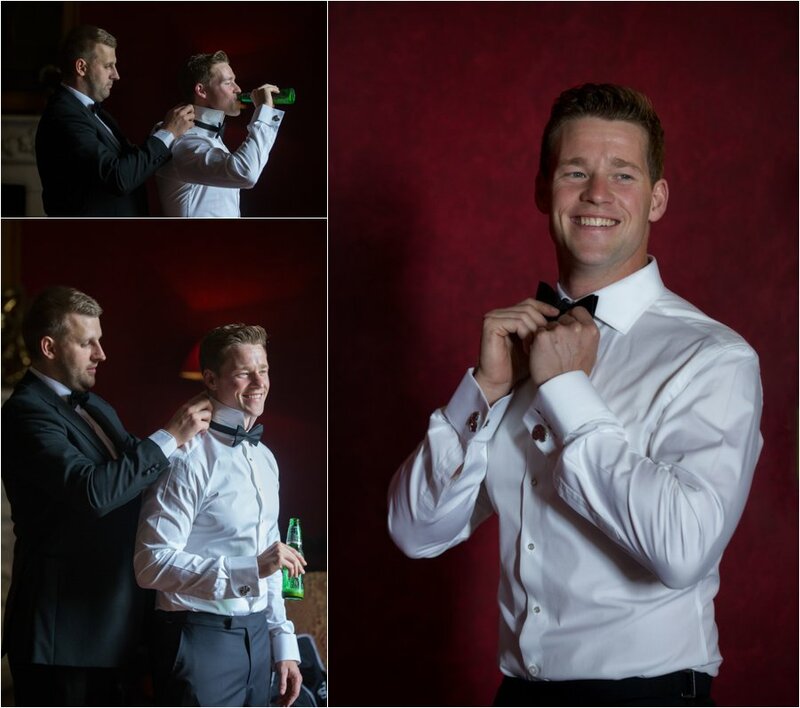 We try and involve the grooms men where possible, this photograph shows David and his best man before his wedding to Katie at Ripley Castle. 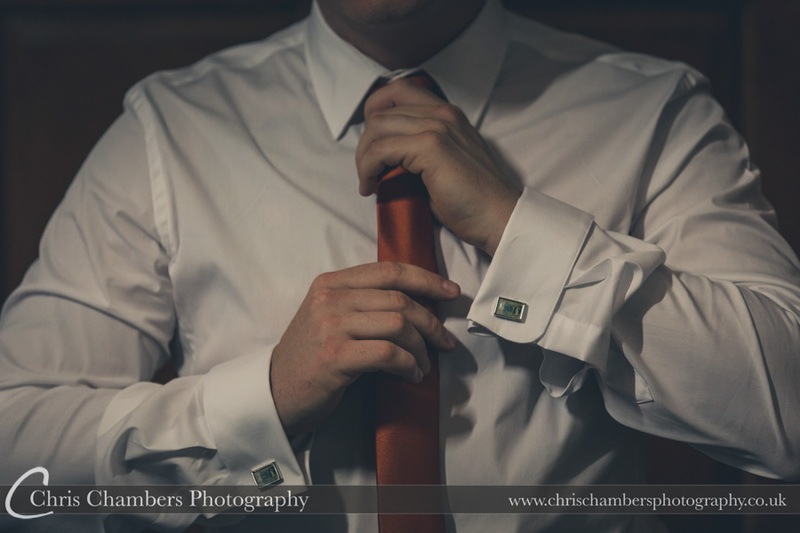 Simple detail wedding photograph showing the grooms cufflinks and tie. 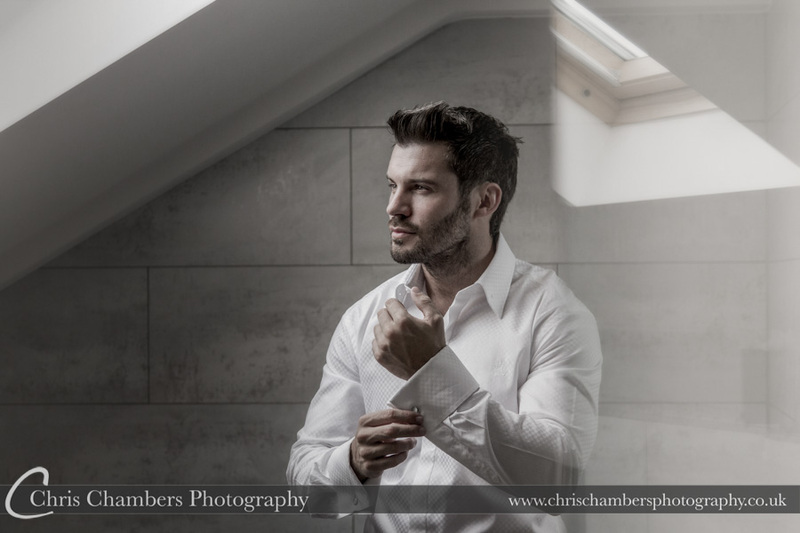 Groom preparation – Although we capture natural moments, a lot of the groom preparation photos are planned ahead, we try and create a more styled look, often using darker rooms than we would normally select for wedding photographs. 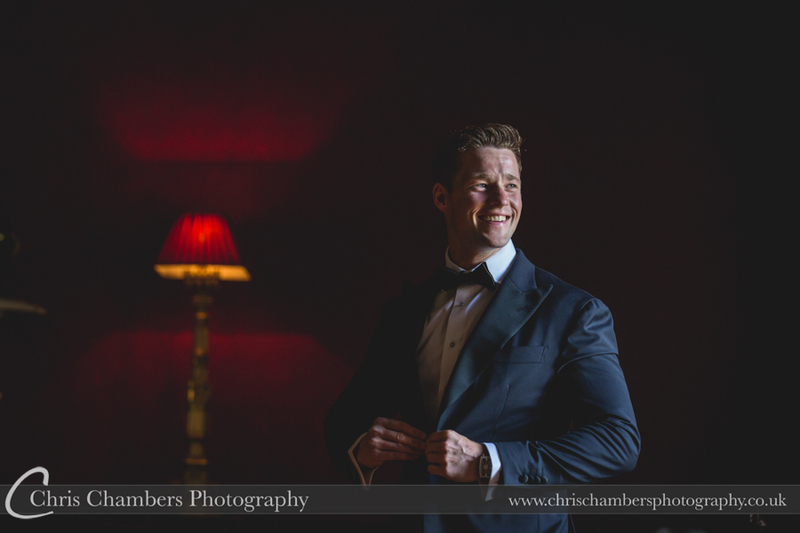 Groom preparation at Allerton Castle. 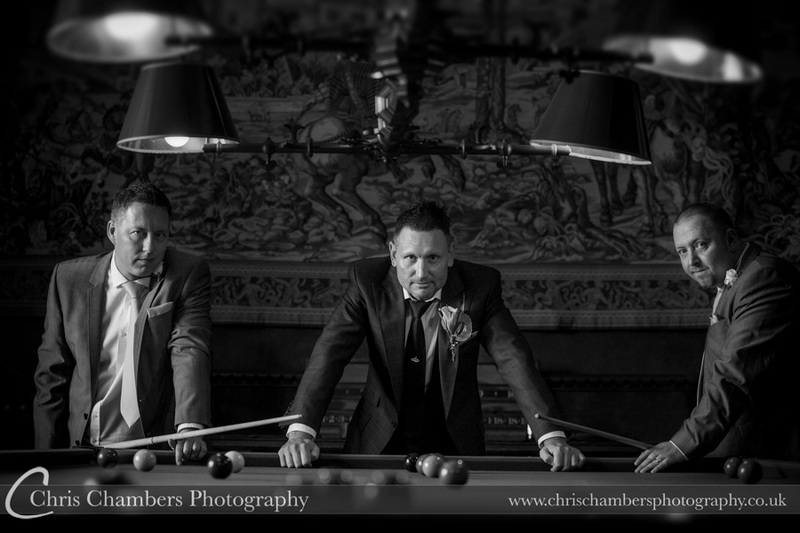 A Billiard table makes a great prop for wedding photographs of the guys before the ceremony. 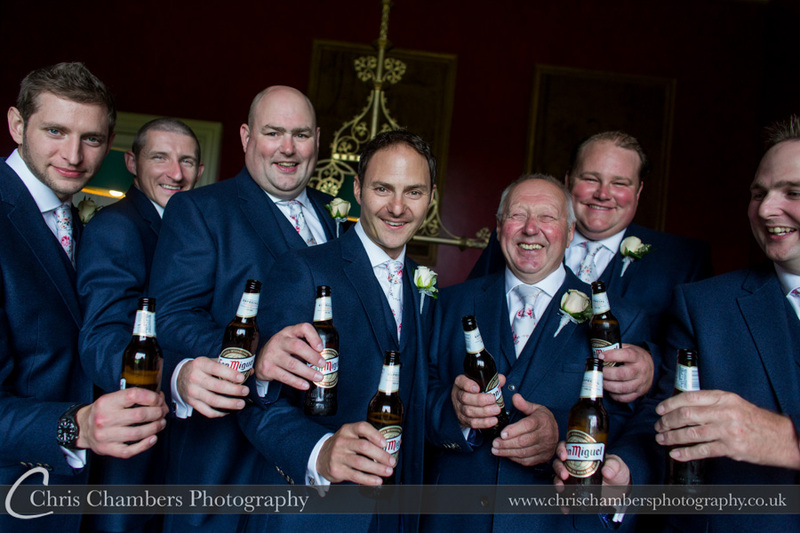 Antony with his bestman and usher before his wedding at Allerton Castle. 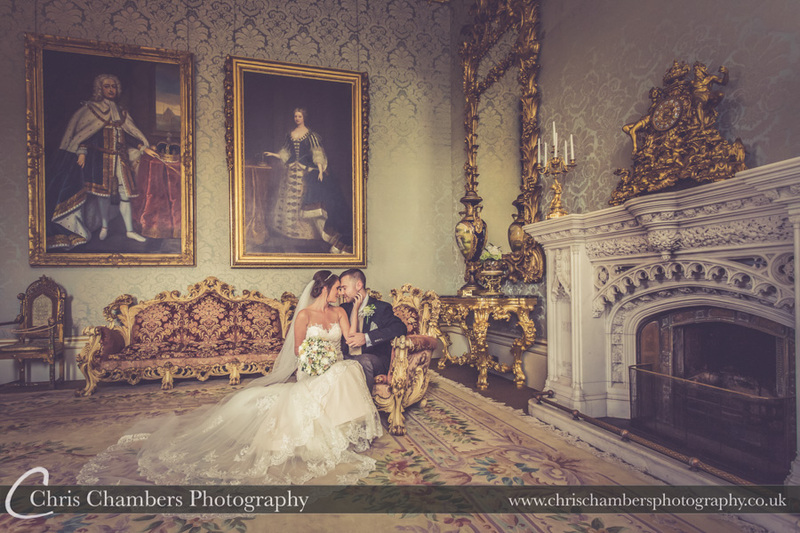 Allerton Castle wedding photography from Chris Chambers. 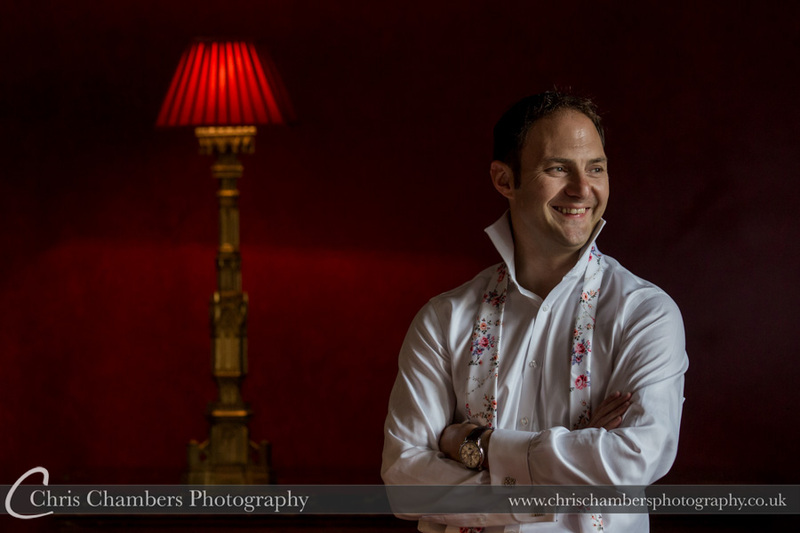 More inside the billiard room at Allerton Castle with Julian before his wedding to Hayley this year. 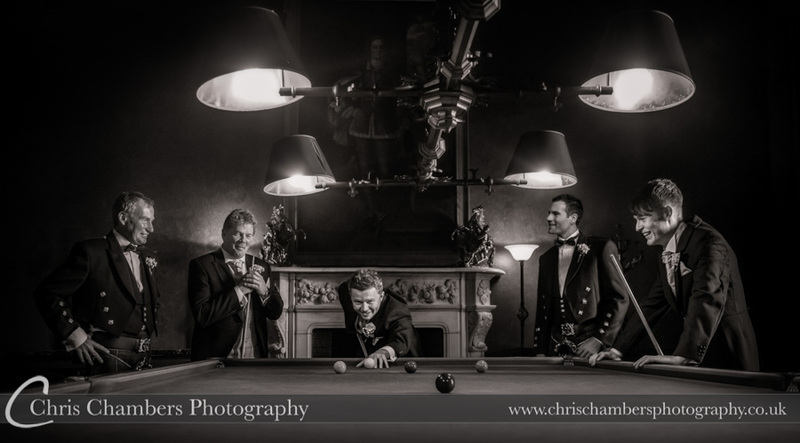 One of our favourite groom photos from the last few years is this award winning wedding photograph os Andy and his father, best man and ushers around the billiard table at Allerton Castle. 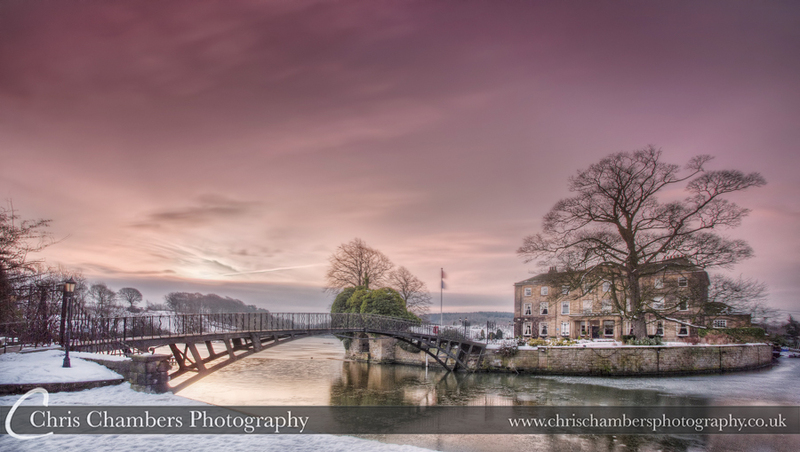 A signature shot of ours that we often see imitated, again rather badly most of the time! 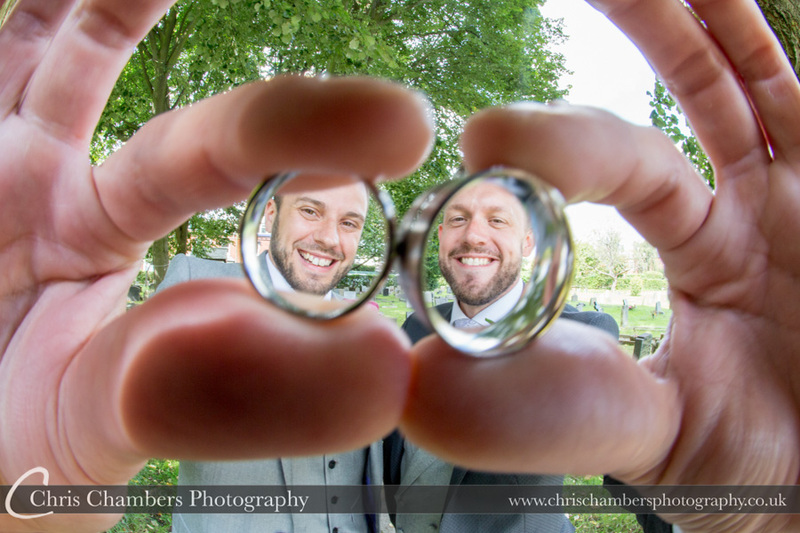 Gary and his bestman outside church near Leeds with the wedding rings. 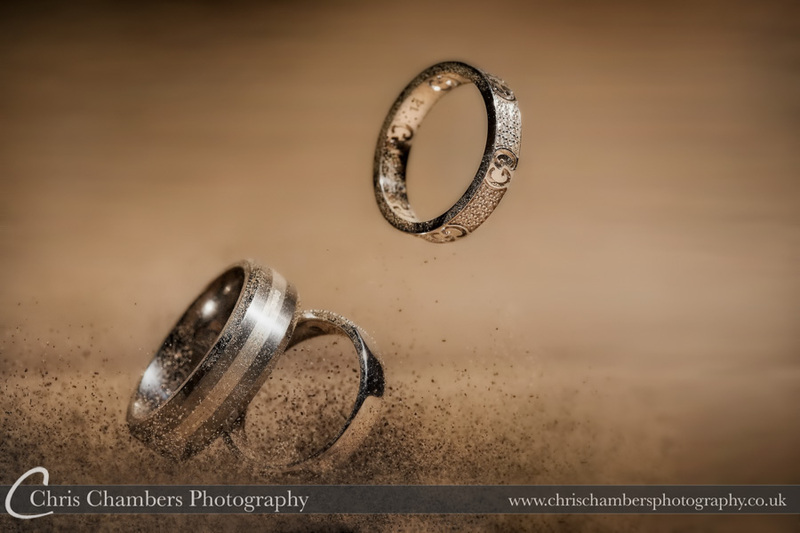 This wedding ring photograph won a Silver award with the Guild of Photographers. John and Emma’s wedding and engagement rings photographed at Hazlewood Castle. 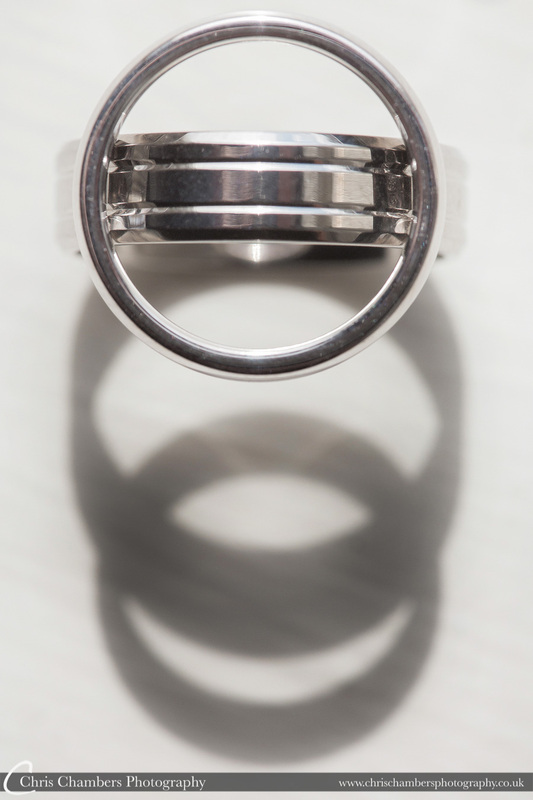 Shadows – the stacking of the rings has created a shadow different to the way they were stacked. 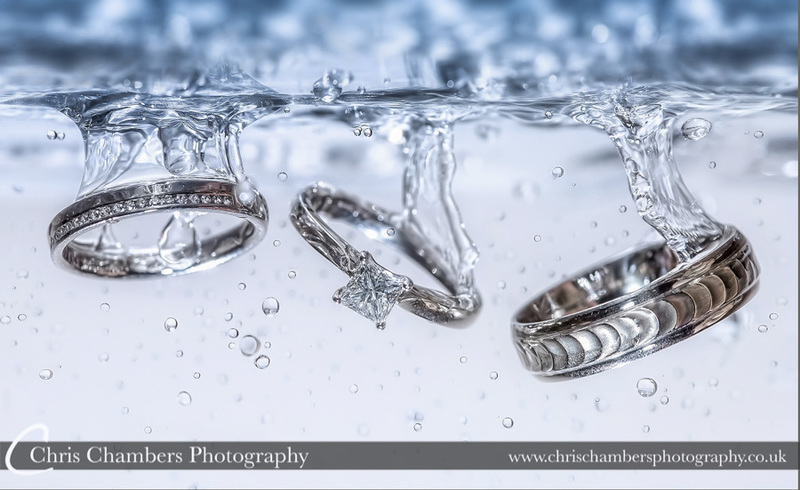 We often tray and produce creative wedding ring photography where time allows on the wedding day. 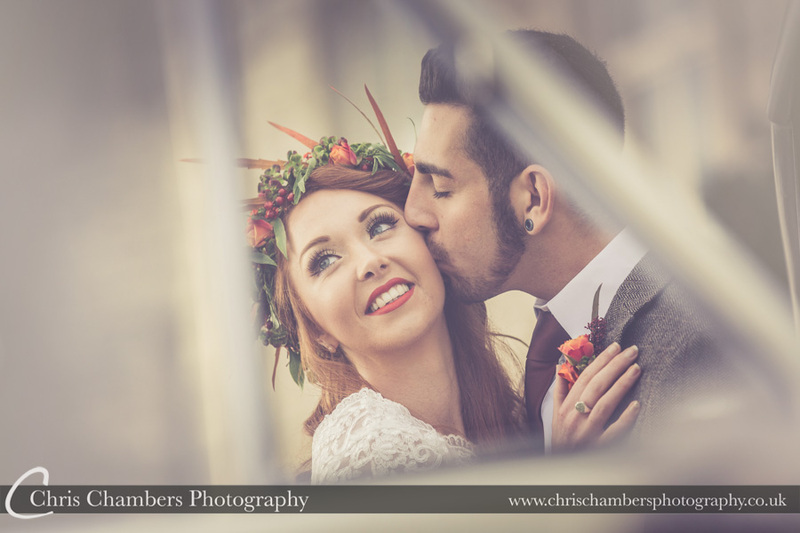 Chris Chambers Wedding Photography. 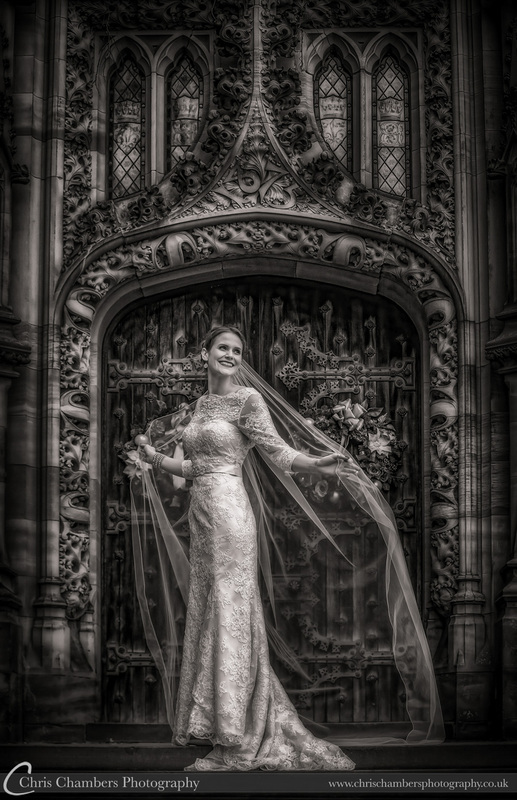 A Gold award winning wedding photograph with the Guild of Photographers. 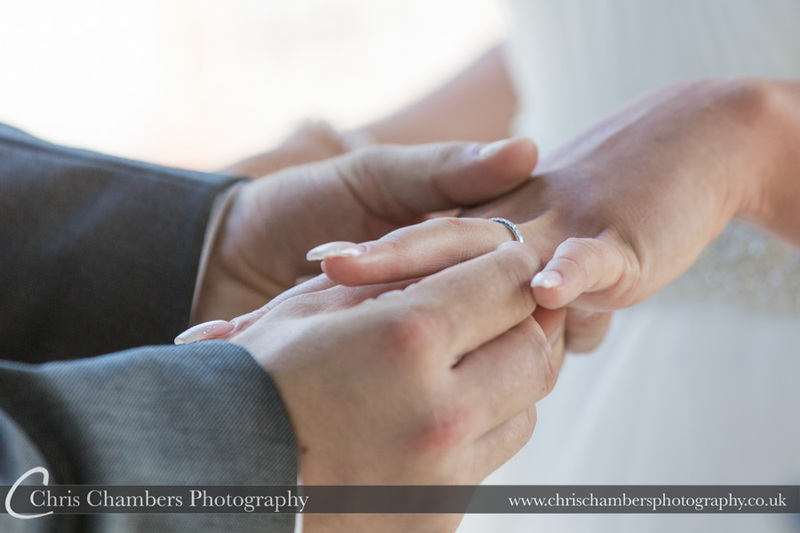 Wedding rings and engagement ring. 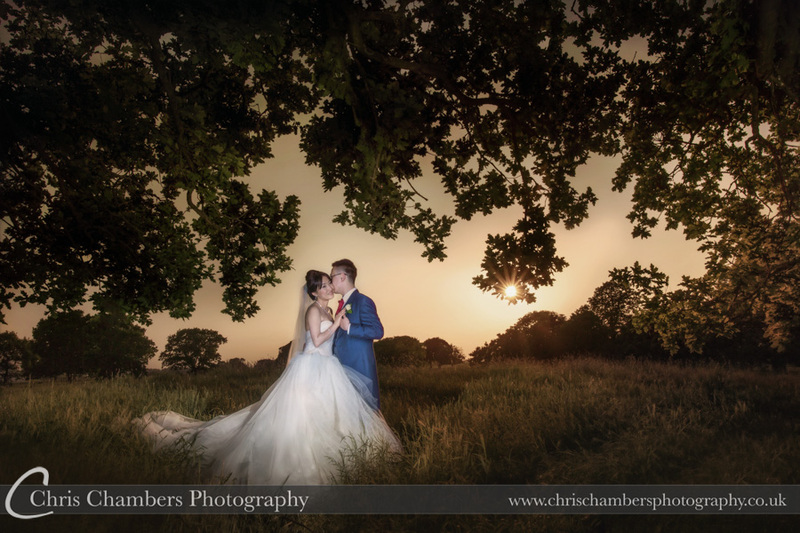 Wedding photography from Chris Chambers. Arrival of the bride and a new watch for the groom. 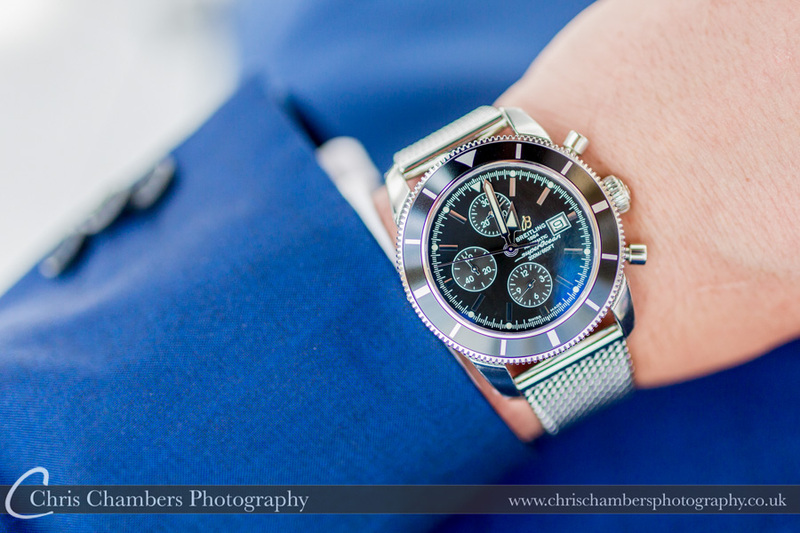 We often see watches given as wedding gifts and where possible we’ll use the watch as part of the wedding day story telling to show the ceremony time or brides arrival time if the two don’t match. 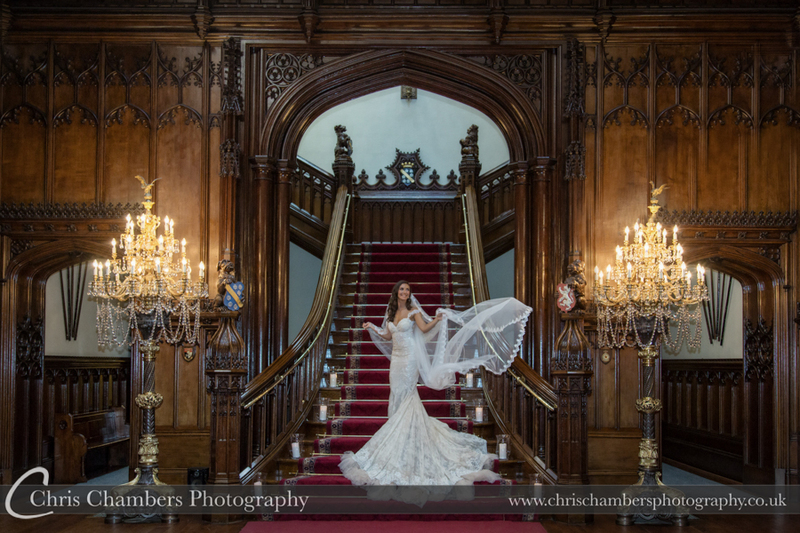 Zoe makes her way down the grand staircase and into the great hall at Allerton Castle. 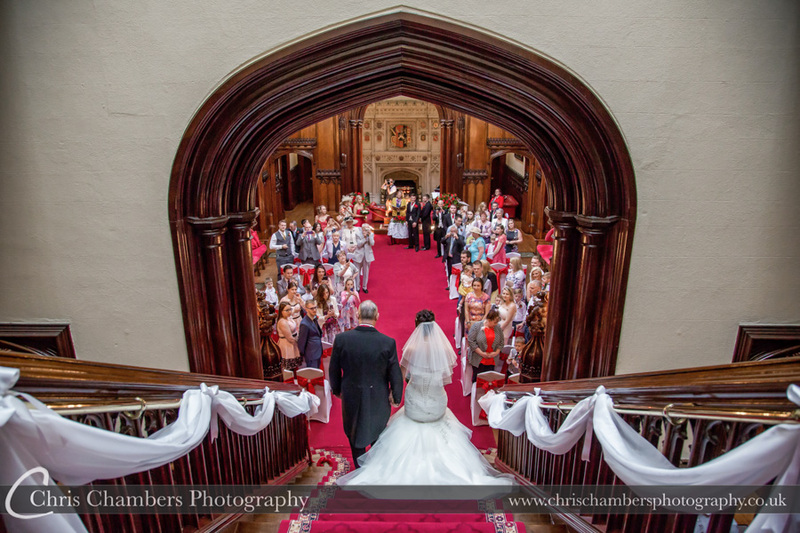 A second photographer working at the back of the ceremony allows us to capture the brides entrance from both the front and the rear. 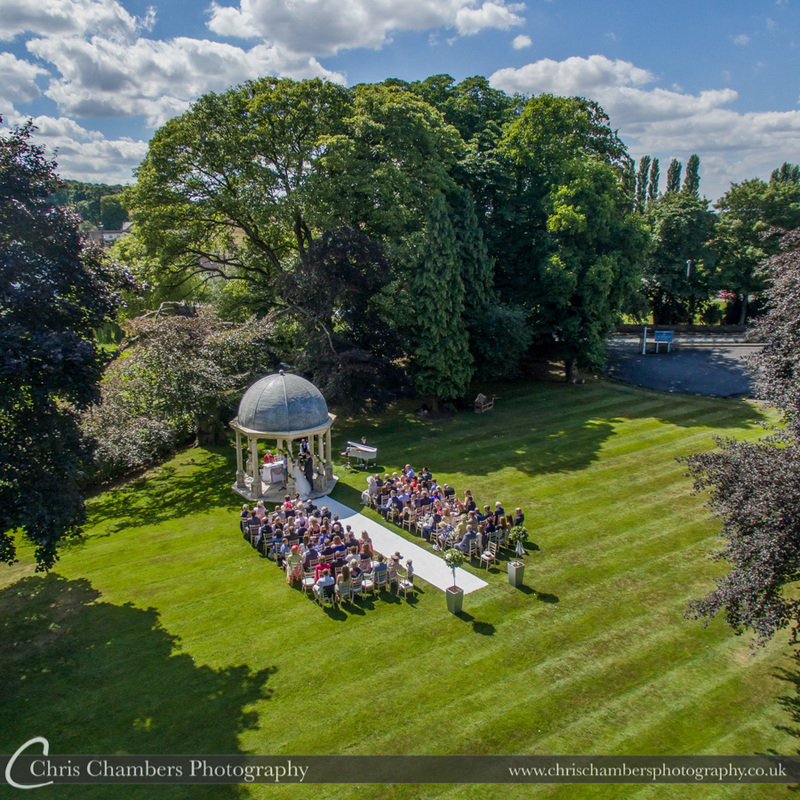 Wentbridge House Hotel wedding ceremony outside in the folly. 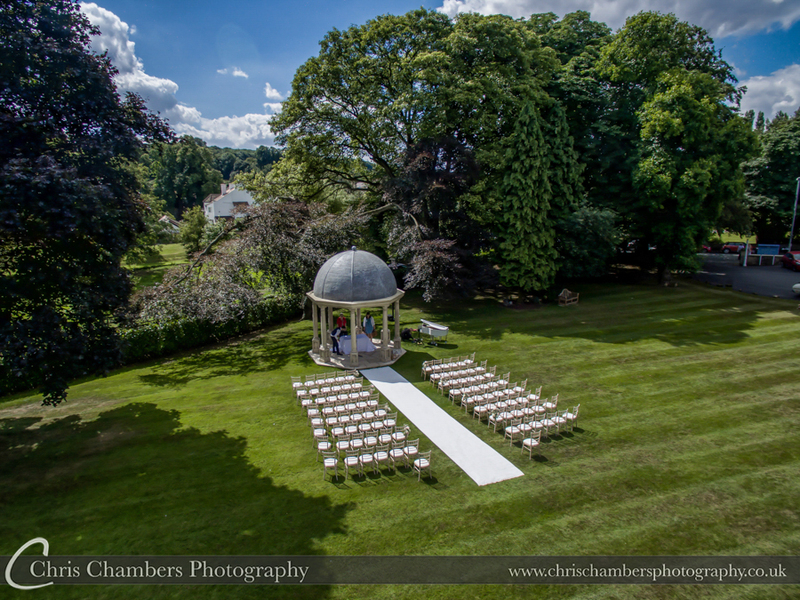 Very few venues have the opportunity to capture an outdoor ceremony in this way, Wentbridge House is fortunate in that it is surrounded by lots of open countryside and no buildings in the immediate proximity of the ceremony location. 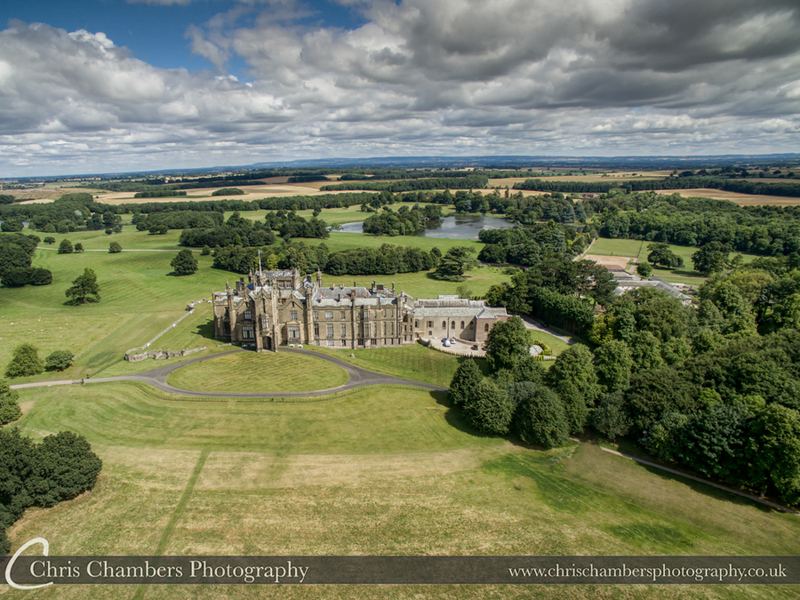 Special permission was obtained before we shot this image using our camera drone. 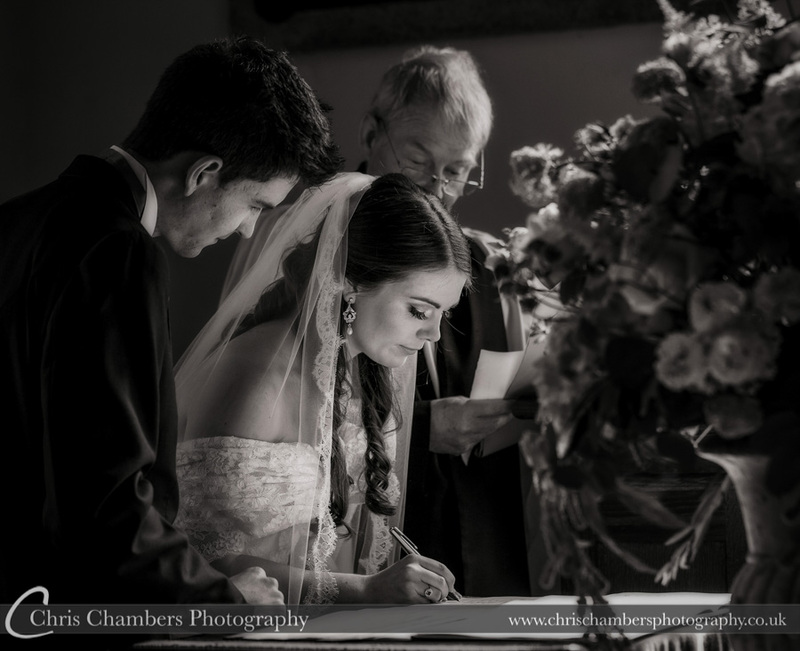 Signing the wedding register at Denton Hall Church. 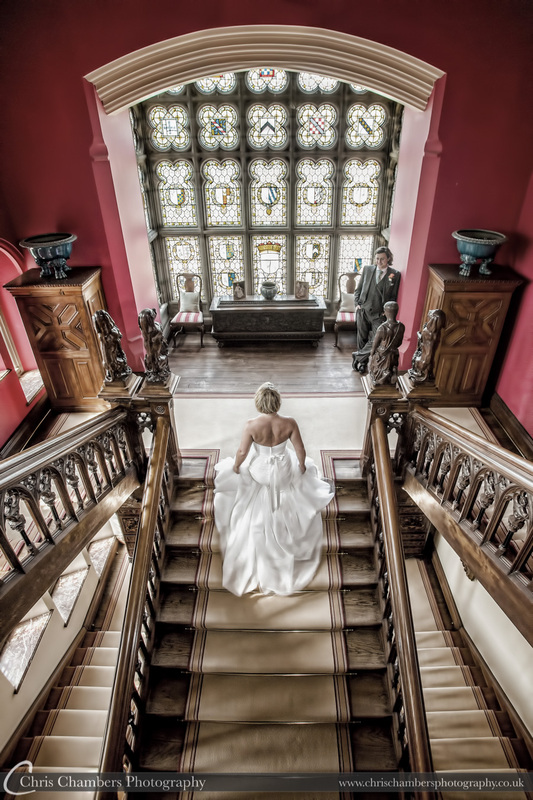 This wedding photograph won a silver with the guild of photographers and also won the overall wedding photo journalistic wedding photo of the year. 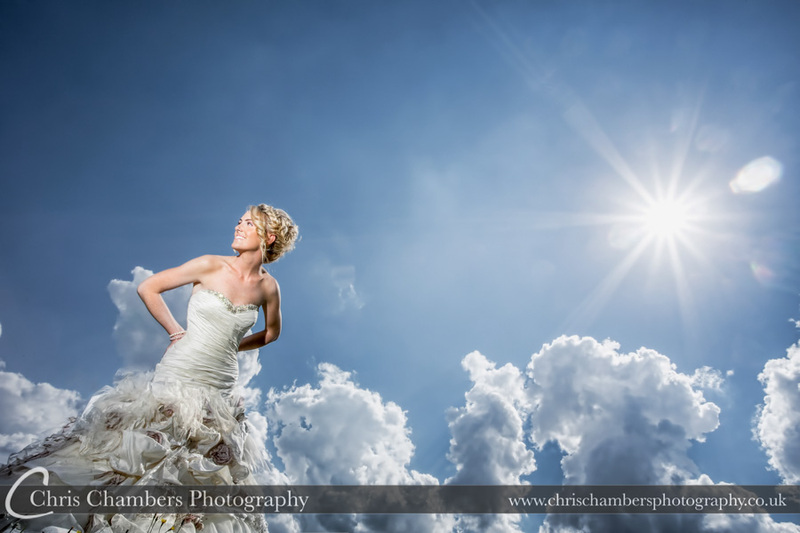 Award winning Yorkshire Wedding Photographer. 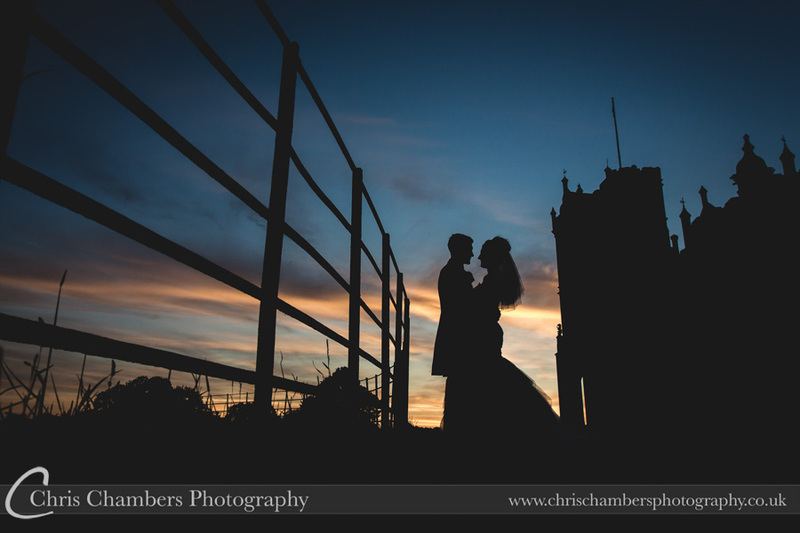 Silhouette wedding photography in Yorkshire. 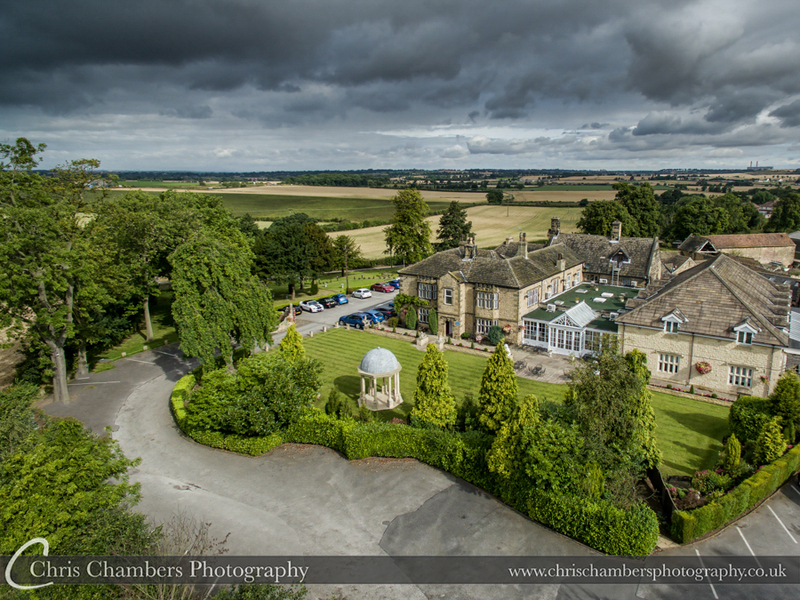 Oulton Hall near leeds wedding of Jacob and Franky. 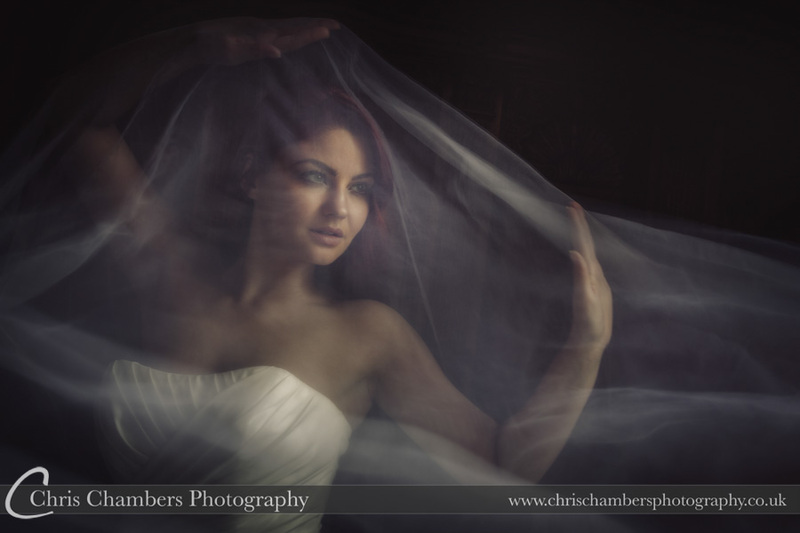 Chris Chambers Photography. Gary and Sally leaving church after their wedding ceremony. 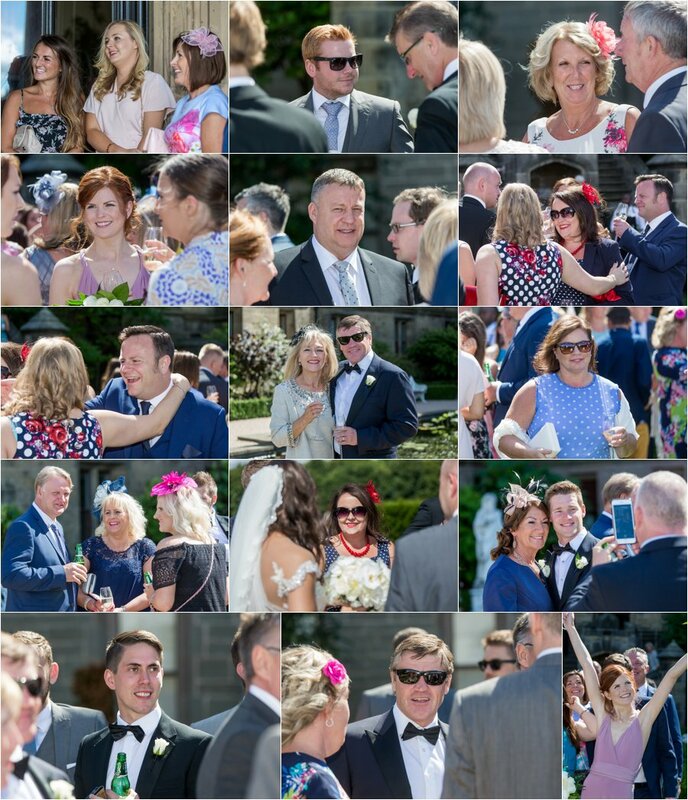 August bank holiday wedding with lots of sunshine, smiling guests and big laughs from the bride and groom. 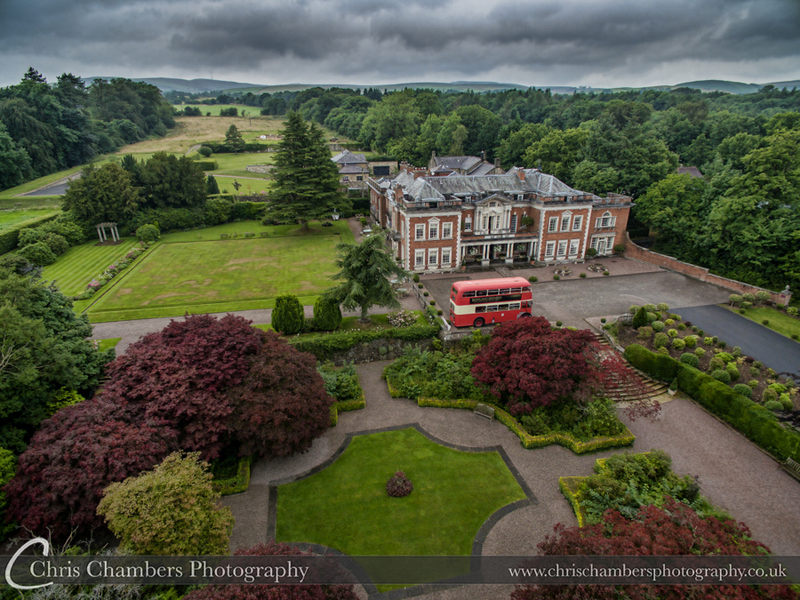 Following church Gary and Sally held their wedding reception at Oulton Hall. 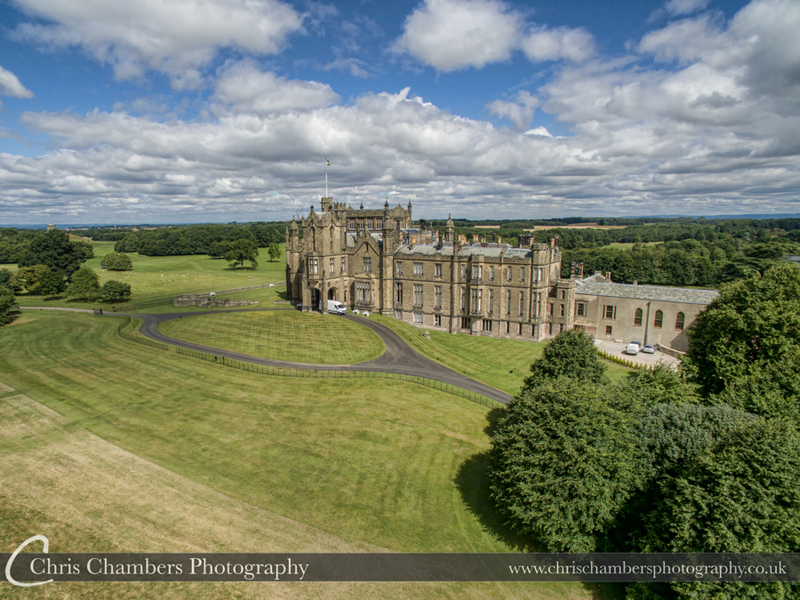 Ripley Castle wedding photography of David and Katie’s wedding. 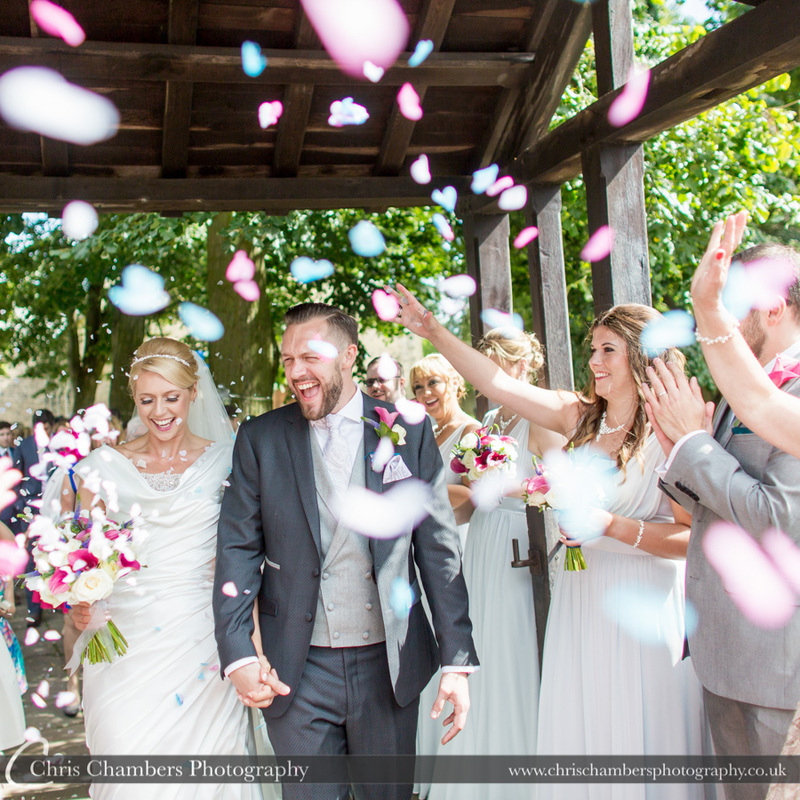 Outside the church and throwing confetti. 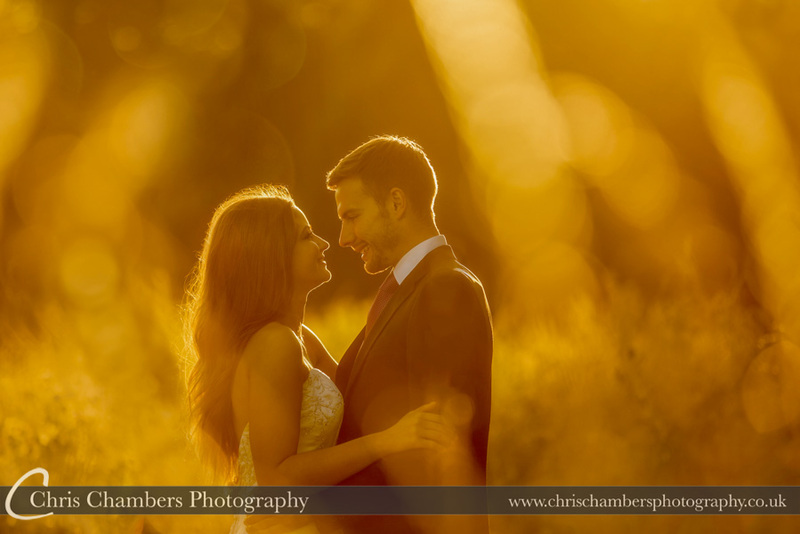 Early autumn low sunshine has added an element of flare to the wedding photograph. 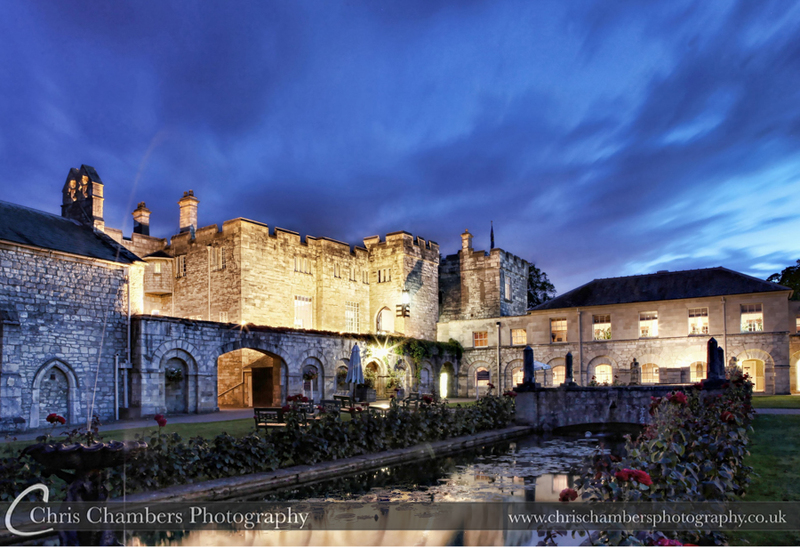 Evening Wedding Photography at Hazlewood Castle, outside in the courtyard. 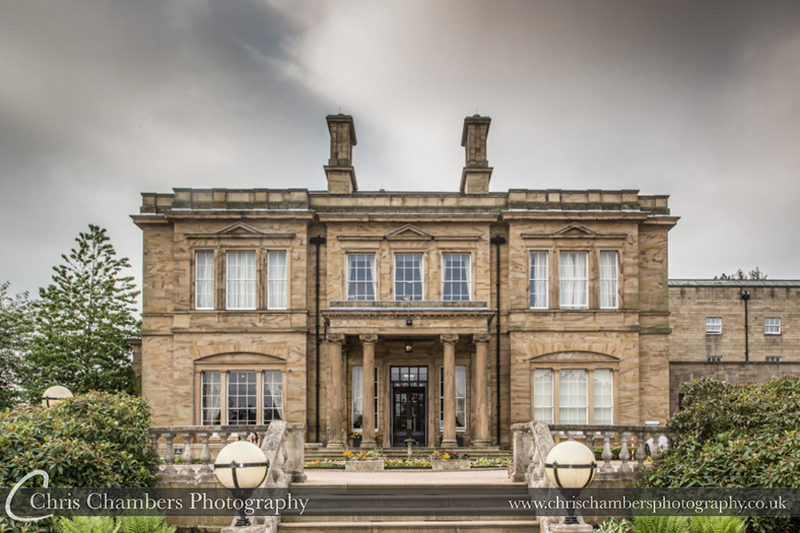 Waterton Park hotel in Wakefield, West Yorkshire wedding photography of the bride and groom. Visit our Facebook page here – be sure to like the page to receive the latest news and updates. 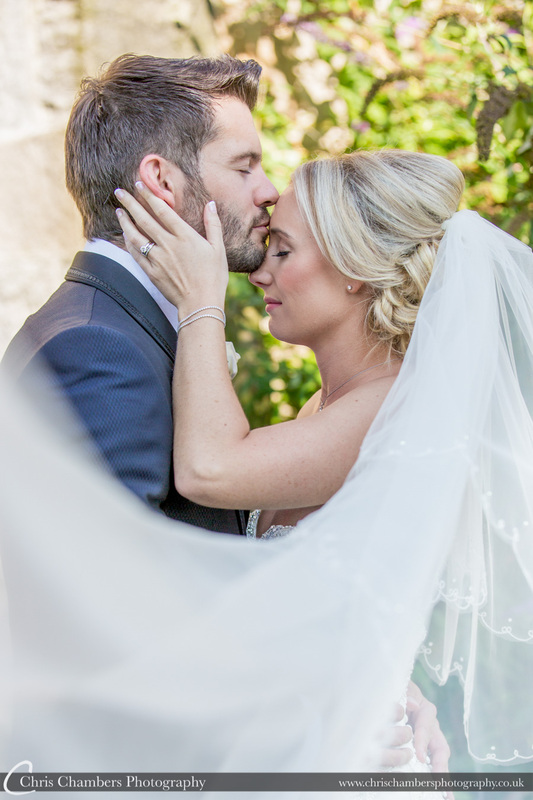 We’ve been busy updating our wedding photography gallery pages and wanted to highlight some of the many wedding photographs we have used. 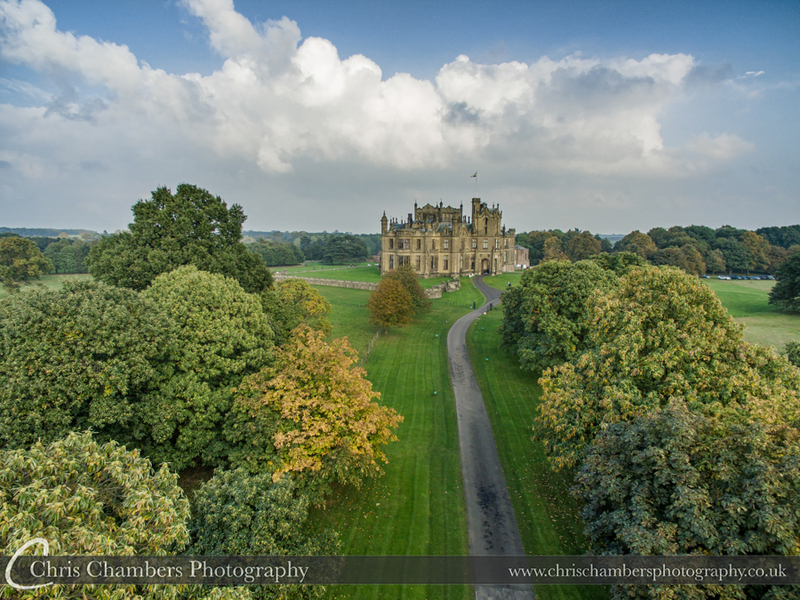 Below is the Second of three blog posts showcasing some of the photographs in our new galleries, many of these haven’t been seen on the website before. 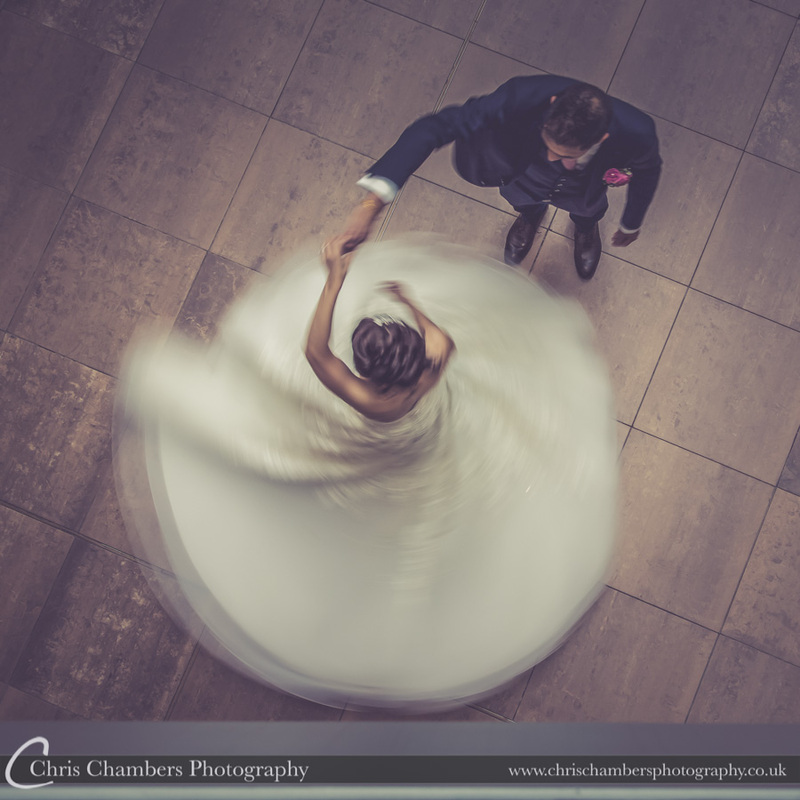 This wedding photography blog post includes bride and groom wedding photographs from weddings in and around Leeds, Wakefield and Yorkshire with a few a little further afield. 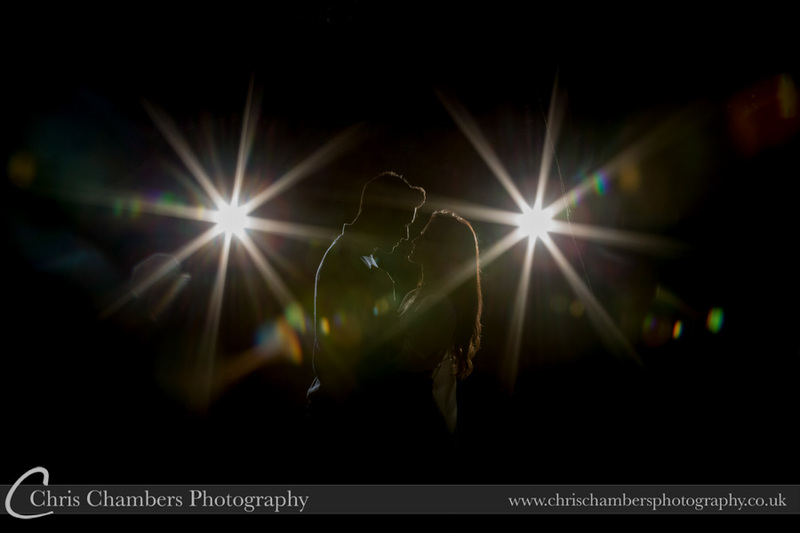 We’ve also aded a couple of pre-wedding shoot photographs for good measure. Please feel free to pin these images on Pinterest or share this post on Facbook. We do have a Facebook page here – be sure to like the page to receive the latest news and updates. 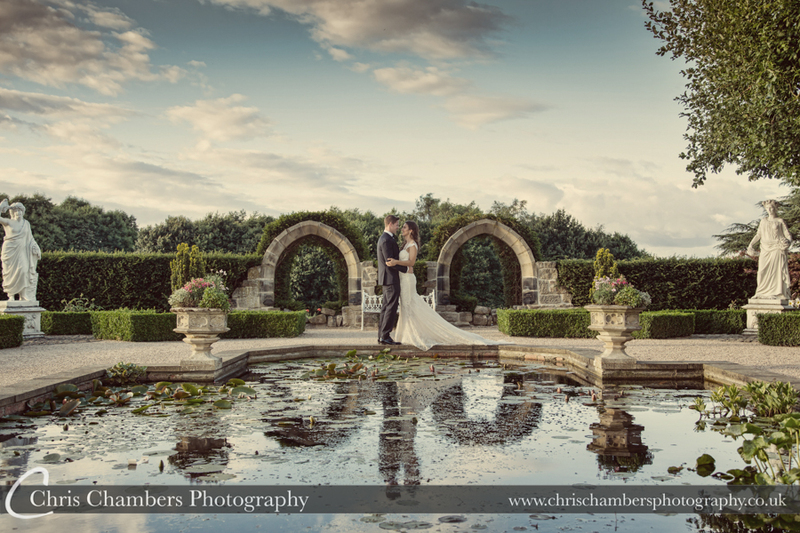 Chris and Leanne at Hazlewood Castle. This wedding photograph caused quite a stir when it went viral in September 2015. 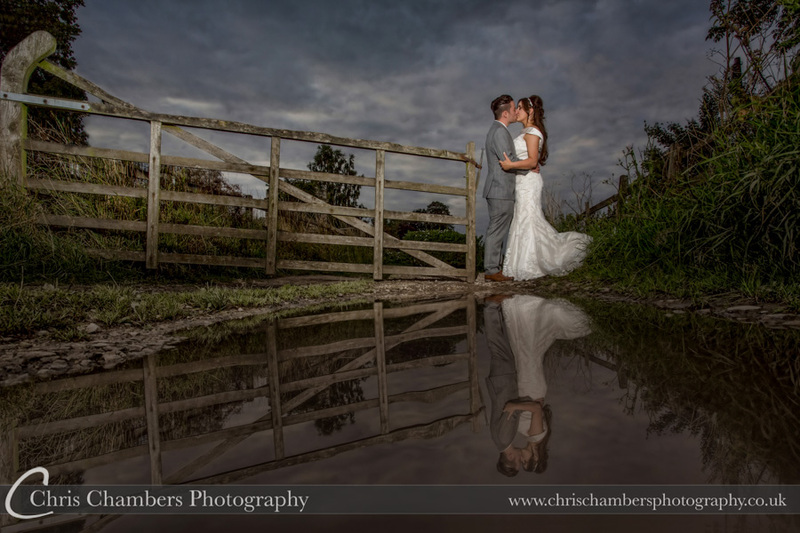 The low camera angle and extra wide lens has exaggerated the size of the puddle creating a stunning reflection as they kiss by the gate. 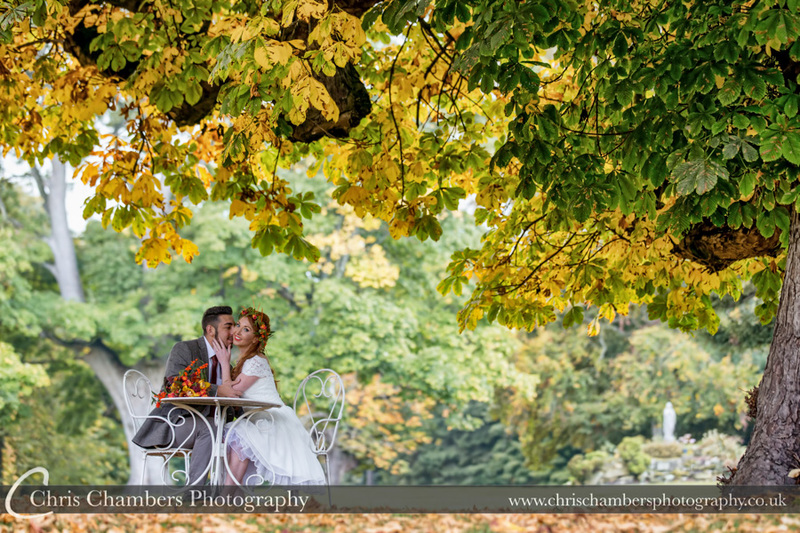 This photograph made superb double page spread in their storybook wedding album. Bagden Hall late March. 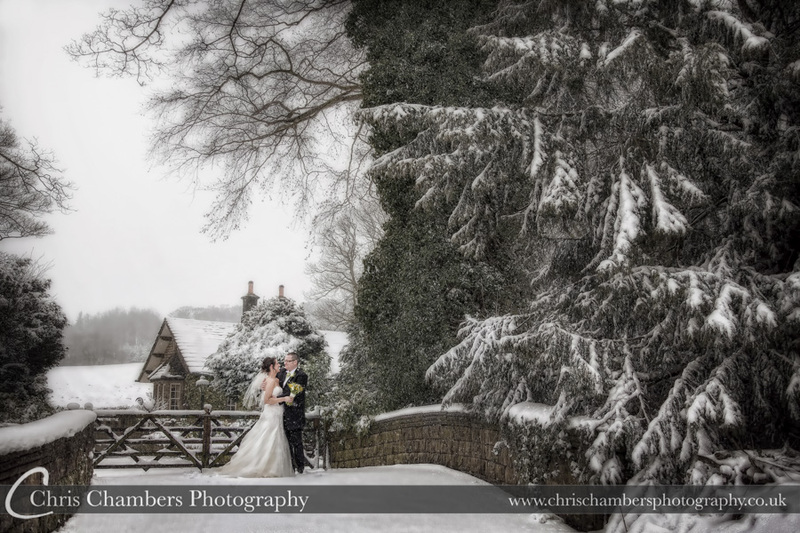 Looking like a scene on a Christmas Card Mark and Laura ventured out of their wedding venue (Bagden Hall near Huddersfield West Yorkshire) for a series of wedding photographs. 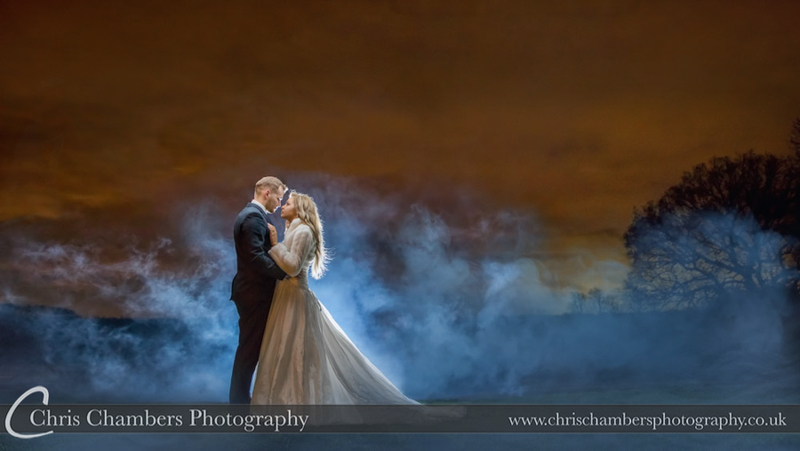 With snow on the ground we were working quickly and keeping laura warm between photos but it was worth the effort and this image along with a number of others were featured large or as double page spreads in their wedding album. 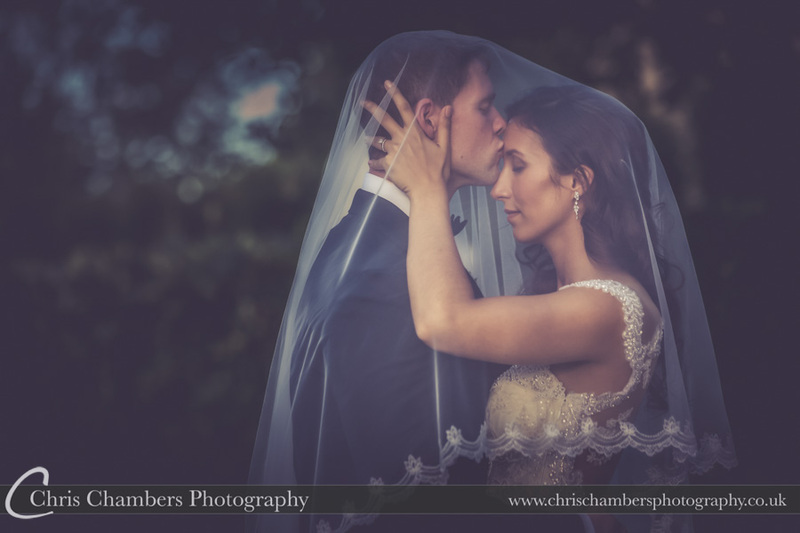 We love a long veil! 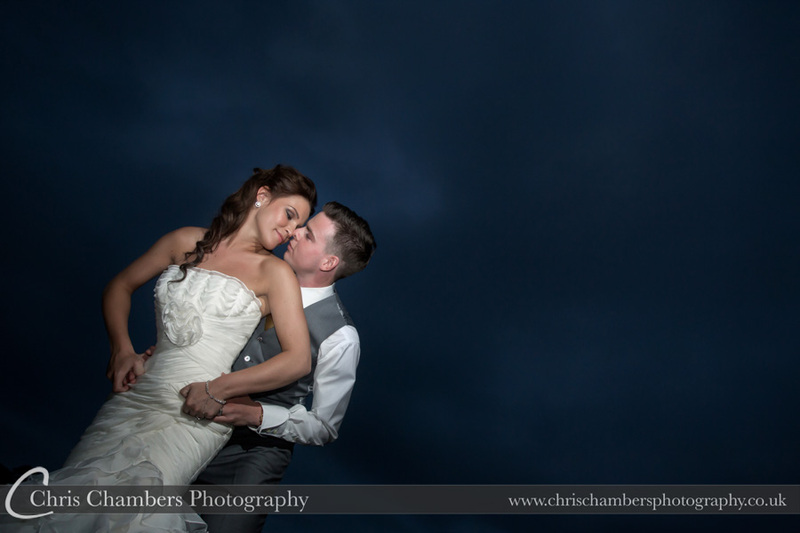 This wedding photograph of Emily and Dave was taken on a windy day just after sunset. 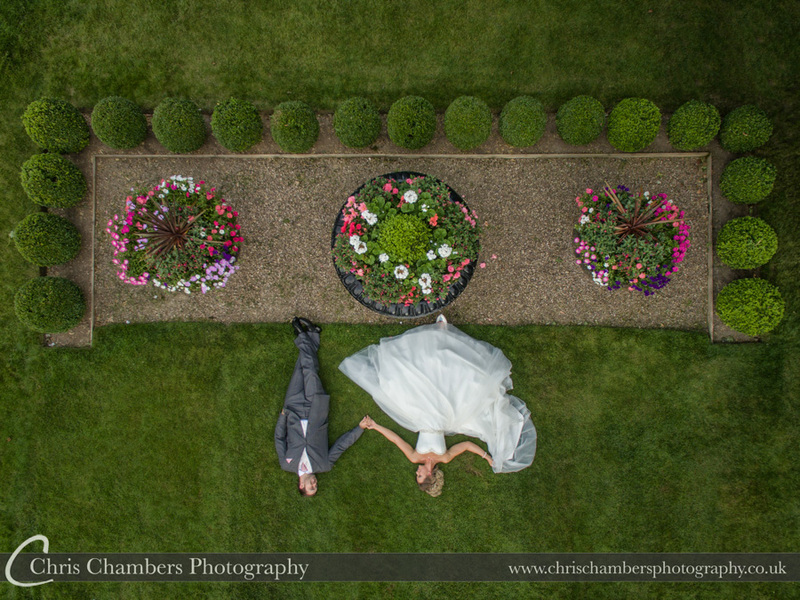 Rebecca and Rob outside Carlton Towers East Yorkshire. 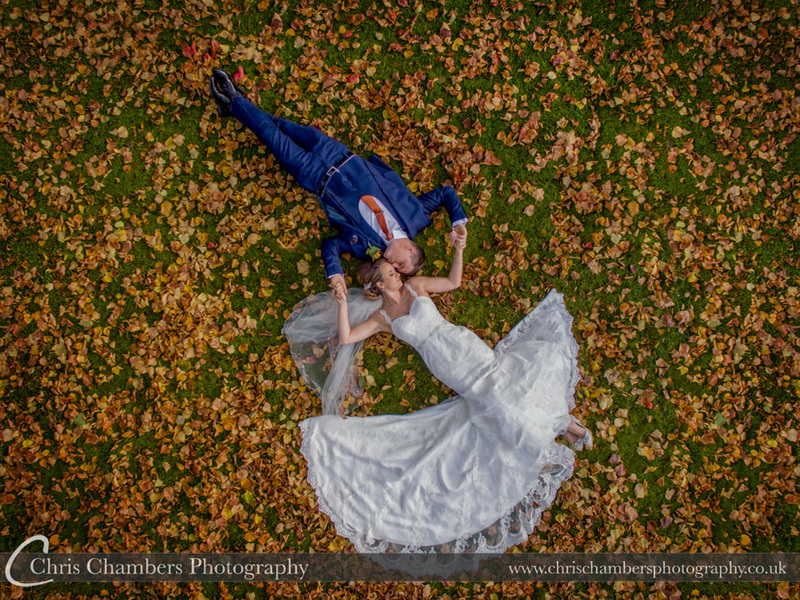 This wedding photograph took a little organising and choreography with the helicopter pilot. Rob had arrived the helicopter and it stayed for the ceremony allowing us to photograph it’s departure and try and involve our bride and groom along with Carlton Towers in the background. 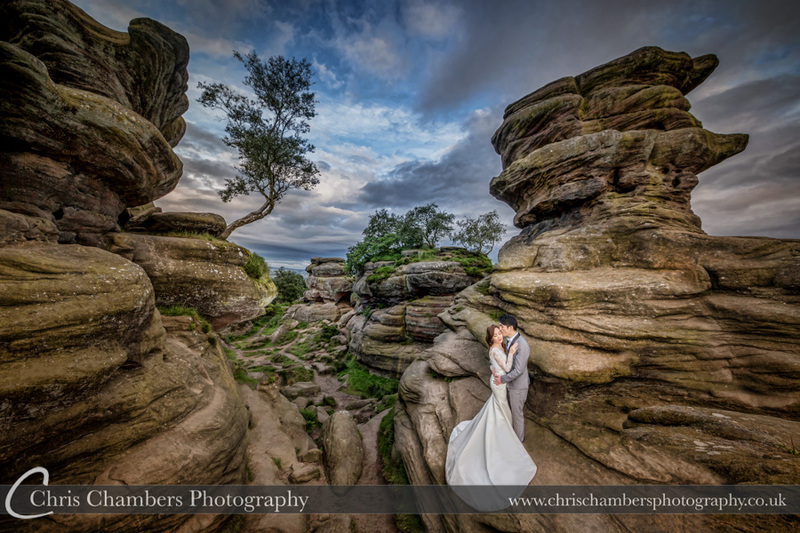 An early morning pre-wedding photo shoot at Brimham Rocks in North Yorkshire. 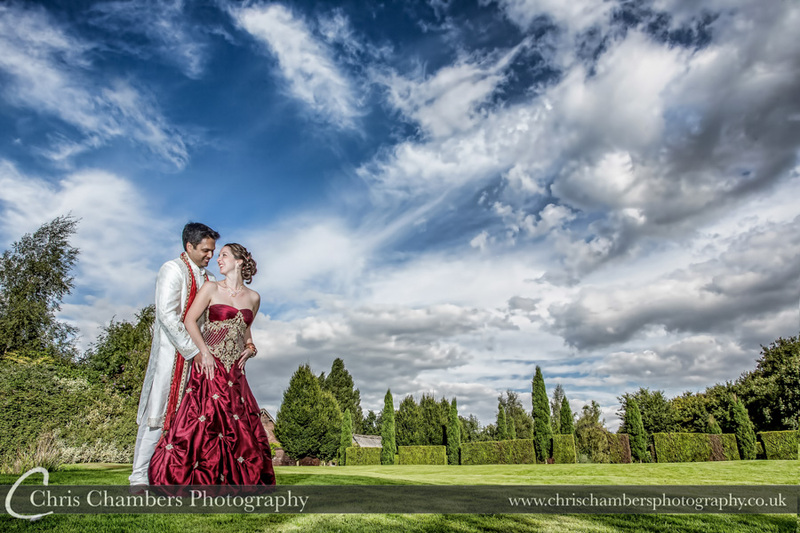 Pre-wedding shoots are included with all or wedding photography packages. 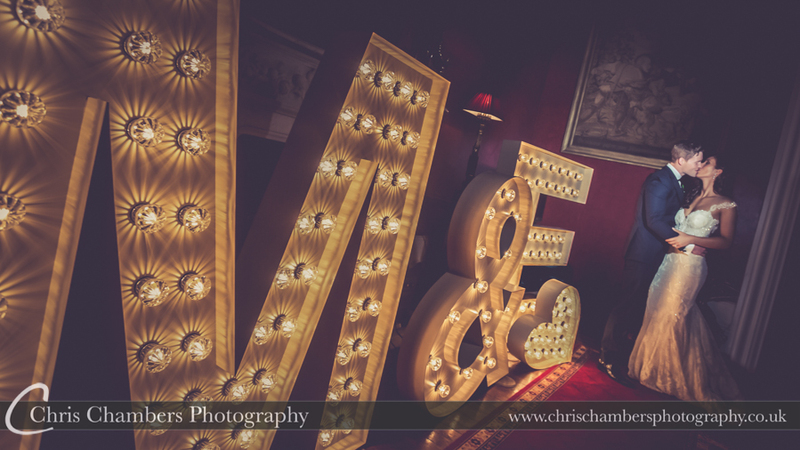 Full details can be found on our pre-wedding shoot page. 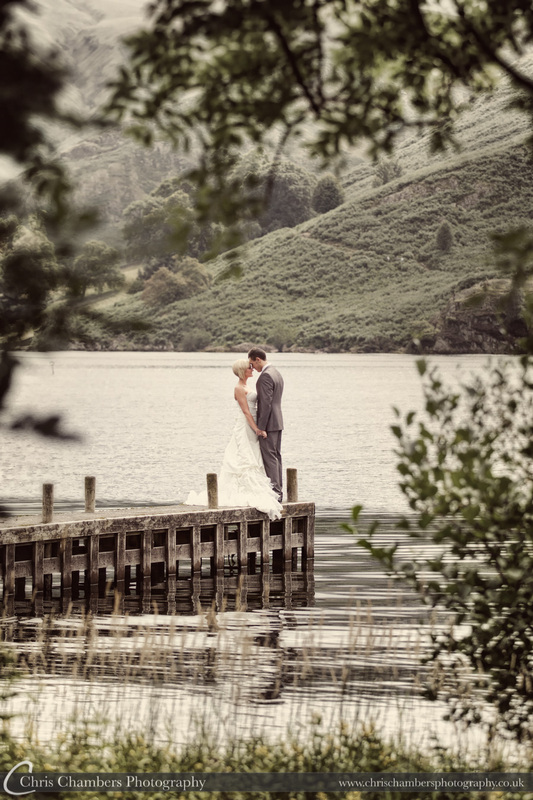 The Lake District is one of our favourite locations, both for wedding and landscape photography. Big mountains, Jetties and lakes make the perfect combination. 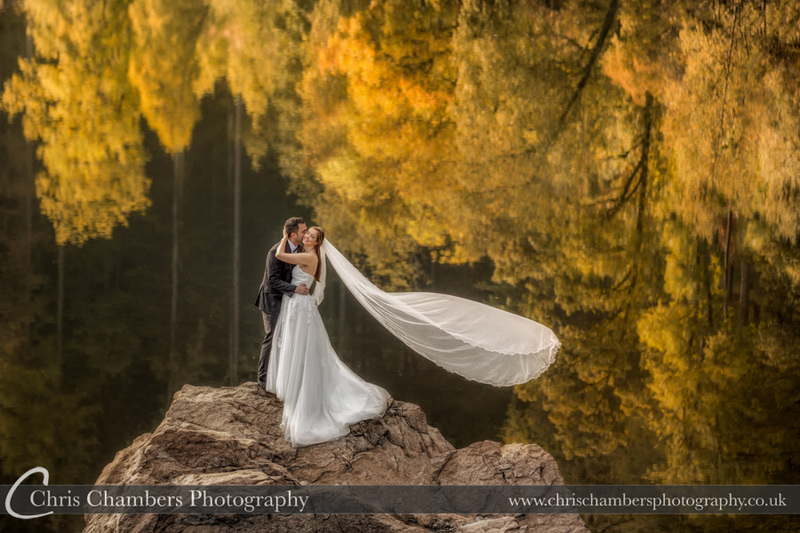 This photograph was taken on the shores of Ullswater near Glennridding. The piers at Whitby. 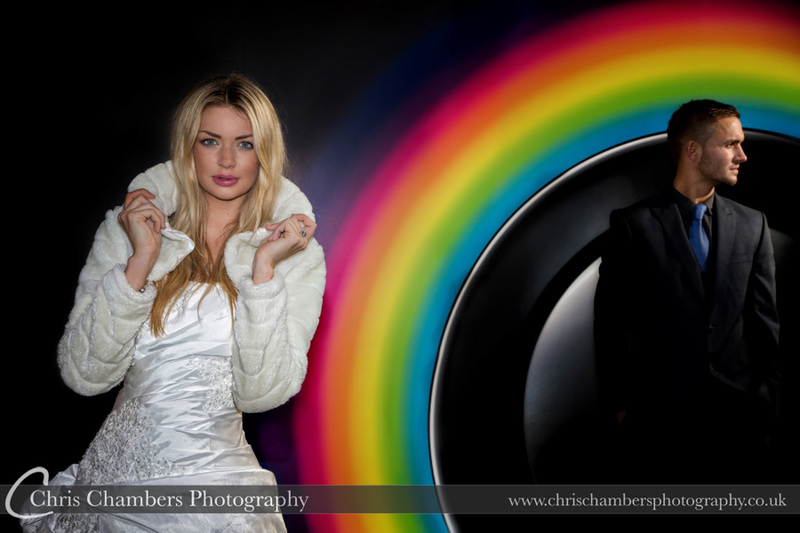 This is an image we shot as part of one of our workshops. Each year we try and run a training course in Whitby. Heavy rain the night before has helped create a series of puddles adding reflections of Sarah and the lighthouse. Kristy on the rear steps at Allerton Castle North Yorkshire. 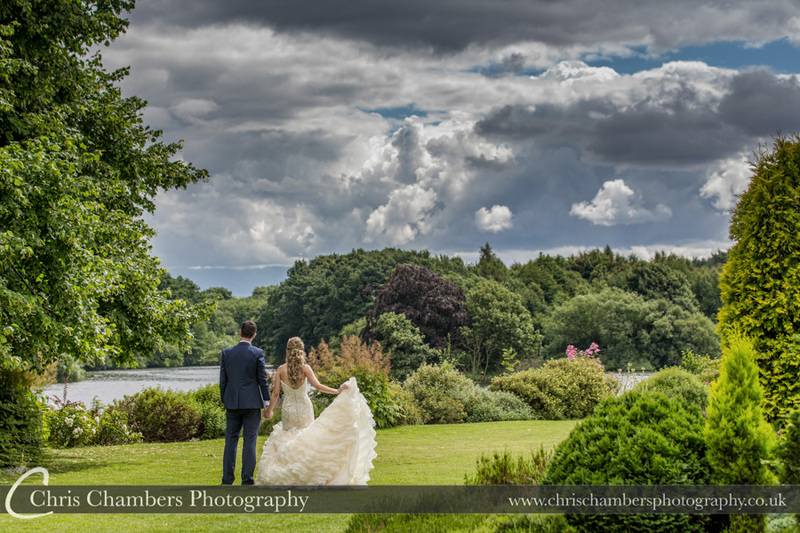 The wedding day had been a mix of bright sunshine and heavy summer showers. 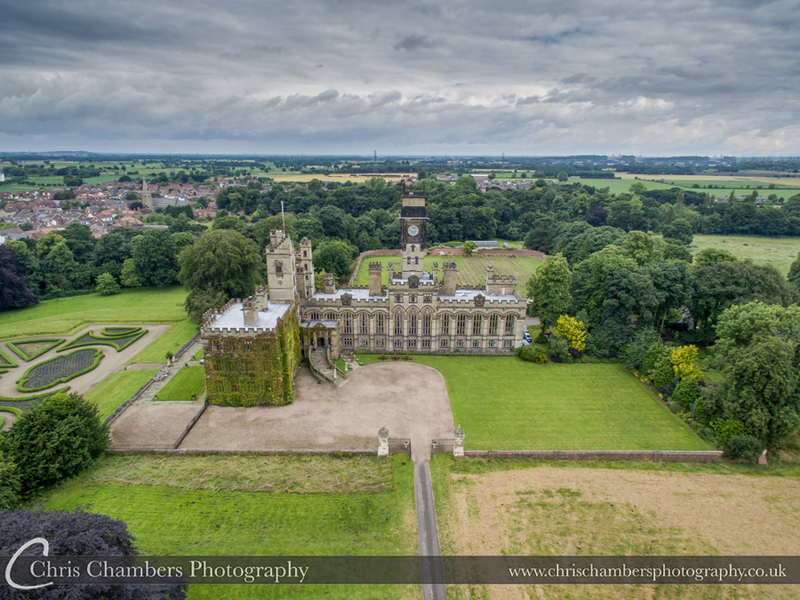 We managed to head outdoors to capture a number of bride and groom photographs with Allerton Castle in the background against the stormy skies, the rainbow was a nice bonus. 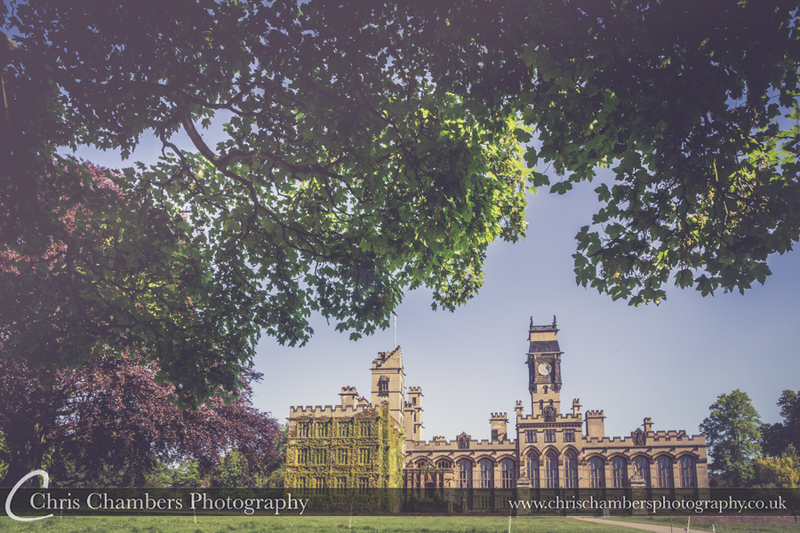 Allerton Castle wedding photography from Chris Chambers, award winning wedding photographer. 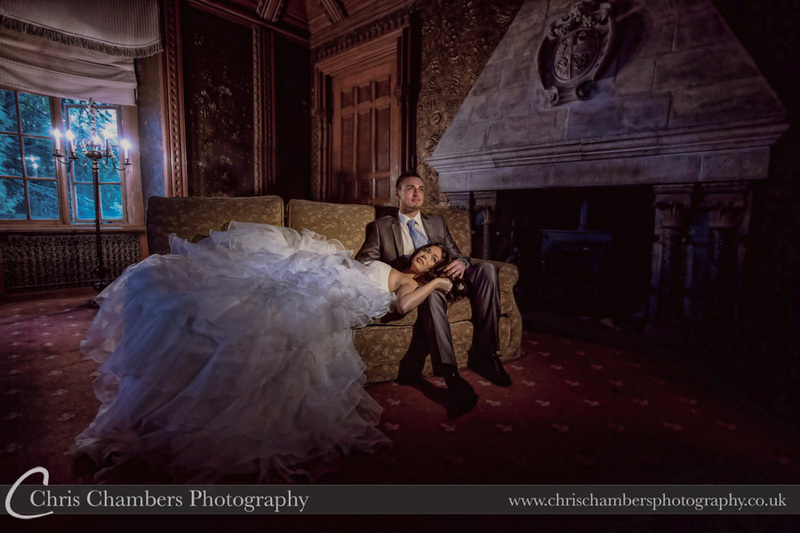 The Victoria room at Hazlewood Castle is always a great location for wedding photographs of the bride and groom. 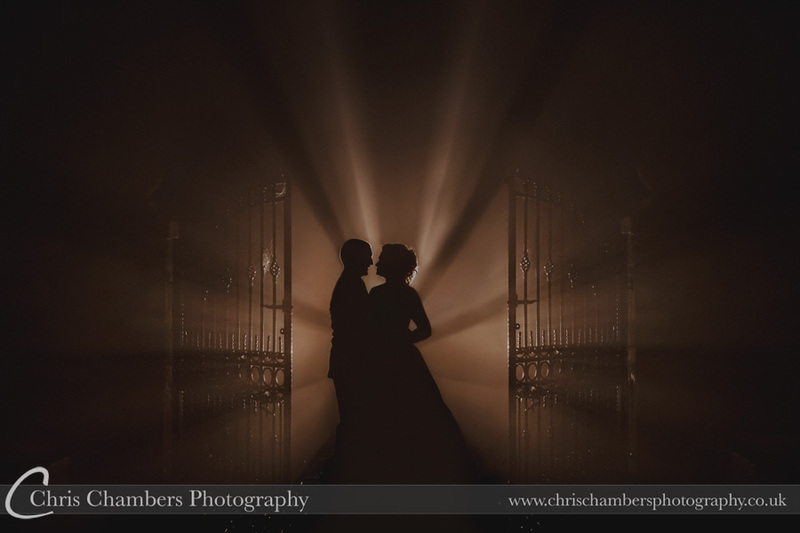 The dark interior at first glance may not seem the ideal location but mixed with some creative lighting we can produce stunning wedding photographs. 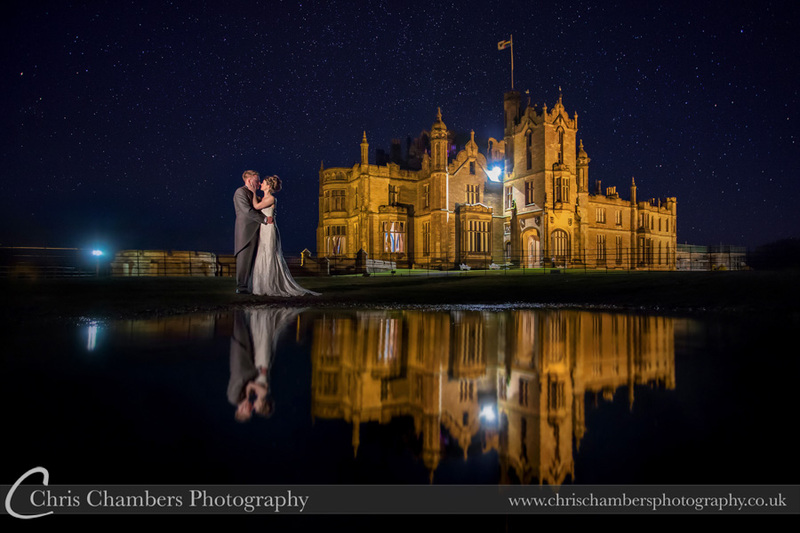 Carlton Towers wedding photography. 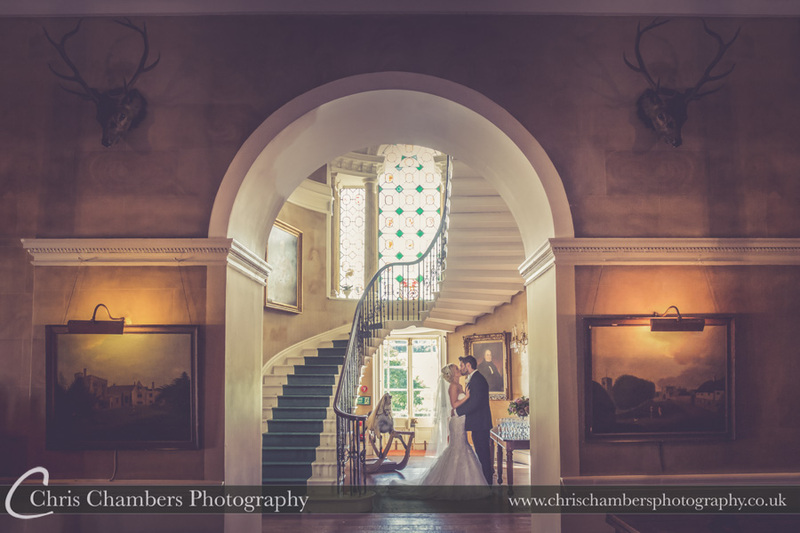 The staircase at Carlton Towers is a must use location on any wedding day. 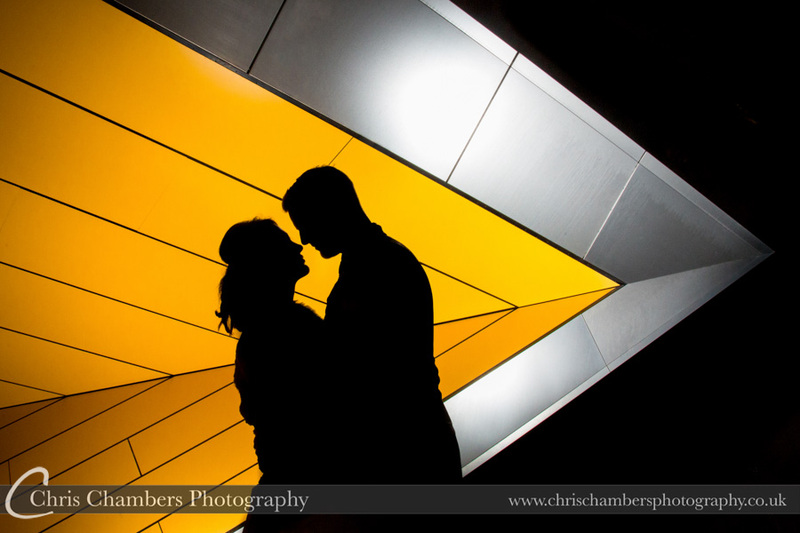 Urban locations work well too, this photographs was taken in Leeds city centre as part of our urban wedding photography workshop. A fusion wedding mixing Indian and Western traditions for this wedding at Newton House Barns in Nottinghamshire for Jenna and Roshan. 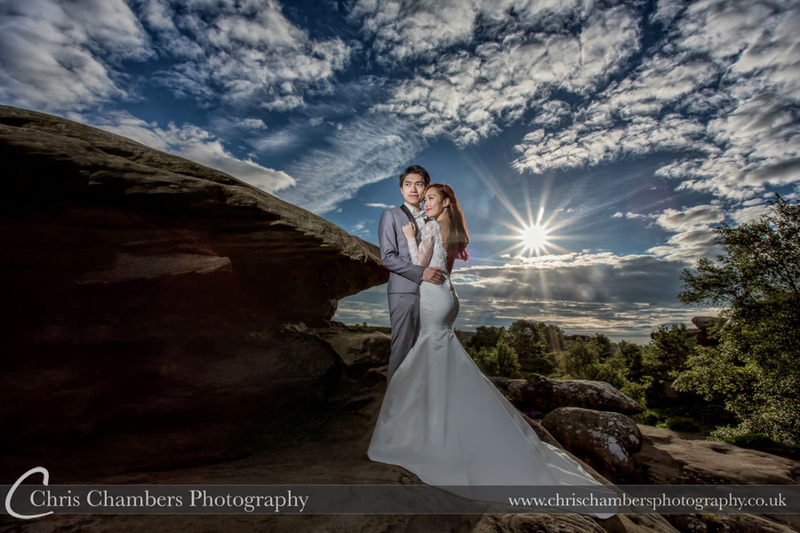 We love the viewpoint on this photograph of Lucy and Wayne outside the Craiglands in Ilkley North Yorkshire. 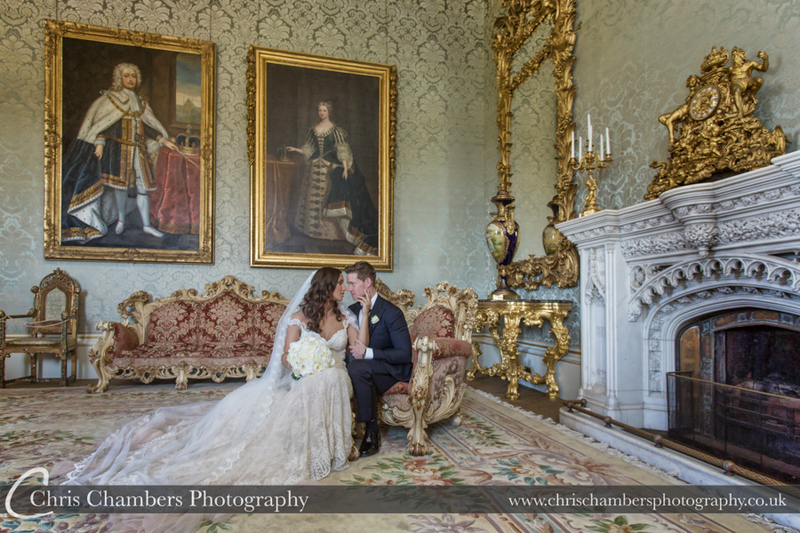 Hodsock Priory wedding photography, Wes and Sam inside Hodsock Priory. 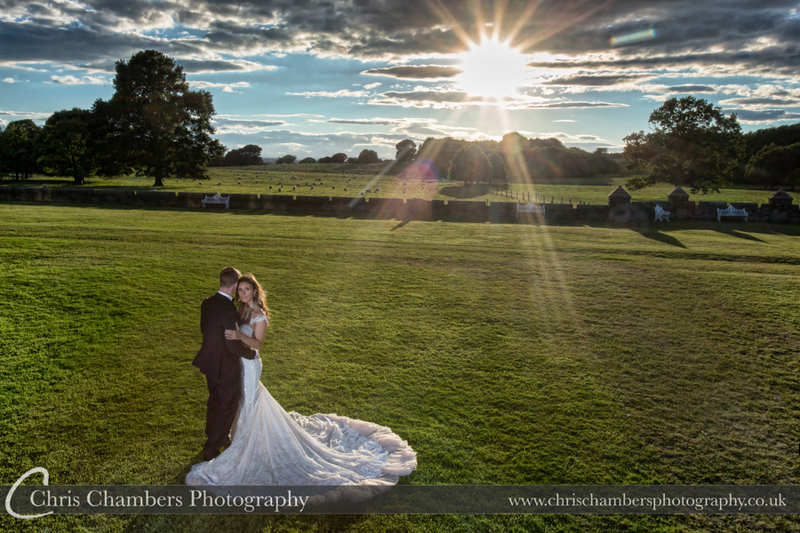 Kings Croft near Pontefract, although this wedding photograph could have been taken at many different wedding venues. 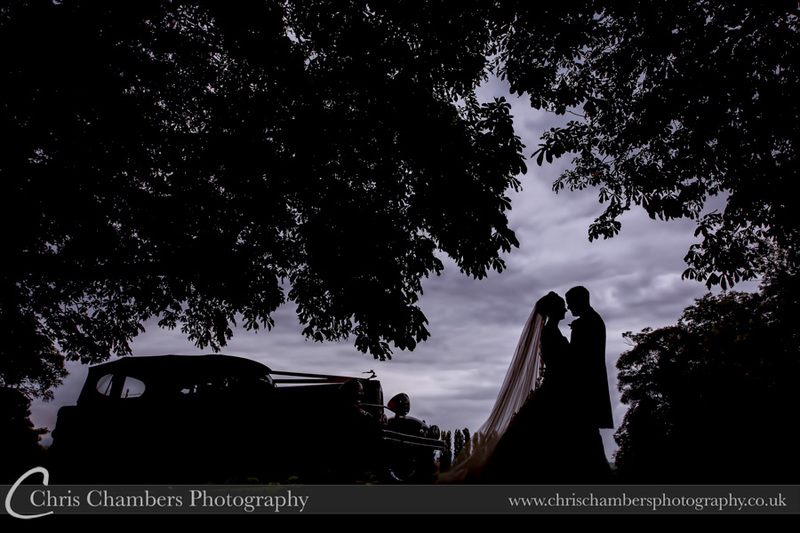 Bride and groom with their wedding car silhouetted against the rain filled clouds. 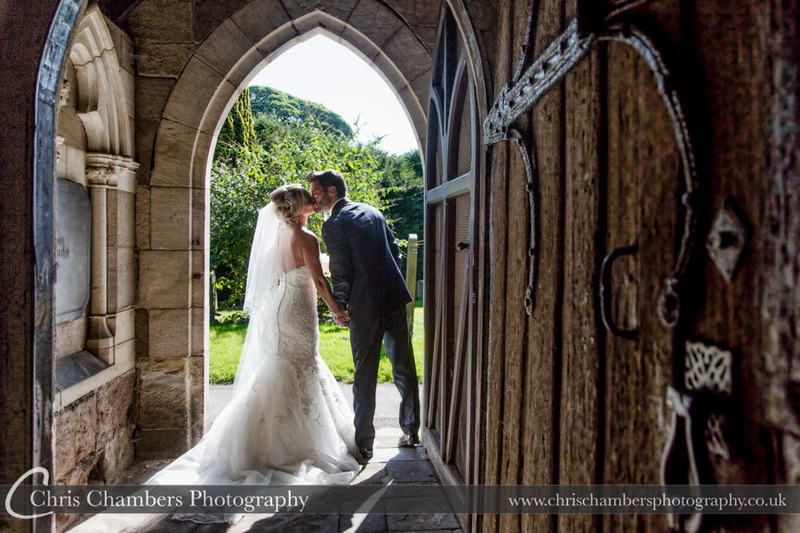 Horbury Church near Wakefield West Yorkshire for this wedding photograph of Emma and Mark. 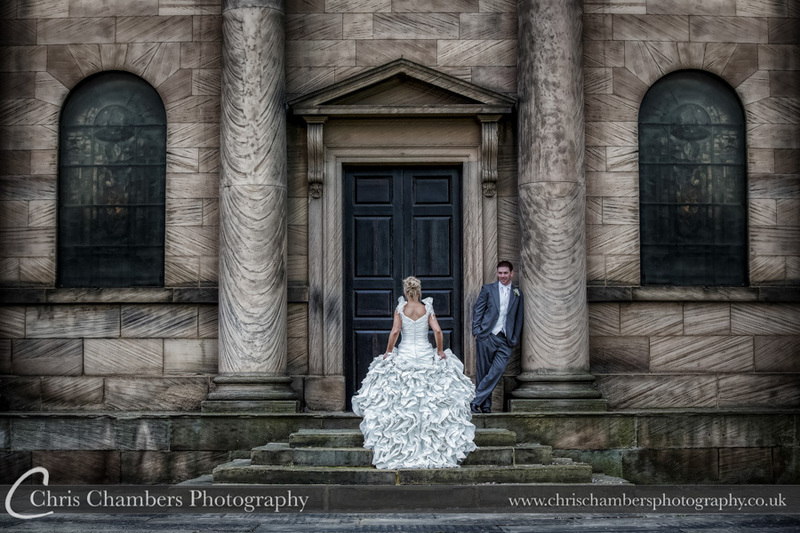 We wanted to capture the detail in the back of Emmas dress and also the stone work and features of the church they were married in. 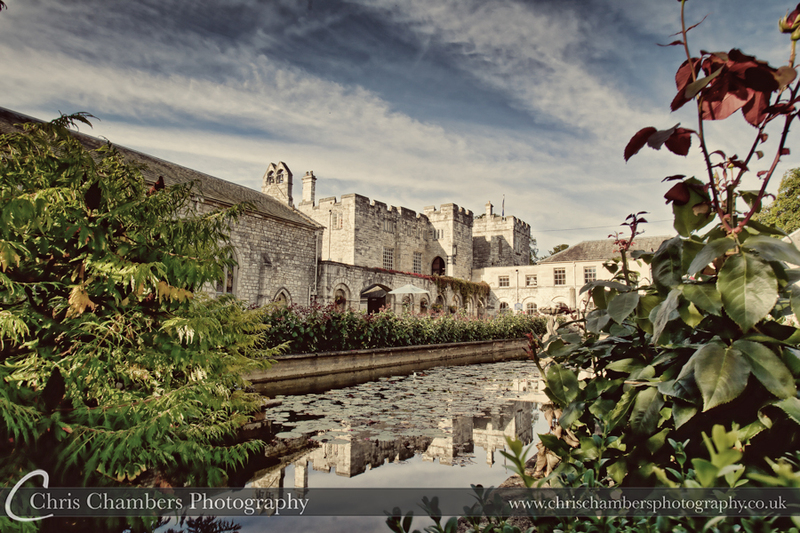 In the courtyard at Hazlewood Castle. We were trying to create something different with this photograph and the results are literally a happy accident! 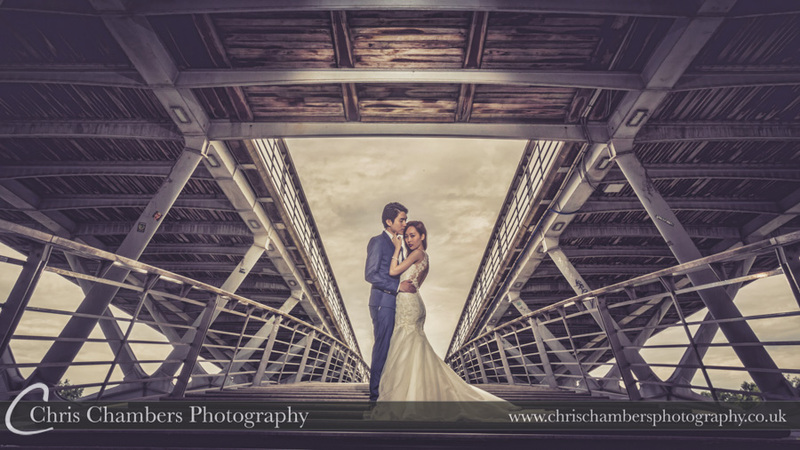 Paris offers so many locations and backdrops for creating amazing photographs. 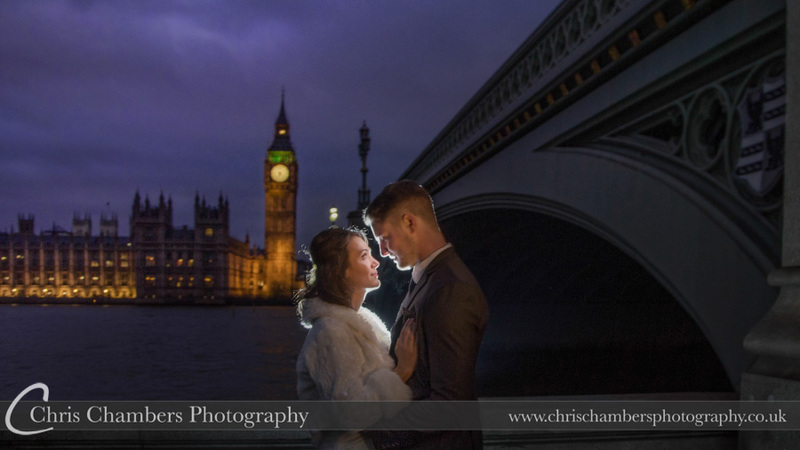 This photograph is from a pre-wedding shoot taken early morning before the crowds gathered. Reflected trees and a rock by the lake side make it look like the photograph was taken on the top of a mountain. Thirlmere in Lake District early autumn. 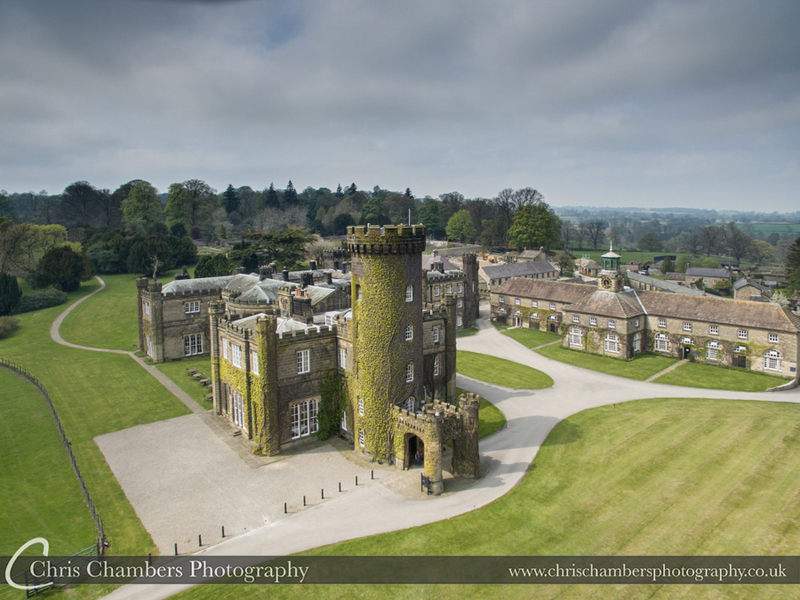 Hazlewood Castle ,Yorkshire wedding photography. 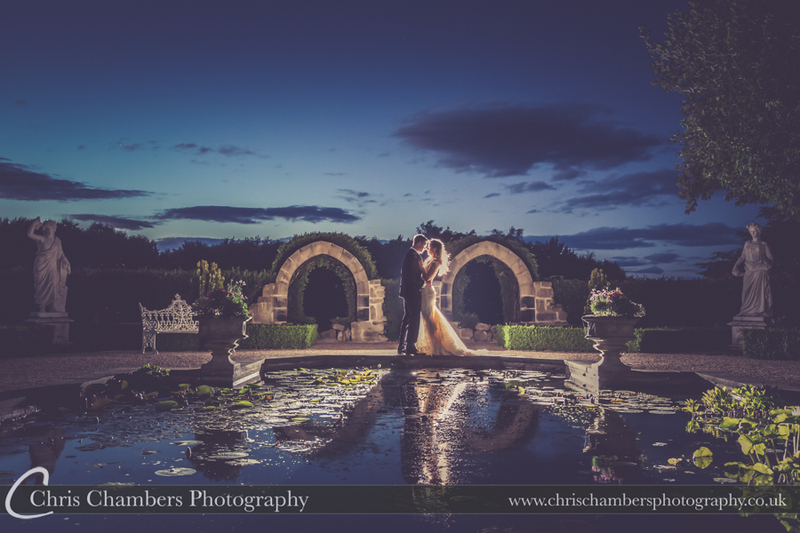 Summer evening at Hazlewood Castle. A lower view point in the Flemish Hall at Hazlewood Castle. 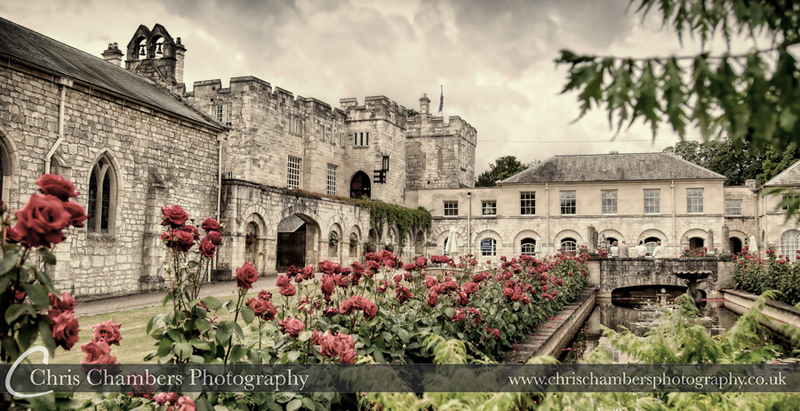 We are proud and pleased to be a recommended Hazlewood Castle wedding photographer. 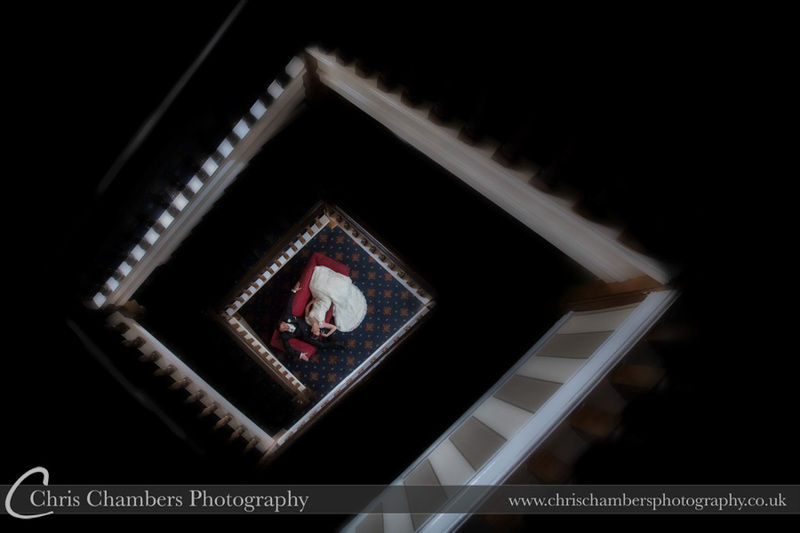 A top down view form the staircase at Walton Hall near Wakefield. 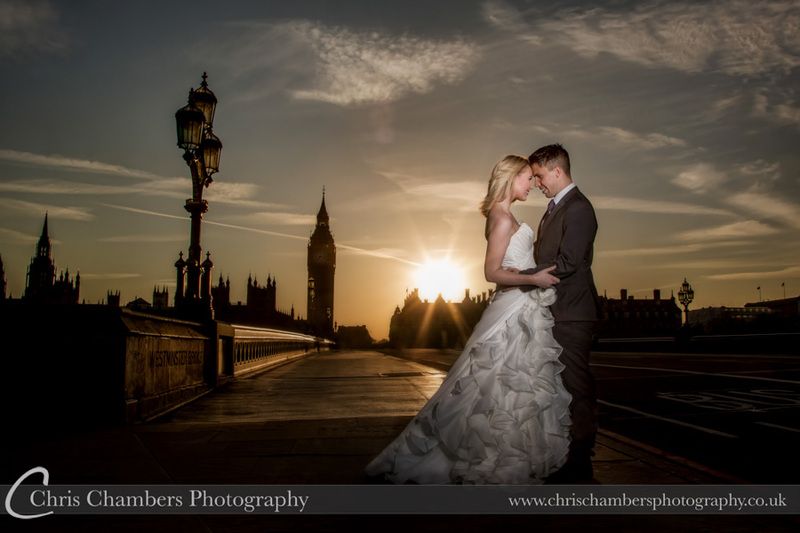 A low sun at the start of the day for this bride and groom image. 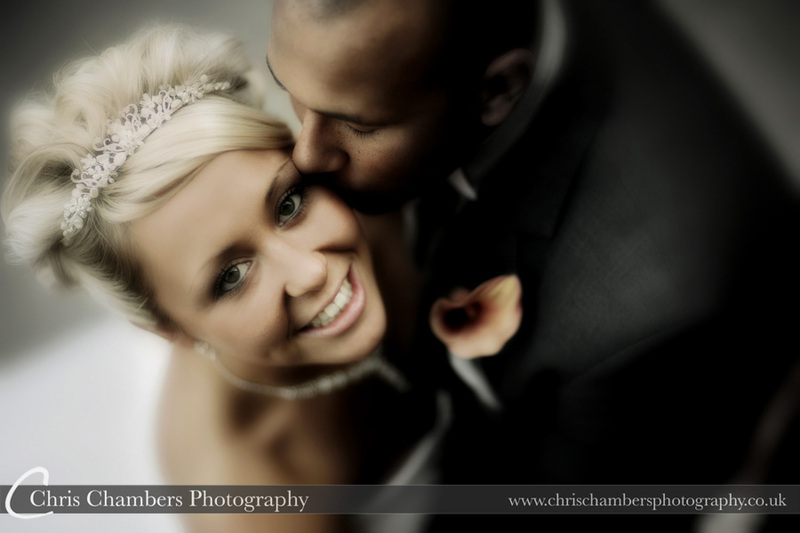 This wedding photograph of Matthew and Elles was used as the front photo cover for their wedding album and parent albums. 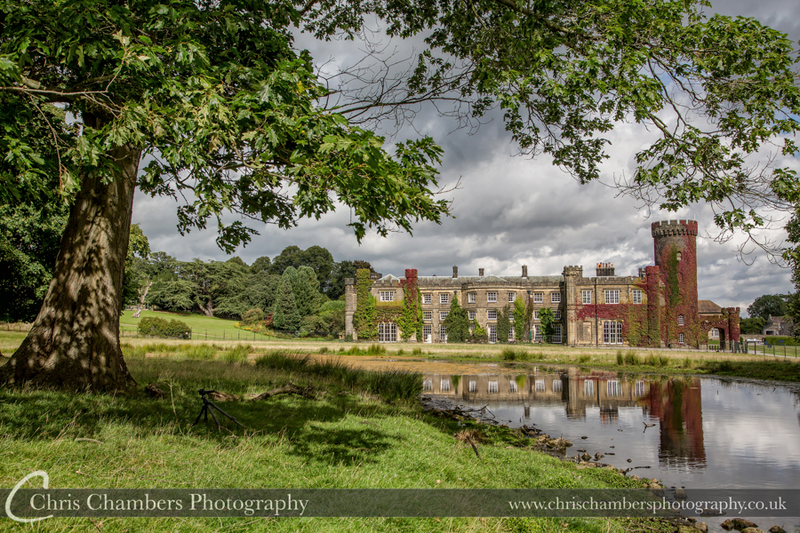 Taken in the grounds of Allerton Castle North Yorkshire. 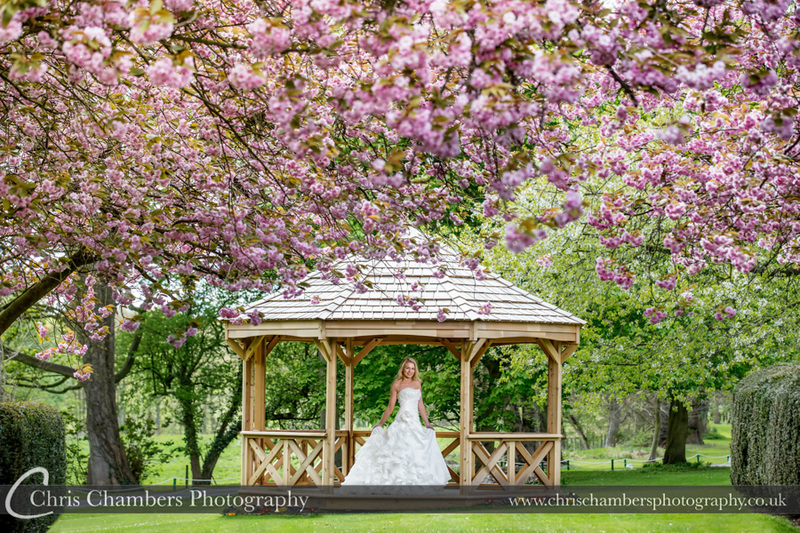 Under the blossom and pagoda at Hazlewood Castle. 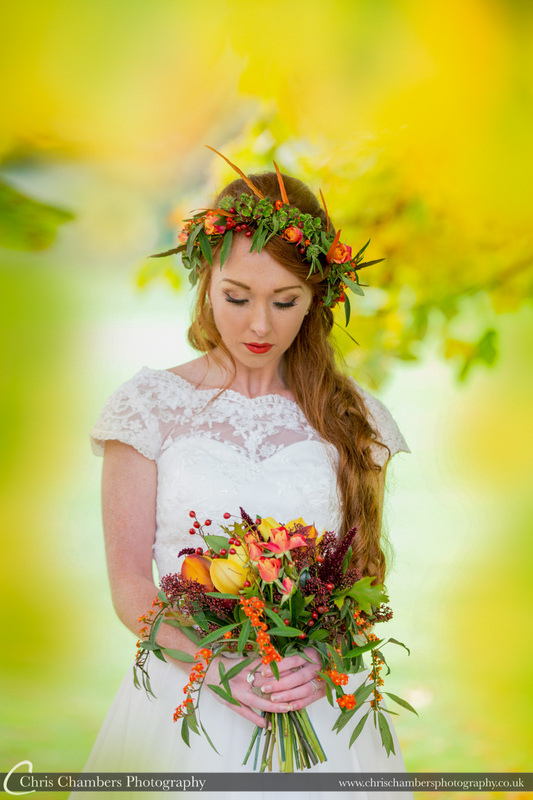 A simple bridal portrait. 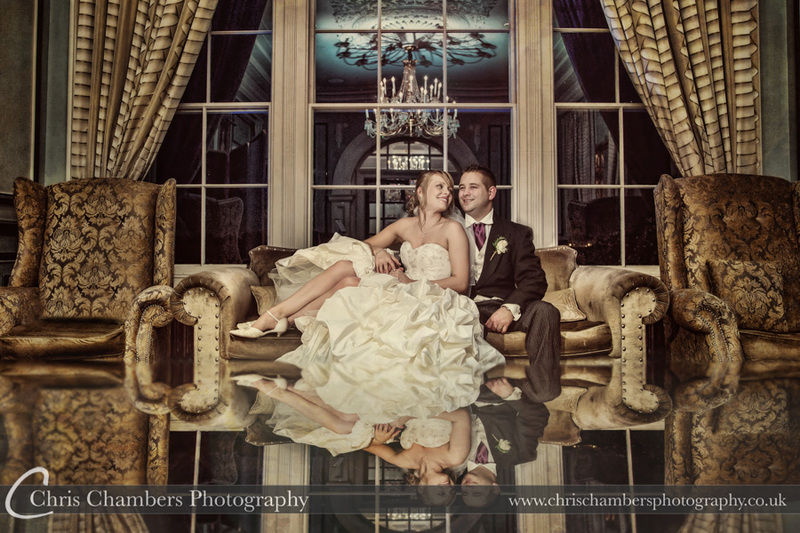 Chris Chamnbers Photograophy, Award winning Hazlewood Castle wedding photography. 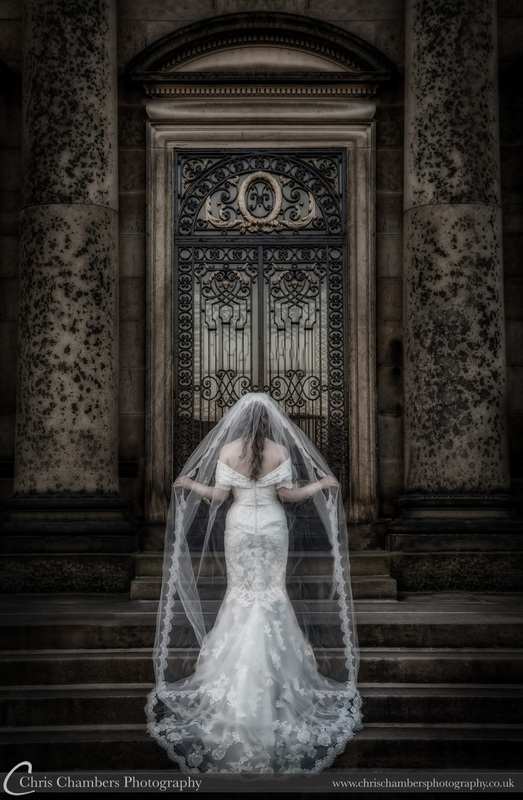 Amazing dress and veil detail on this wedding photograph taken on the steps outside Denton Hall North Yorkshire. 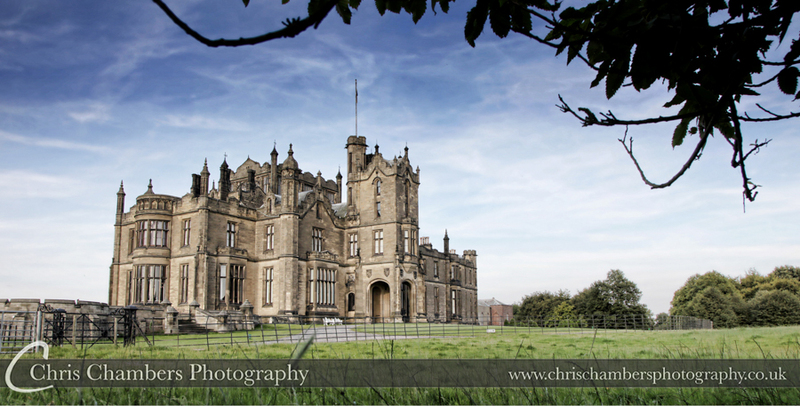 We are proud to be recommended by Allerton Castle for our wedding photography. 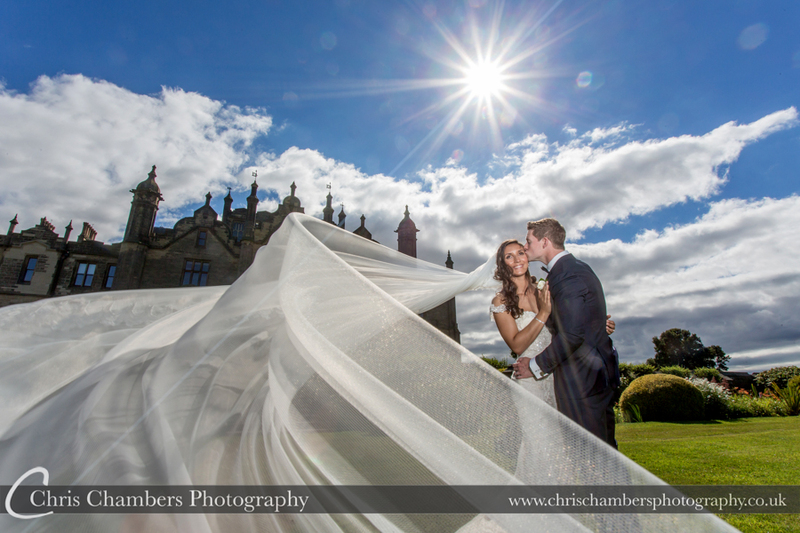 This wedding photograph of Andy and Sarah was taken around the back of Allerton Castle making use of both the wind and long veil. 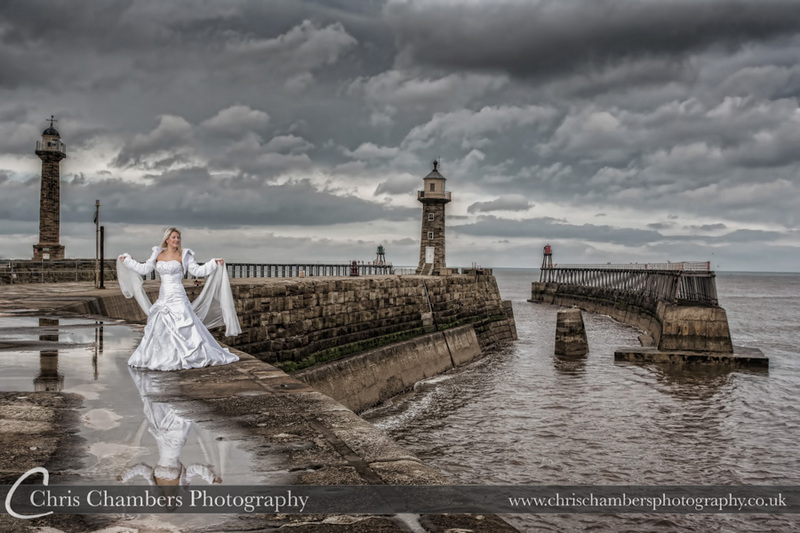 Yorkshire wedding photographer Chris Chambers. Believe it or not this is inside a Nandos restaurant. 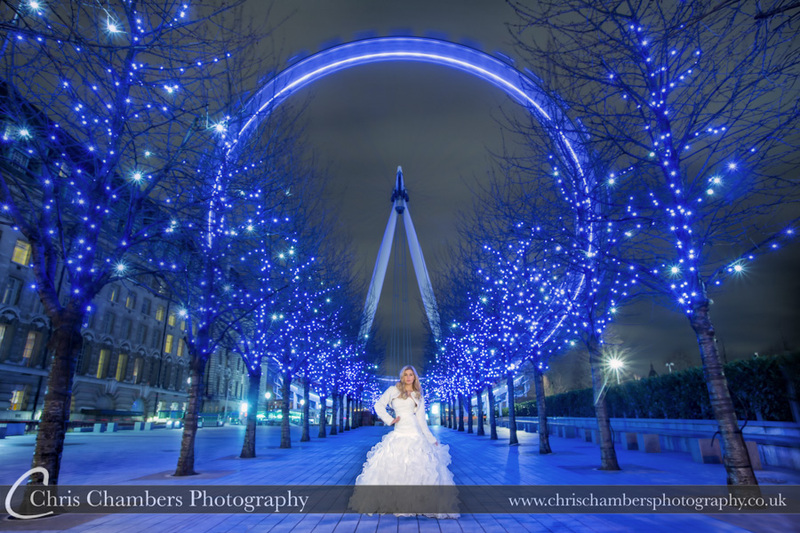 Taken on one of our London wedding photography training courses we had stopped for lunch when I spotted this amazing backdrop. 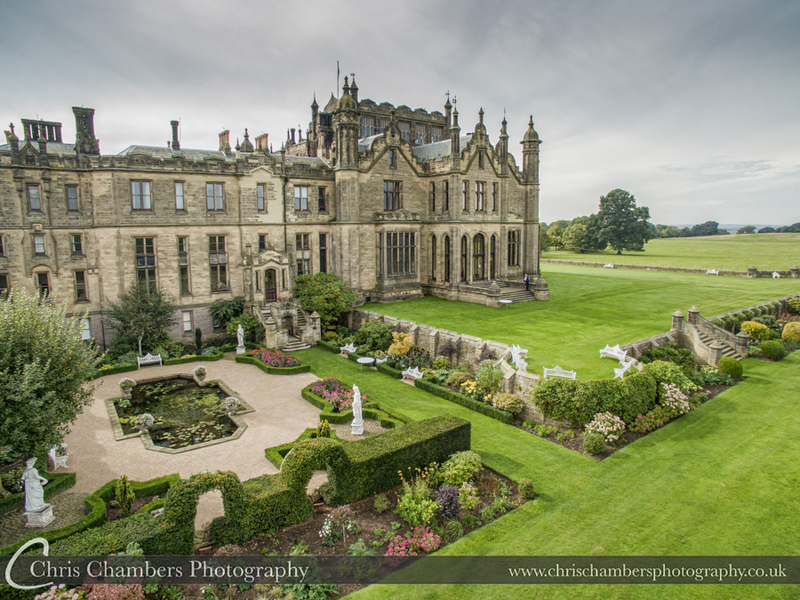 A wedding album double page spread image of Sally and James near Hazlewood Castle in North Yorkshire. 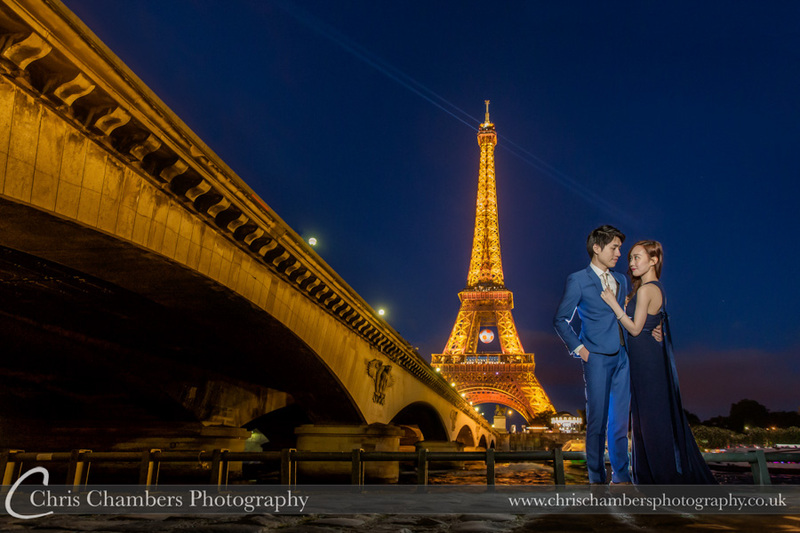 Eifell Tower Silhouettes for Kenneth and Eve on their Parisian pre-wedding shoot earlier this year. 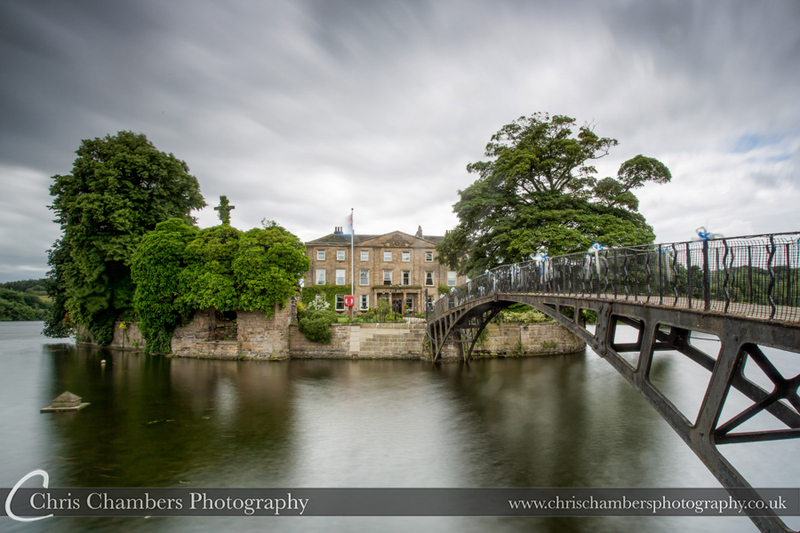 Hazlewood Castle, Tadcaster wedding photography of the bride and groom. 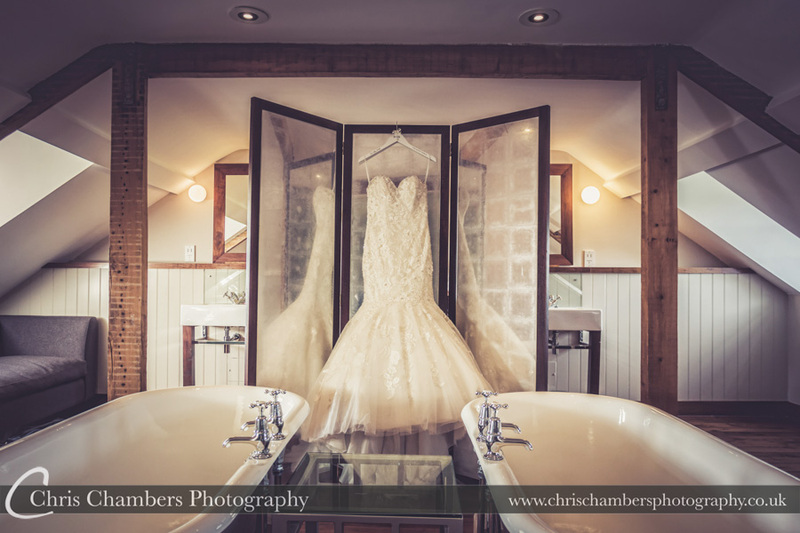 Sophie and Dave in the watergate at Walton Hall, Waterton Park Hotel wedding photography. This photograph was used on the cover of their wedding photo album. 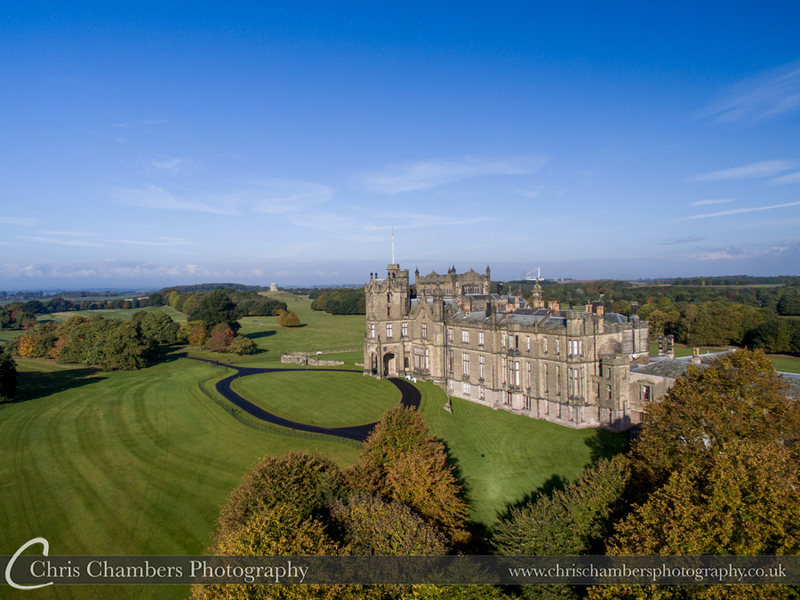 Below is the final of three blog posts showcasing some of the photographs in our new galleries, many of these haven’t been seen on the website before. 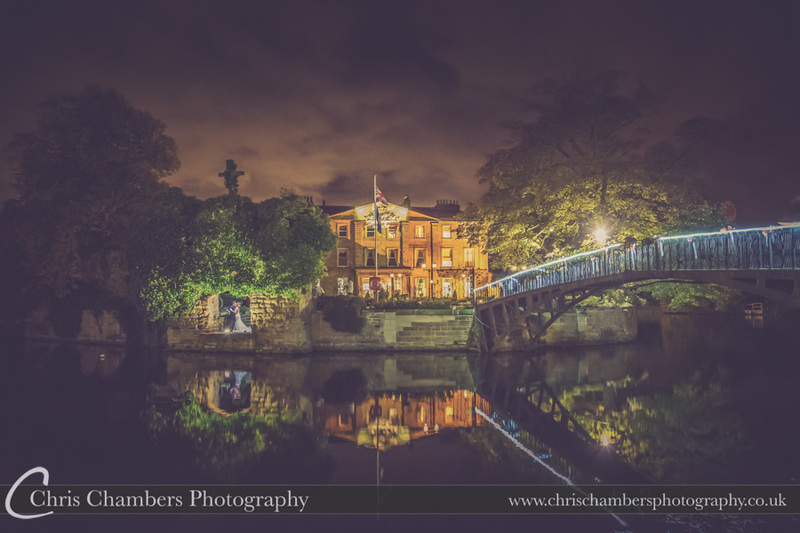 This wedding photography blog post includes bride and groom wedding photographs including sunset and after dark, from weddings in and around Leeds, Wakefield and Yorkshire with a few a little further afield. We’ve also aded a couple of pre-wedding shoot photographs for good measure. Please feel free to pin these images on Pinterest or share this post on Facbook. 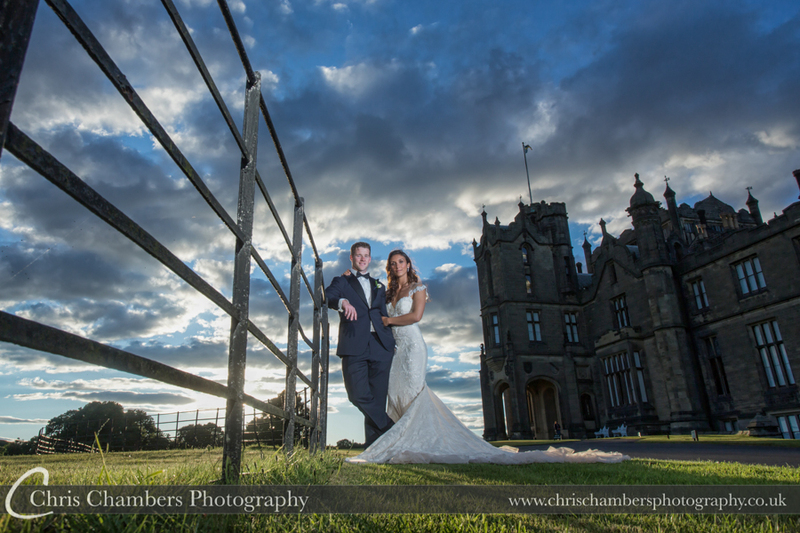 James and Sally near Hazlewood Castle near leeds. Close to sunset mid August and an amazing sky behind them. 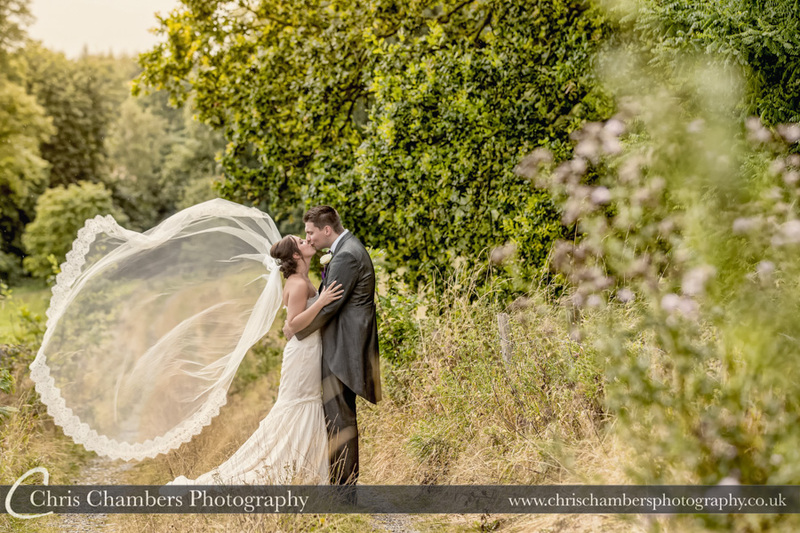 Rachel and Nick were married in Derbyshire and celebrated their wedding at Morely Hayes. 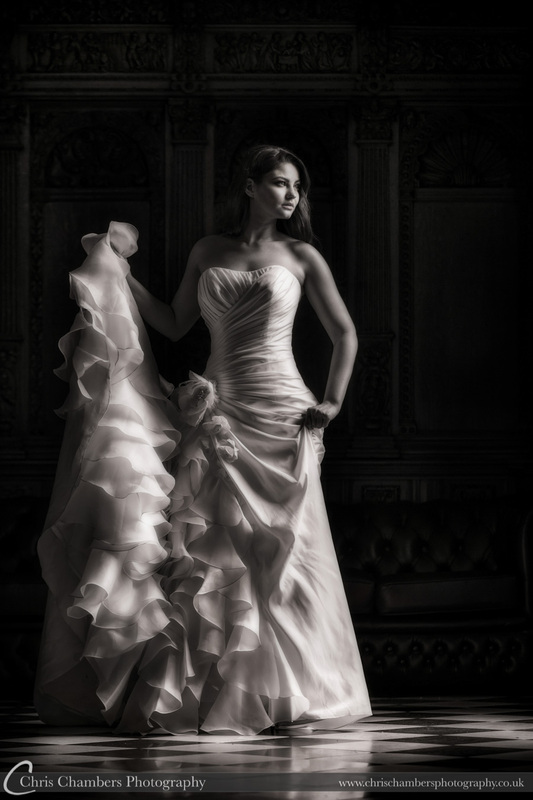 This wedding photograph of Rachel shows the dress details and extra long veil. Rachel’s veil in all it’s glory. 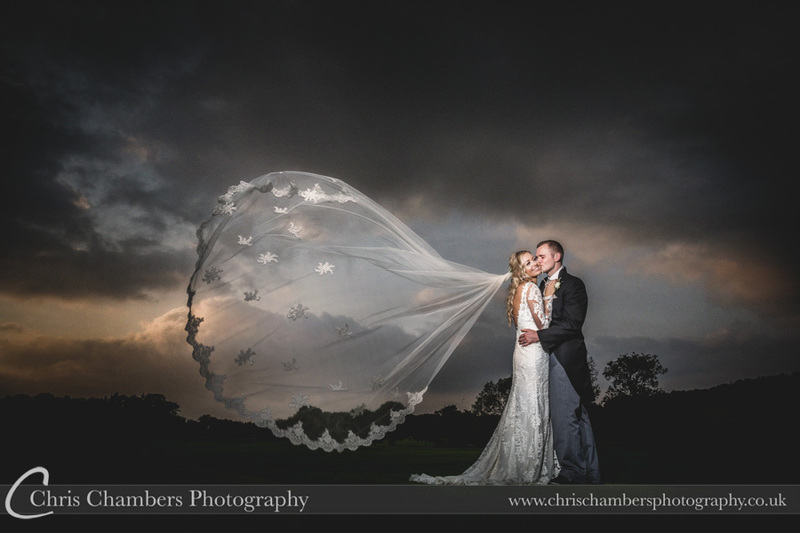 The rounded veil and tempestuous sky really add to this image and it features as a large photograph in Rachel and Nick’s wedding album. 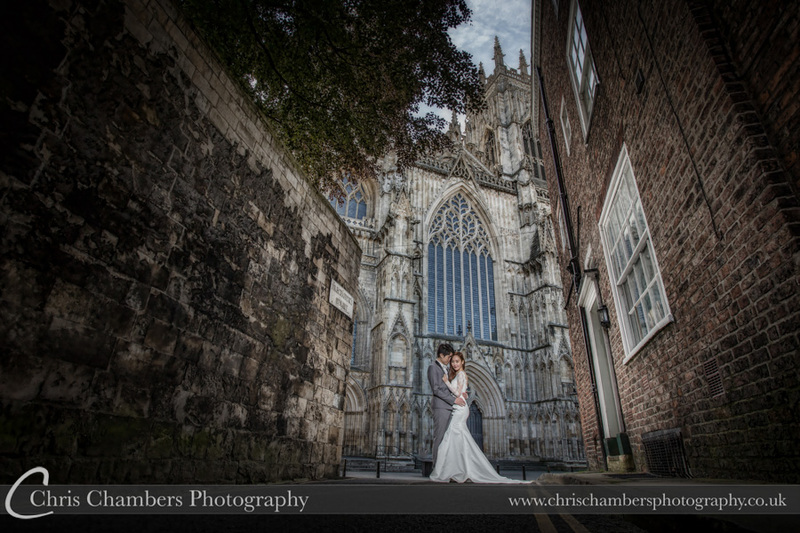 From a side street overlooking York Minster. this photograph is from Kenneth and Eve’s pre-wedding photo shoot. This is day one of the engagement shoot (three days in two countries). 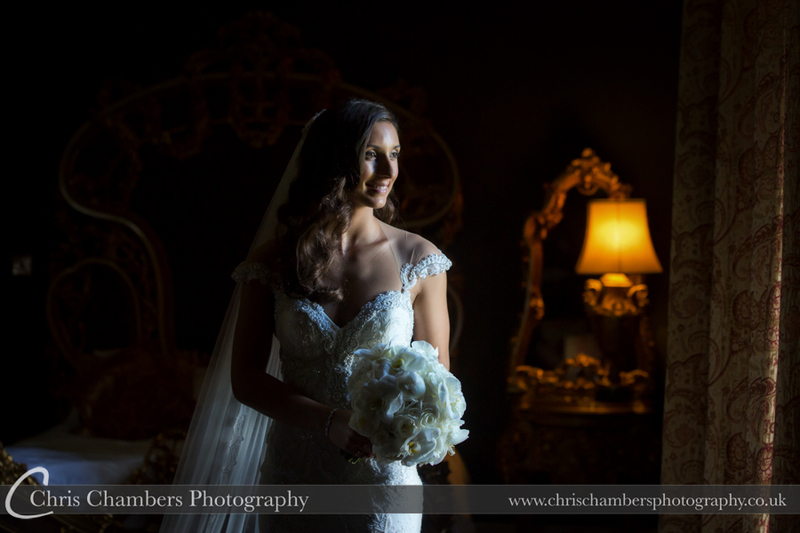 Bridal wedding photography at Hazlewood Castle. In the Flemish Hall at Hazlewood Castle. 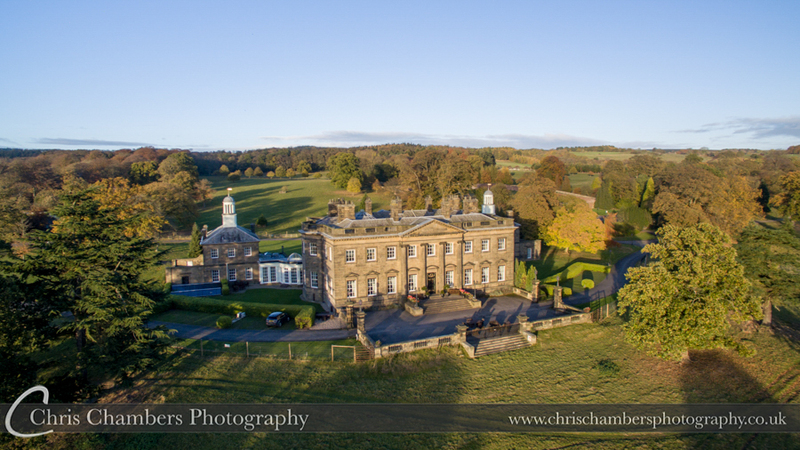 Wentbridge House Hotel near Pontefract. Jess and Lee in the grounds. 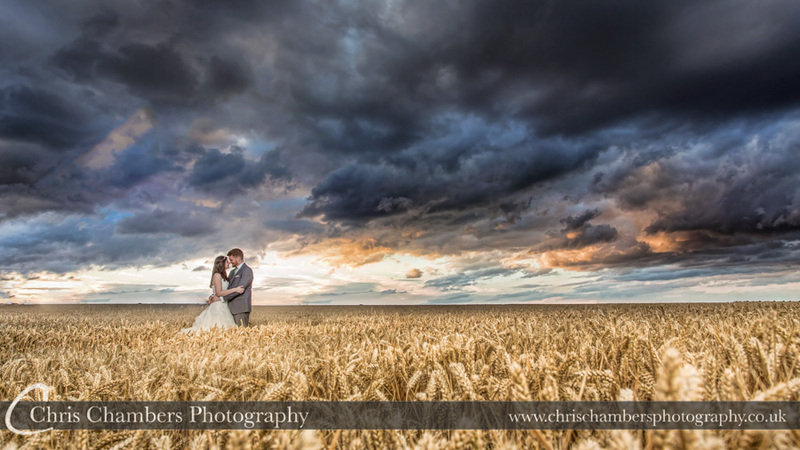 We have this printed as a double page spread in one of our studio sample wedding albums. 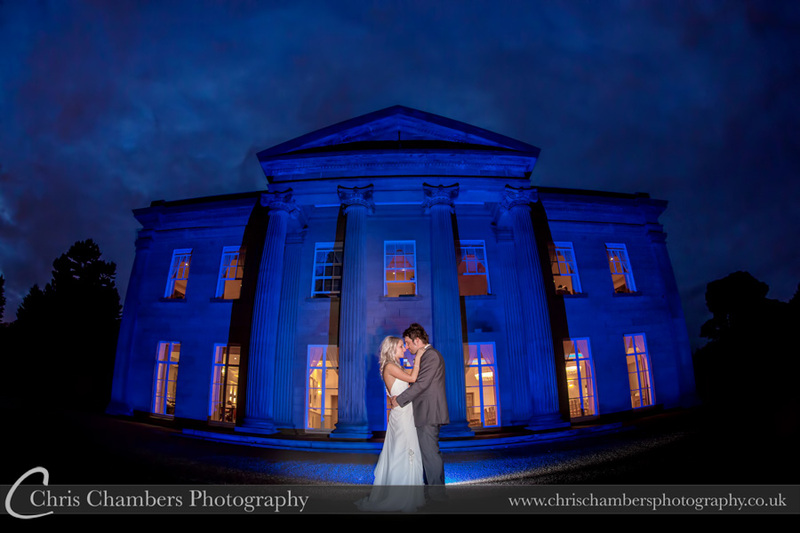 Wentbridge House Hotel wedding photography. 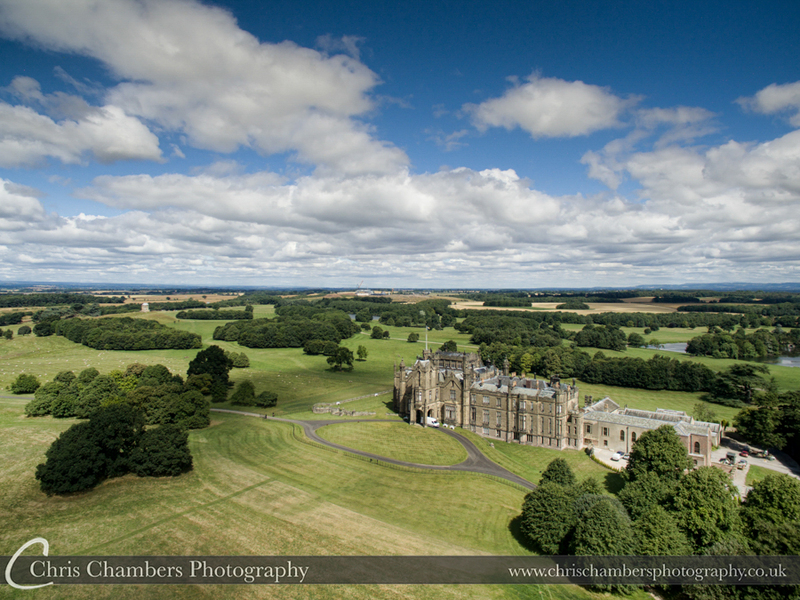 Allerton Castle wedding photography in North Yorkshire. 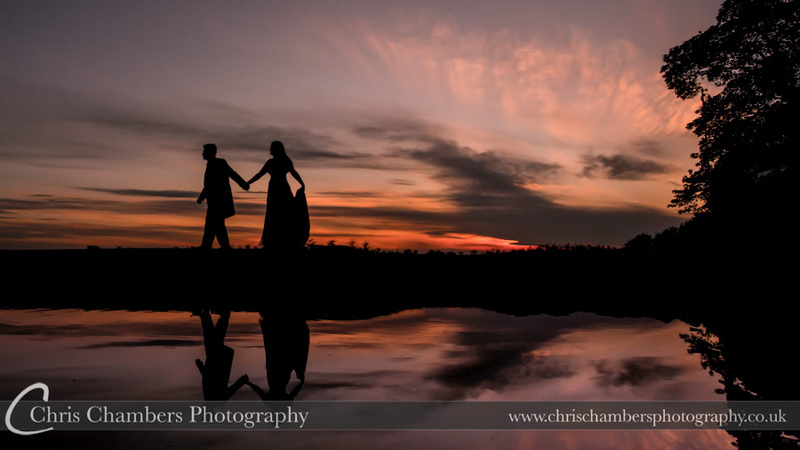 The bride and groom in close together just after sunset. 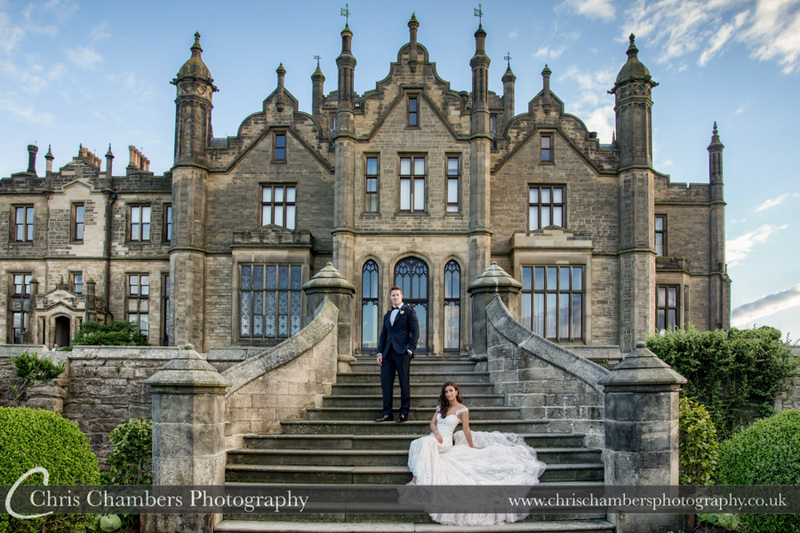 Hazlewood Castle Hotel wedding photography of the bride and groom. 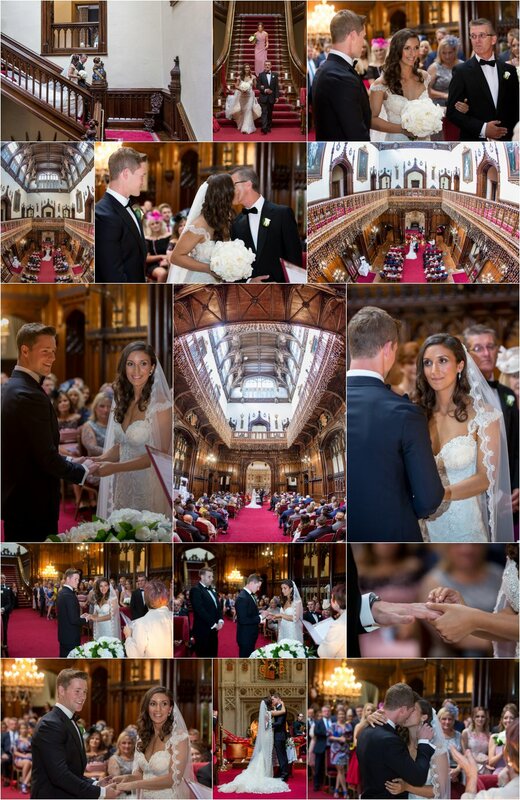 Hazlewood Castle wedding photography, in the Flemish Hall for this wedding photograph of Laura and Mark who married at the beginning of July. 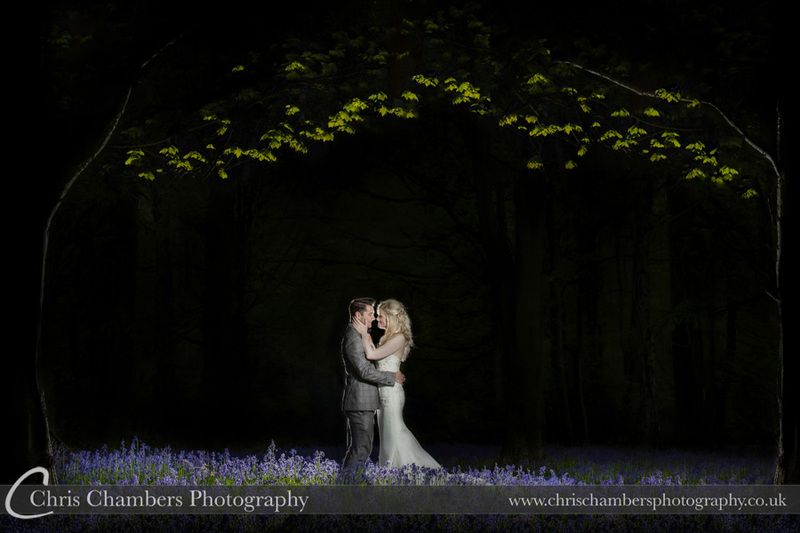 Bluebells at Hazlewood Castle near York. 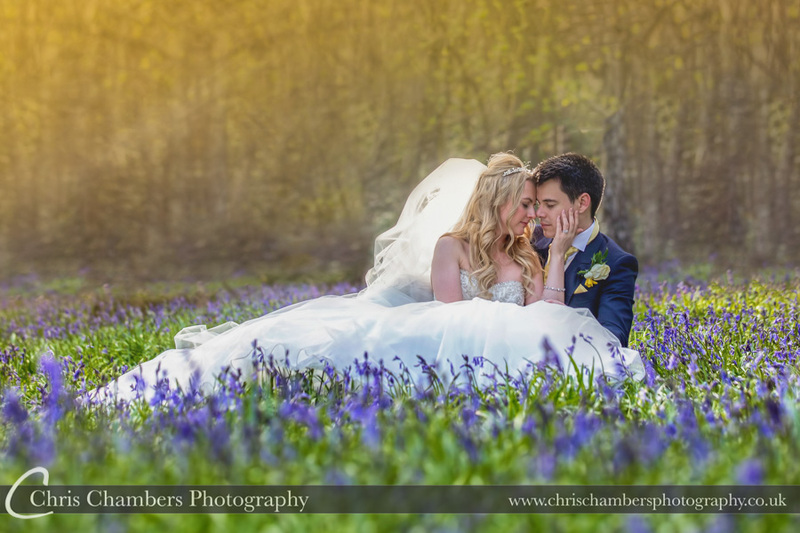 Photographed close to sunset Paul and Emma share a moment in the bluebells. 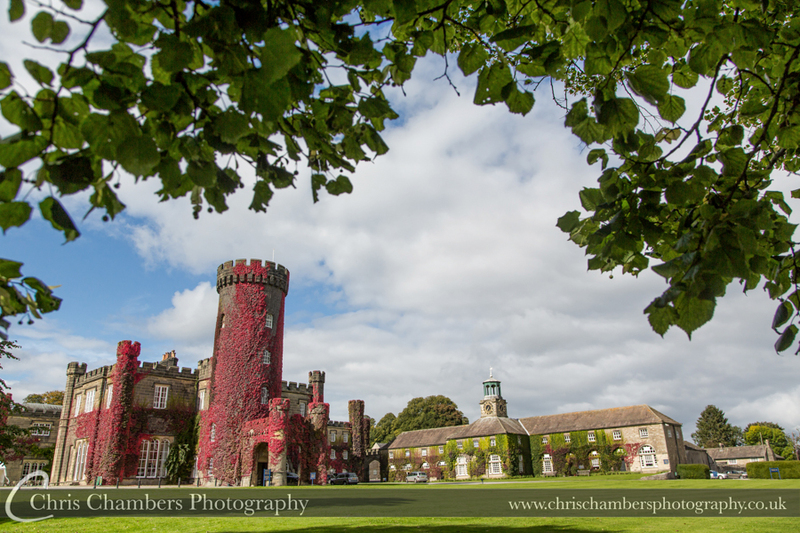 You can see more of our Hazlewood Castle wedding photography here. 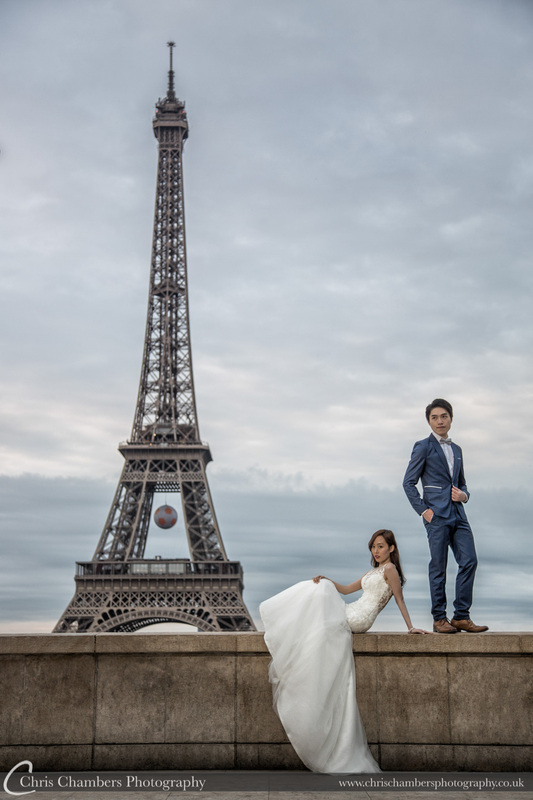 Overlooking the Eiffel Tower on a Parisian pre-wedding shoot. 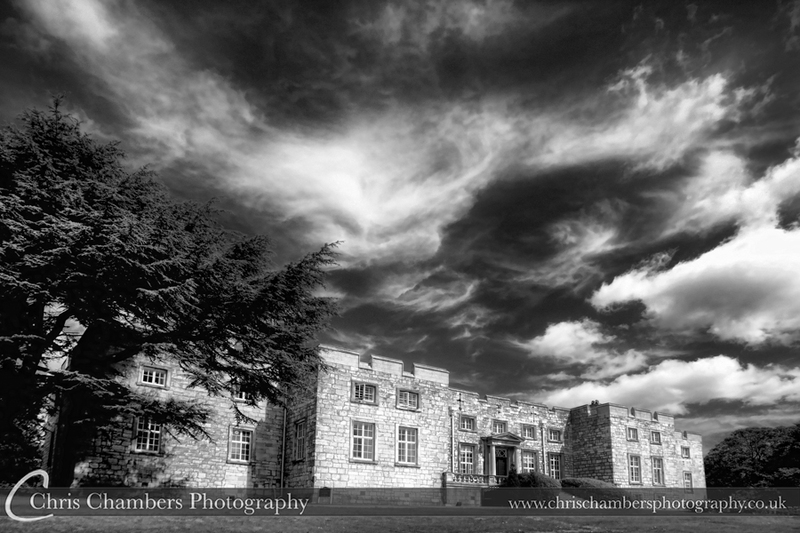 The back steps of Allerton Castle are a favourite location of ours. Matt and Elles married early summer. 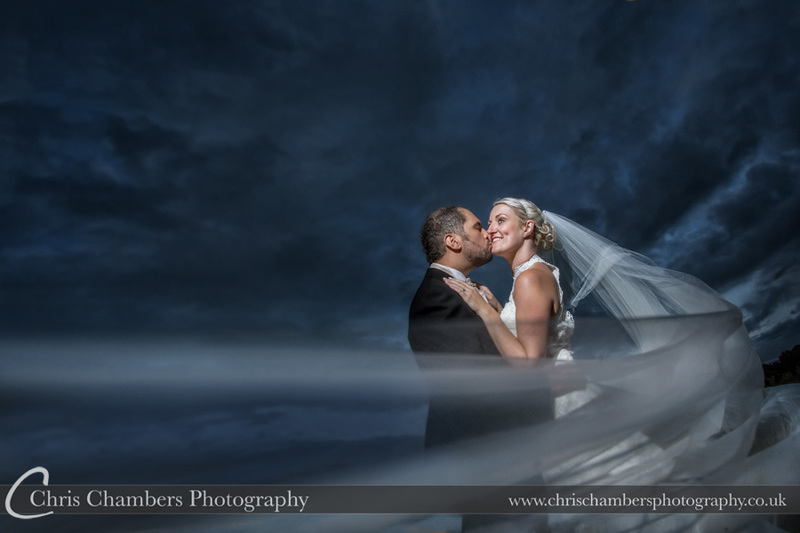 This wedding photograph was taken after the wedding breakfast as we waited for the wind to calm. 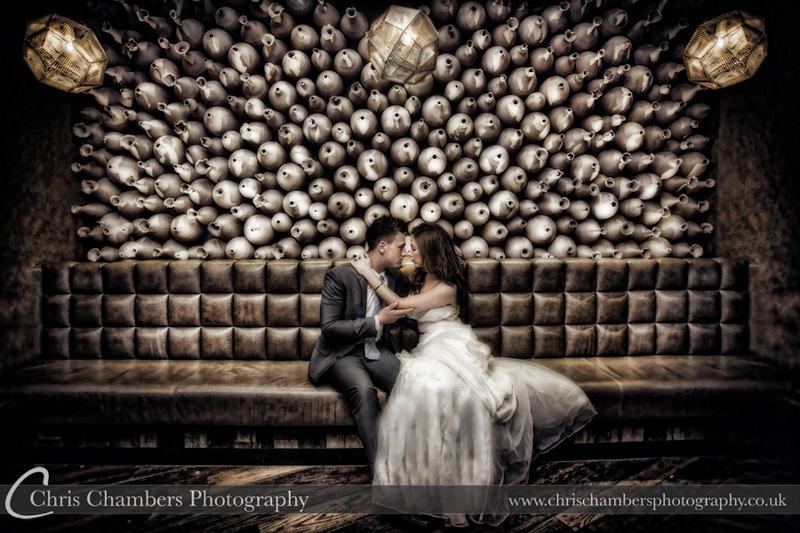 Amy and Chung practise their first dance at the Radisson in Manchester. We were looking down on them from the balcony and used allow shutter speed to capture there blur as Amy spun around. 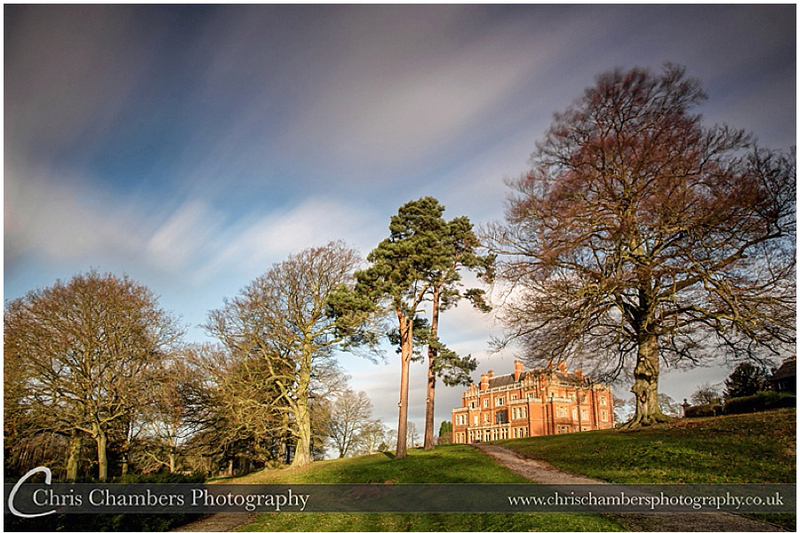 Rossington Hall in December for Helen and John’s wedding. 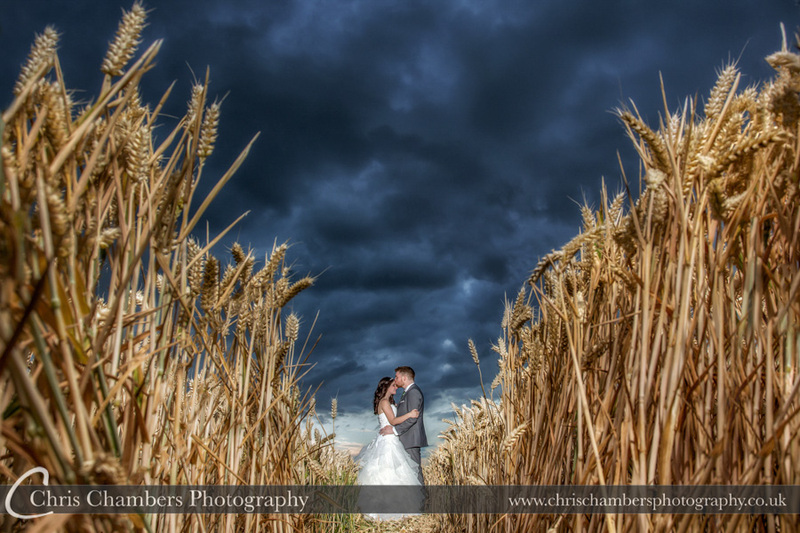 An extremely windy and stormy day but we managed to convince them it would be worth heading outside. 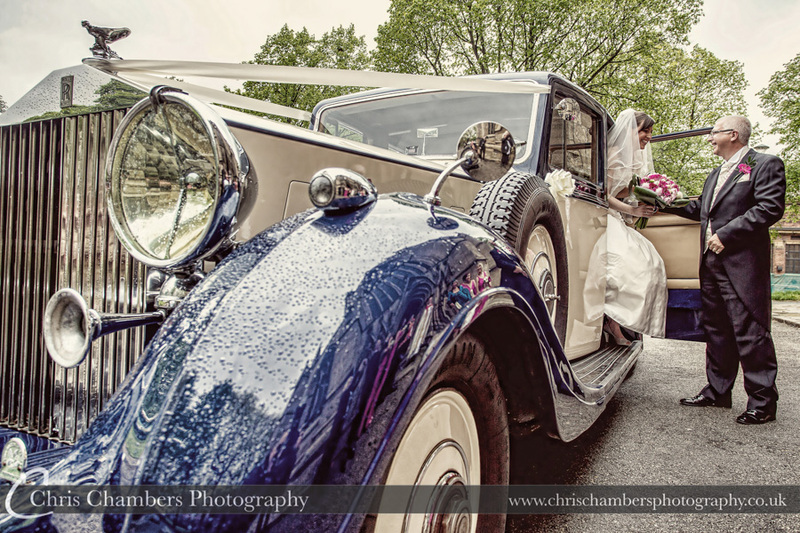 This wedding photograph was used as a double page spread in the wedding album. 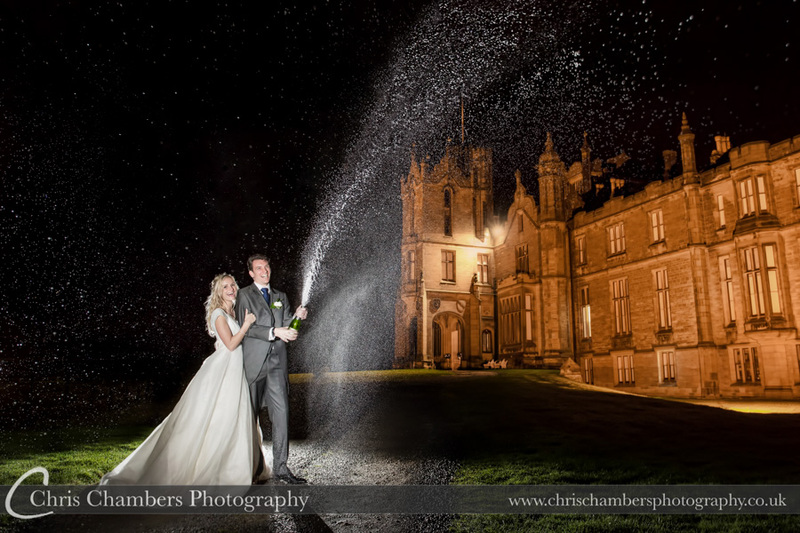 Courtyard wedding photography at Hazlewood Castle, winter wedding photography. 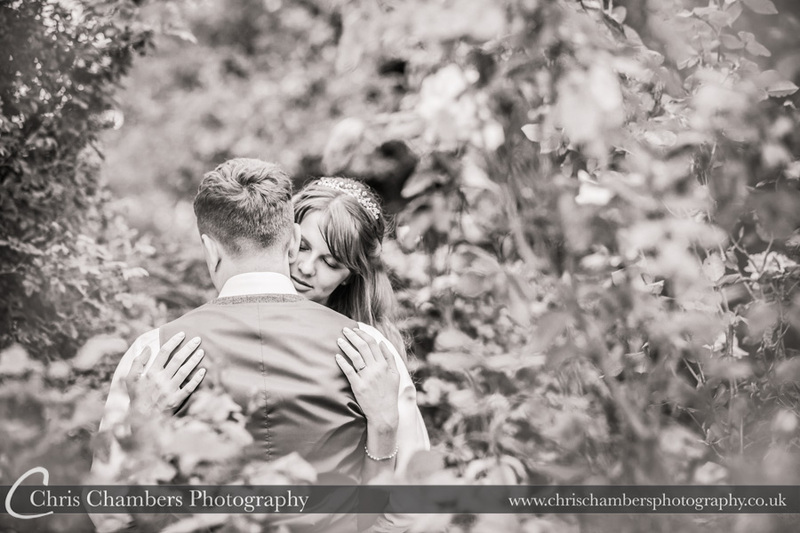 Waterton Park wedding photography of the bride and groom on the Island in Walton. 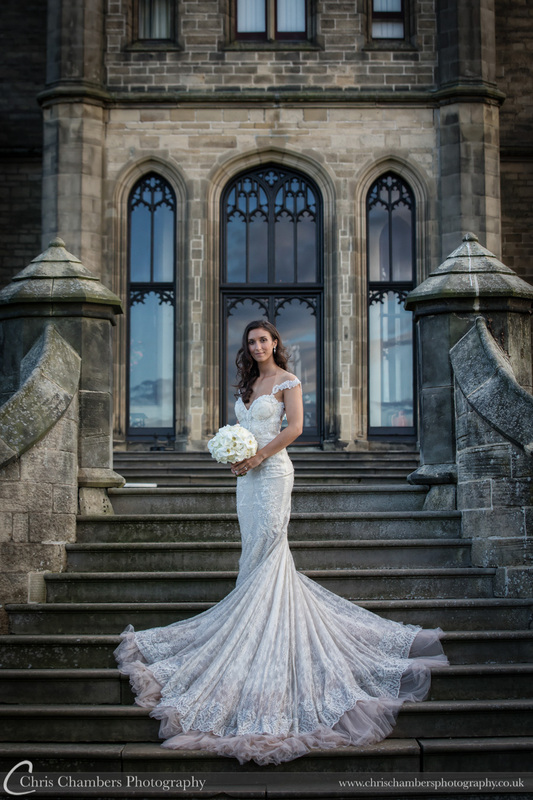 An amazing Ghalia Lahav wedding dress worn by Elles on the steps at the back of Allerton Castle. 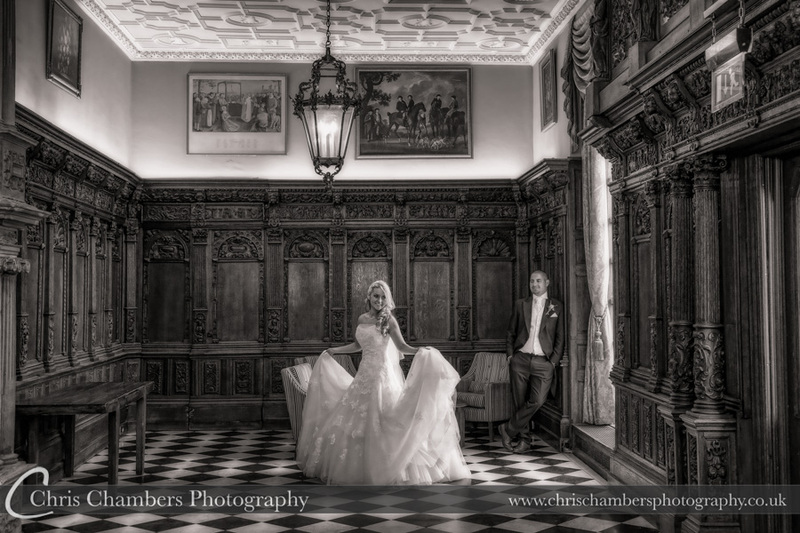 Katie and David in the main castle building at Ripley Castle. 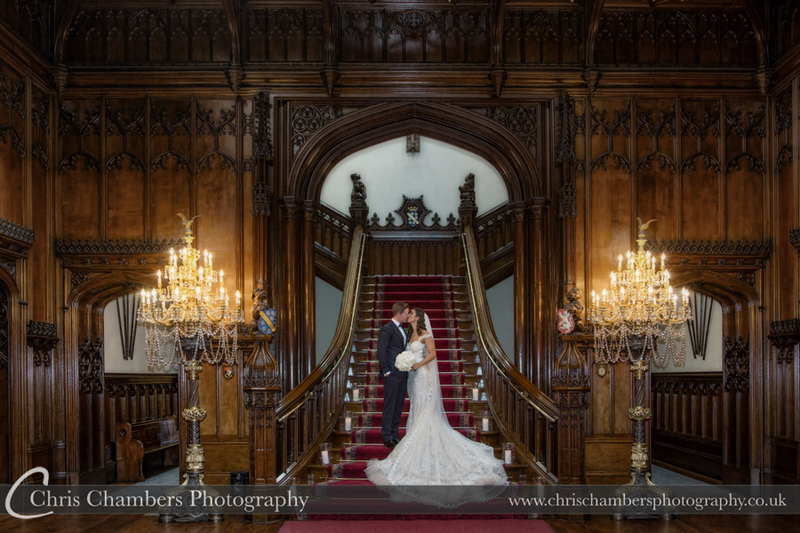 Despite marrying at Ripley church and celebrating in the east wing of Ripley Castle we were able to take a few photographs of the bride and groom in the main castle. 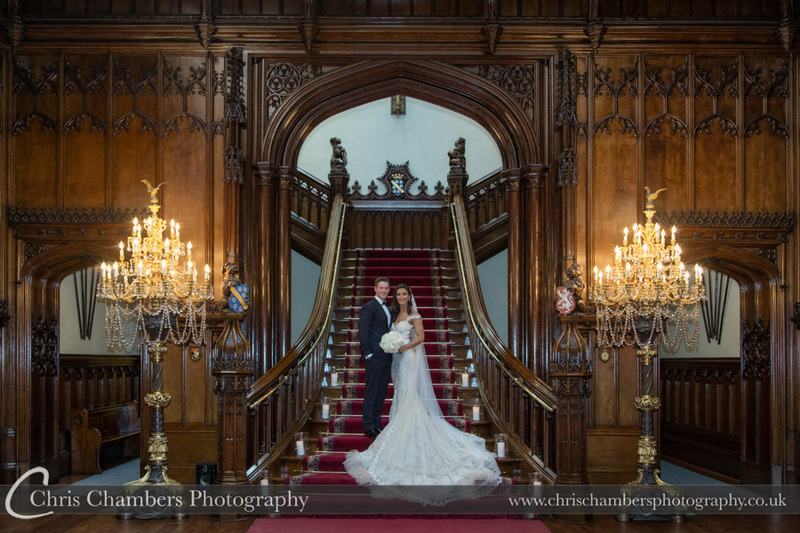 Allerton Castle’s grand staircase. 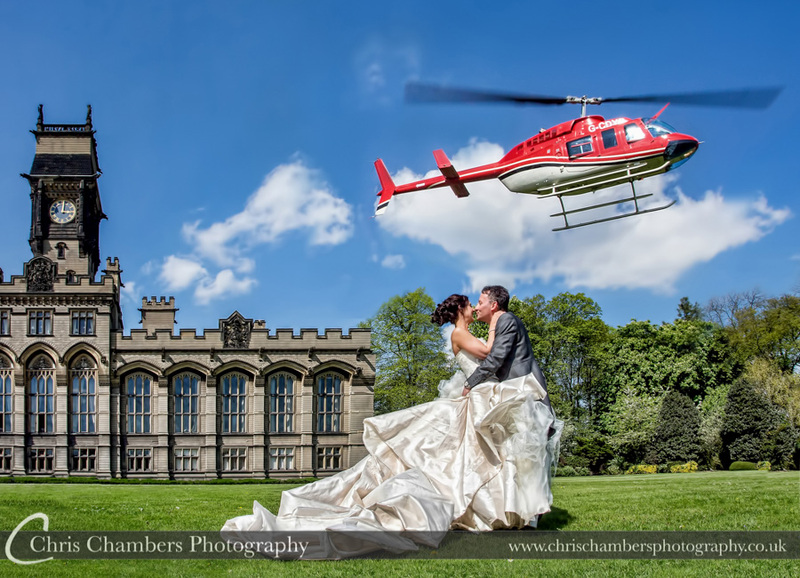 This is a must do wedding photograph for all weddings at Allerton castle. 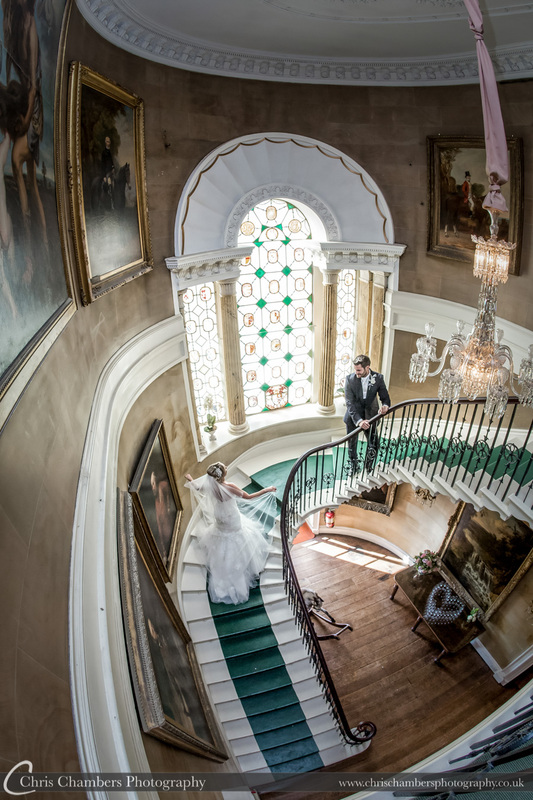 Matt and Elles on the staircase at Allerton Castle. 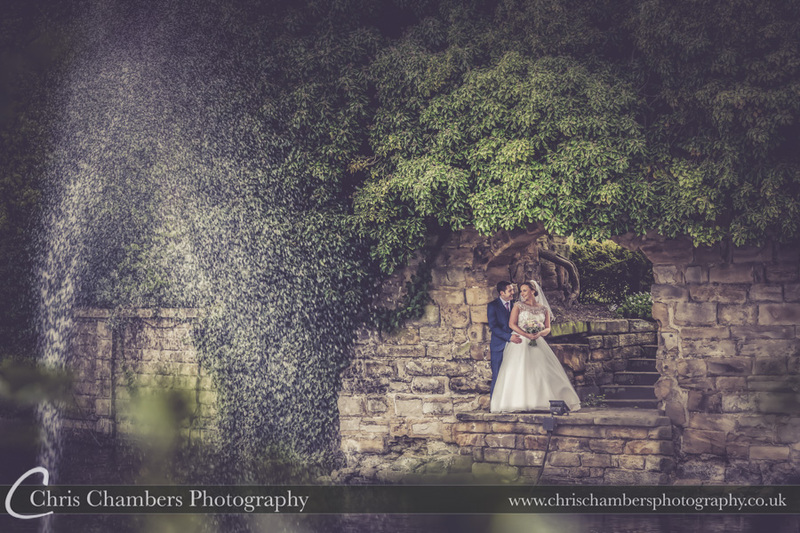 Katie and Jo married earlier in the year at Cubley Hall near Penistone in South Yorkshire. 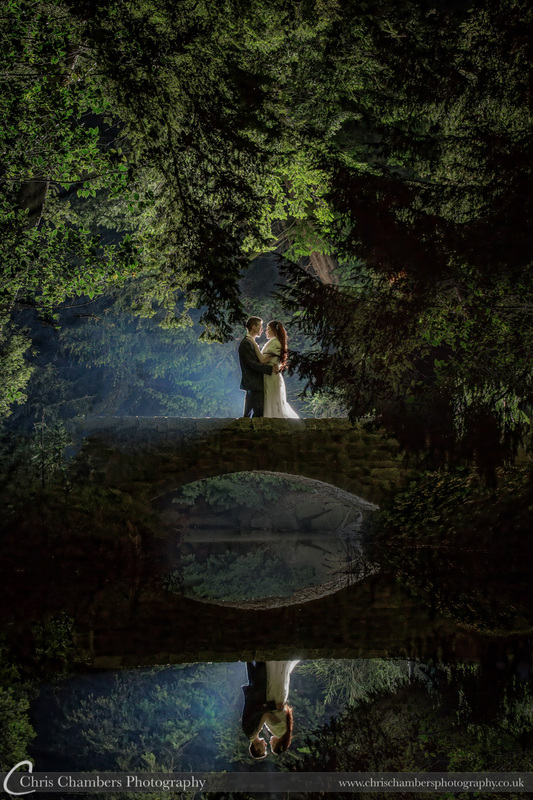 This wedding photograph was taken when the bride and groom were alone in the grounds. Shooting with a long lens has allowed them some privacy whilst I photograph natural candid moments. 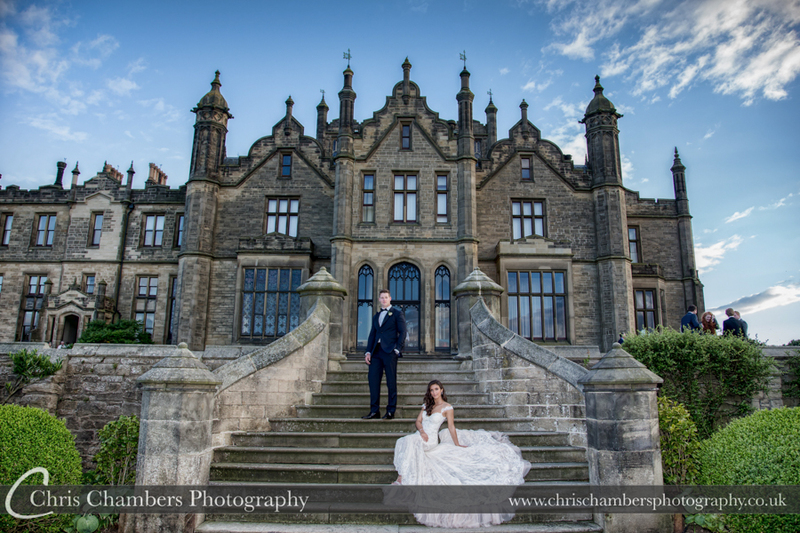 John and Emma on the steps of Carlton Towers. 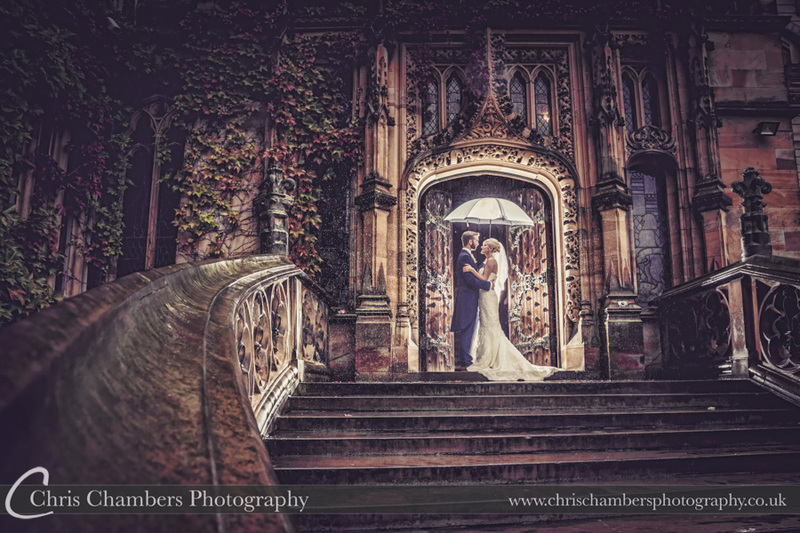 Sadly it rained for much of their wedding day but that didn’t stop us using the exterior of Carlton Towers and especially the amazing doorway and grand entrance staircase. 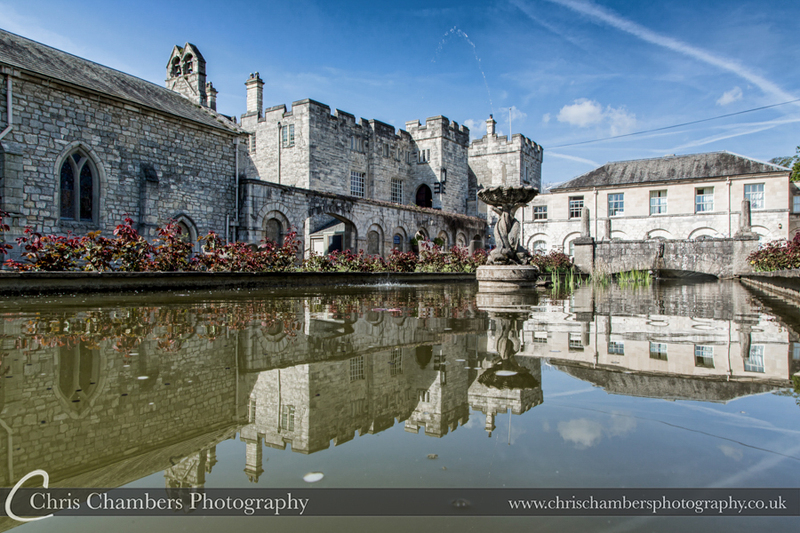 Carlton Towers wedding photography from Chris Chambers. 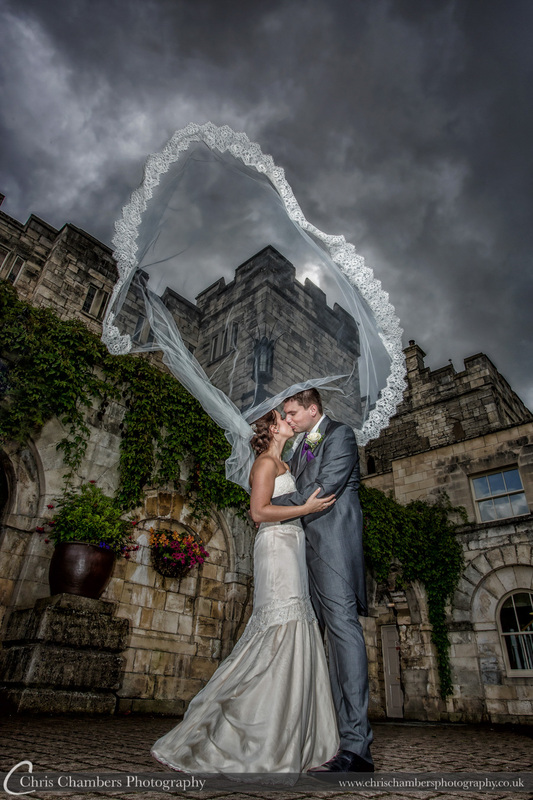 Award winning North Yorkshire wedding photography at Hazlewood Castle. Inside the main Castle building at Ripley Castle. 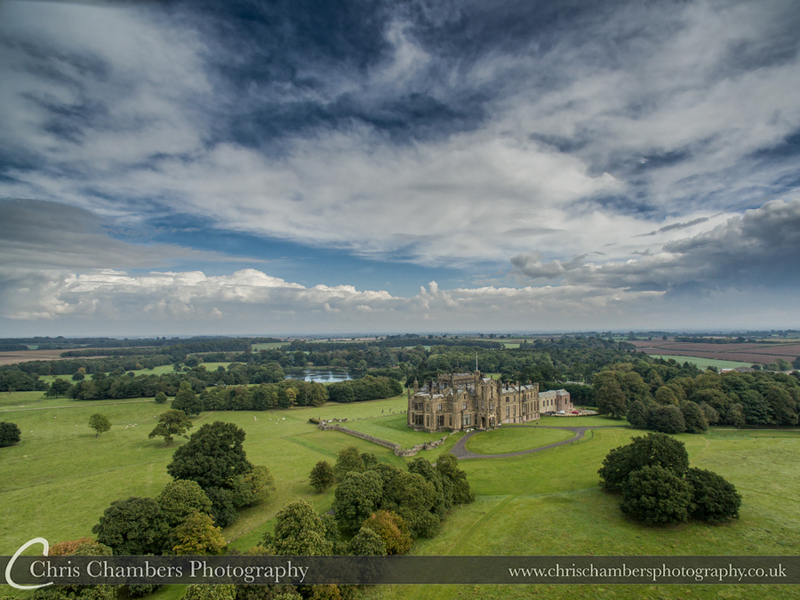 Ripley Castle wedding photography. 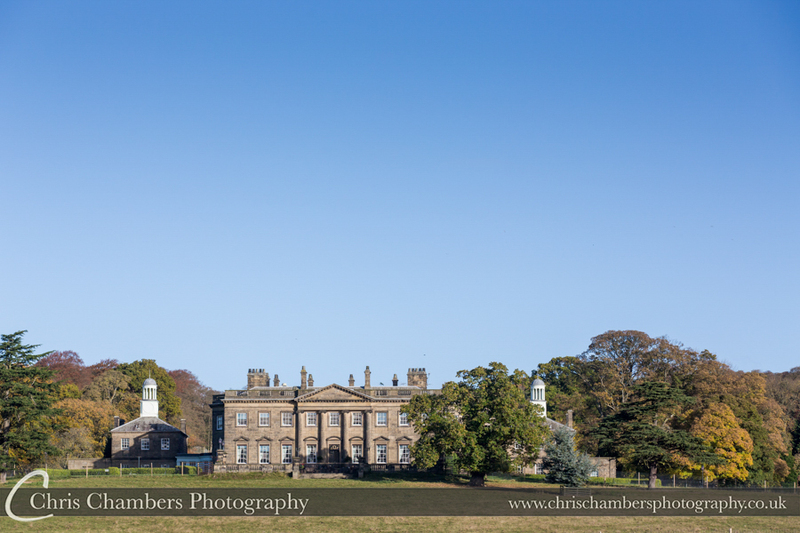 Chris and Emma were married early Autumn at Walton Hall near Wakefield West Yorkshire. It didn’t take any convincing to have Emma lay in the leaves, thankfully the had confidence in our ideas and trusted our judgement. Although they haven’t yet selected the wedding photographs for their storybook wedding album I can almost guarantee this will be a double page spread. 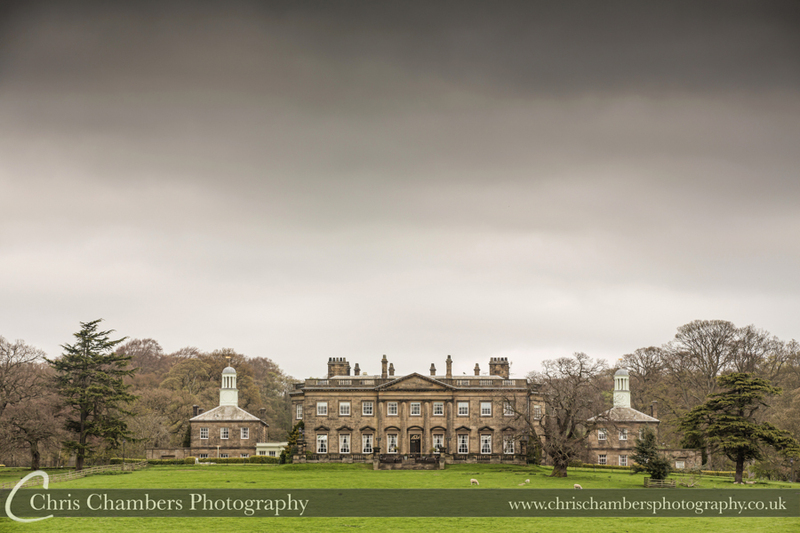 You can view more Walton Hall wedding photographs here. 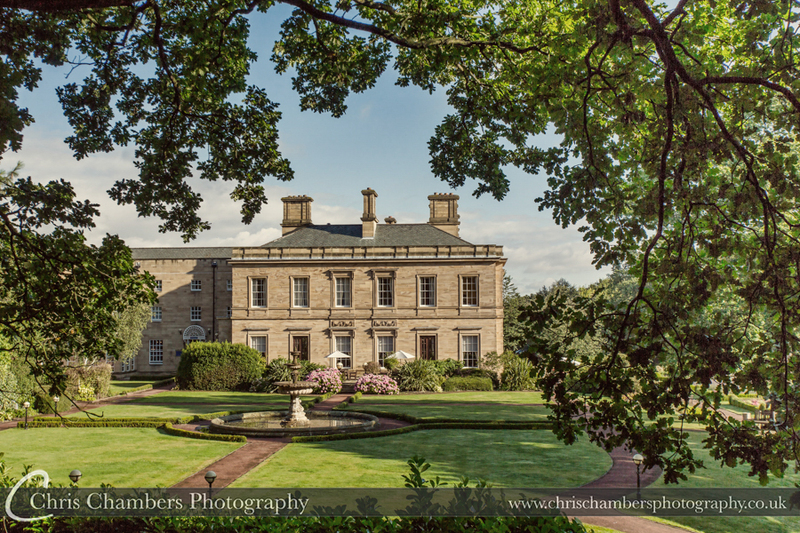 Walton Hall is at Waterton park Hotel Wakefield. Sunset on Westminster bridge London. 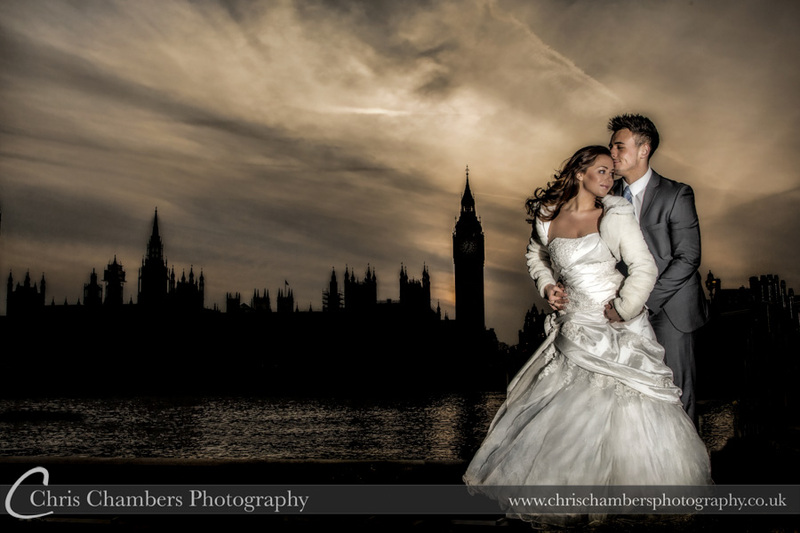 We photograph in central London three to four times per year. 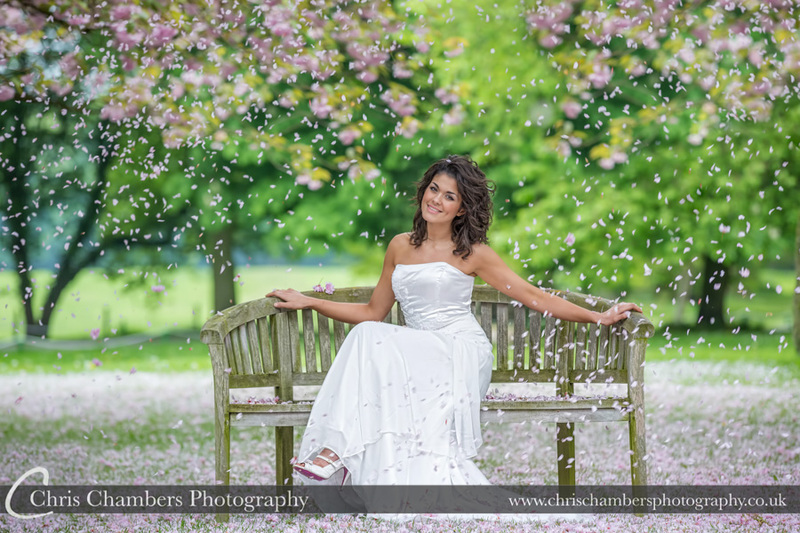 This photograph was taken on one of our wedding photography workshops back in the spring. 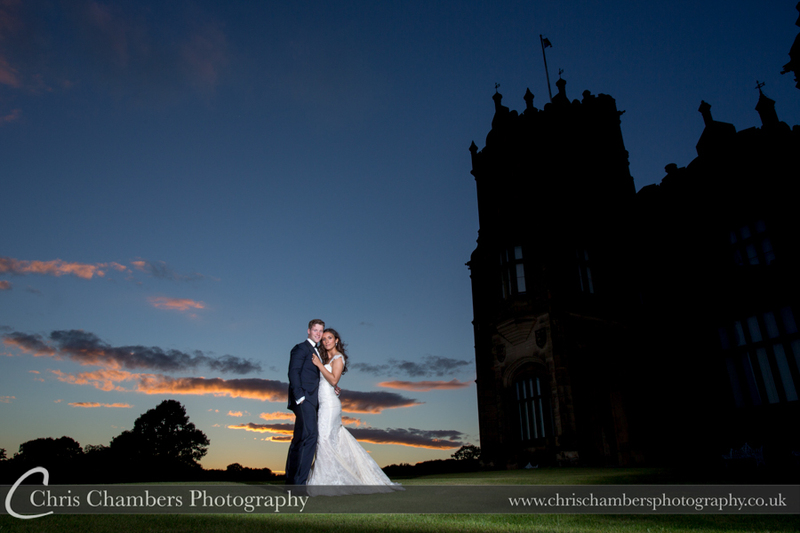 April and Chris at Allerton Castle for sunset. 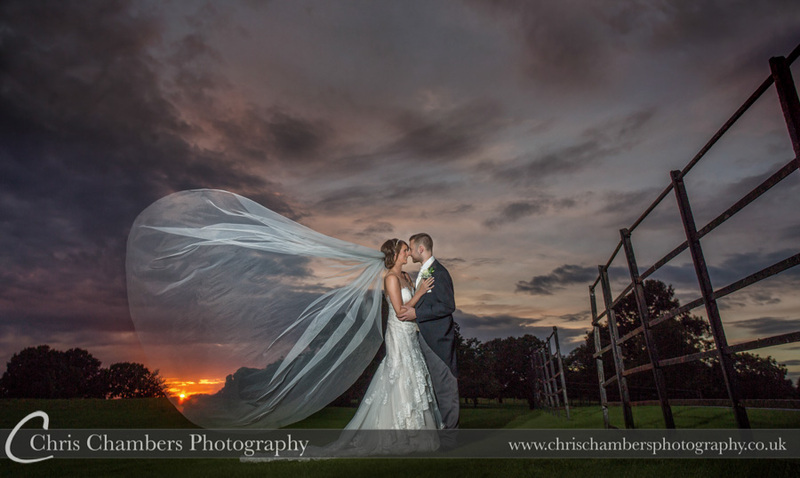 We always watch the skies around sunset and can then head out as required, this is exactly what happened here with April and Chris during their wedding day at Allerton Castle. On the Southbank of the Thames overlooking the Houses of Parliament in London. 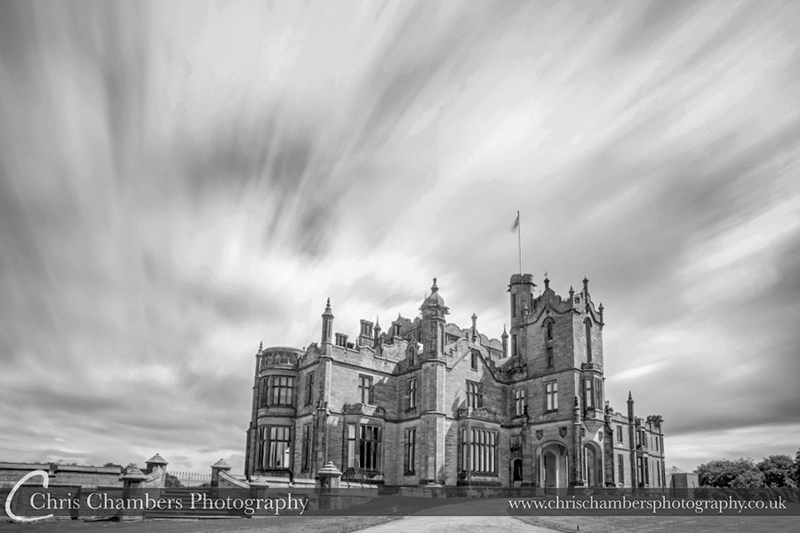 Hazlewood Castle on a foggy evening. 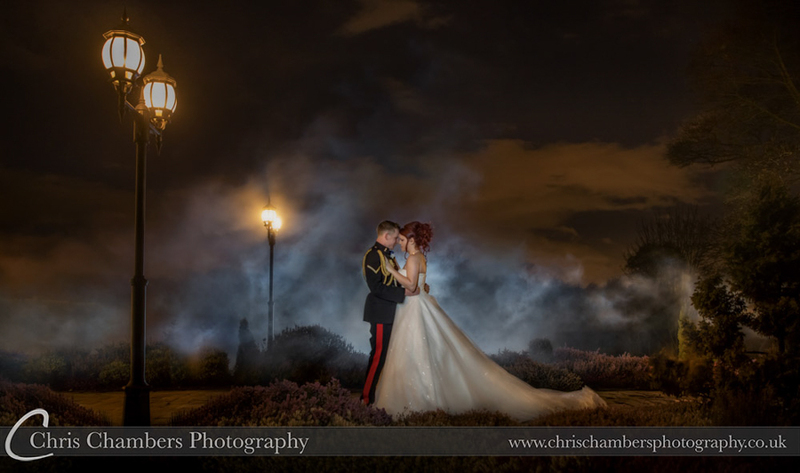 A real pea souper of an evening we weren’t sure what we would achieve but ventured out and managed to convince the bride and groom of our plans. 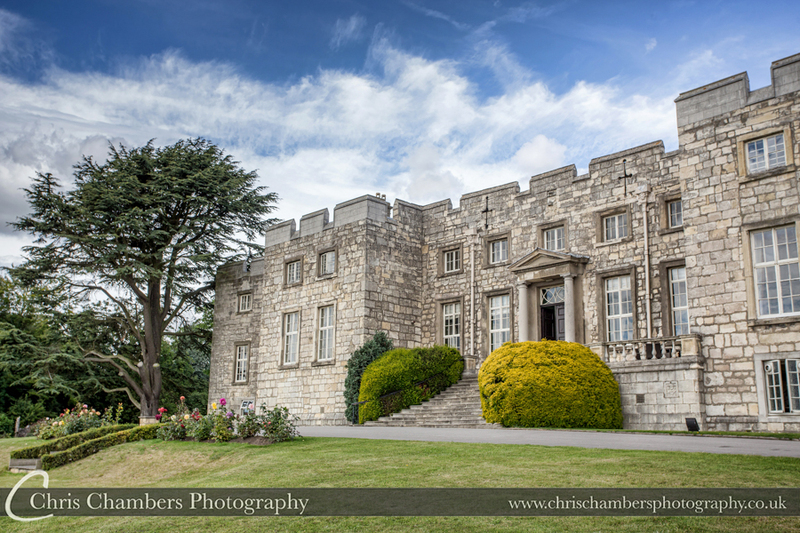 Hazlewood Castle wedding photographer. 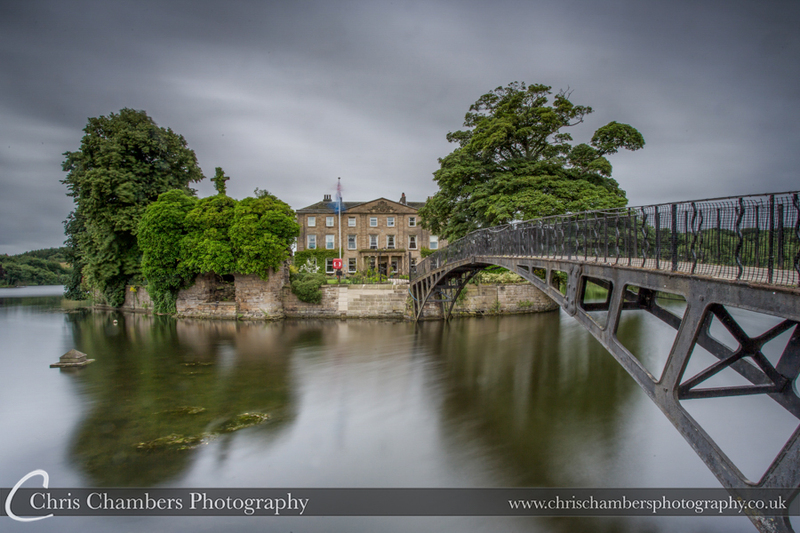 Hazlewood Castle, Yorkshire, in the rain. 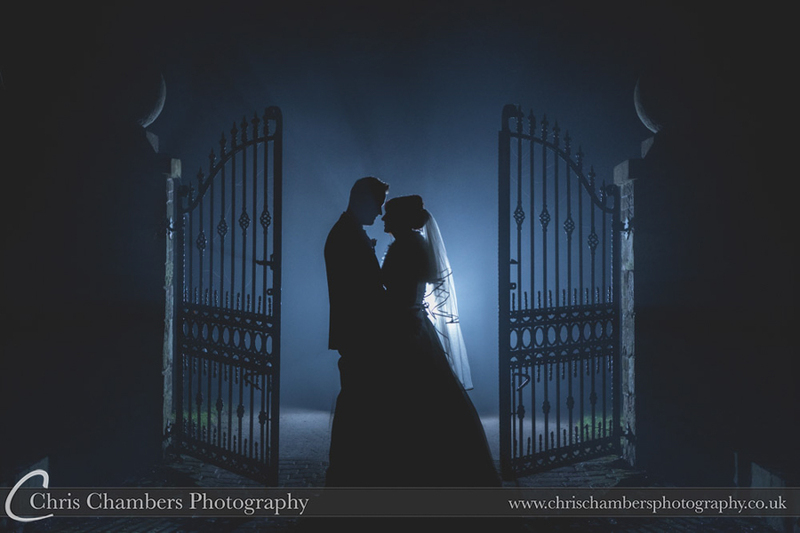 We used the same location as the foggy gates for this wedding photograph. 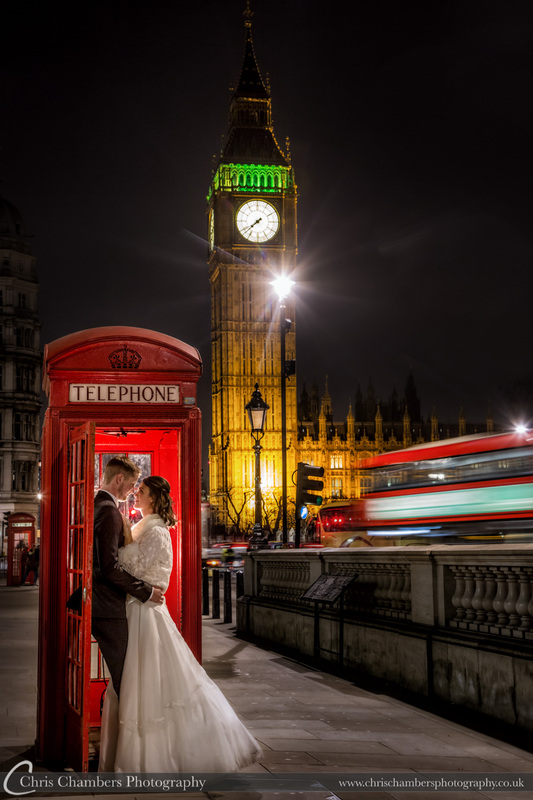 This photograph won a Silver with the Guild of Photographers and was voted as best Classical wedding photograph of the year. 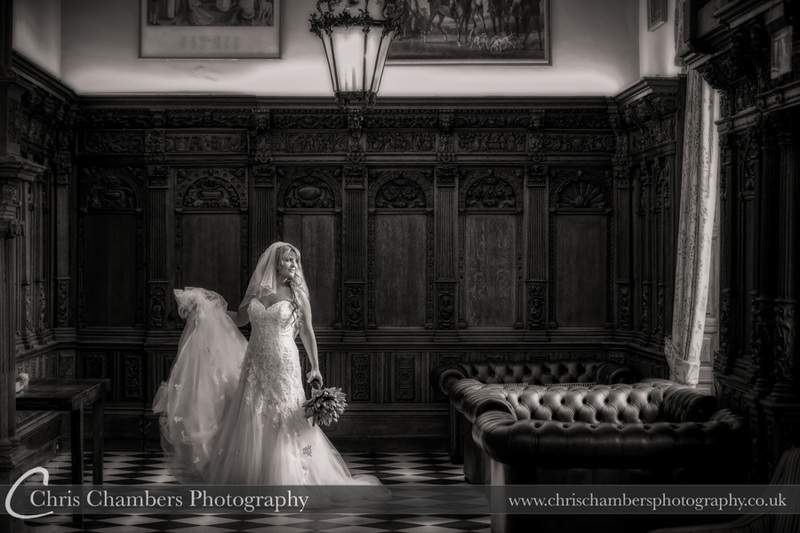 Award winning Hazlewood Castle wedding photographer. 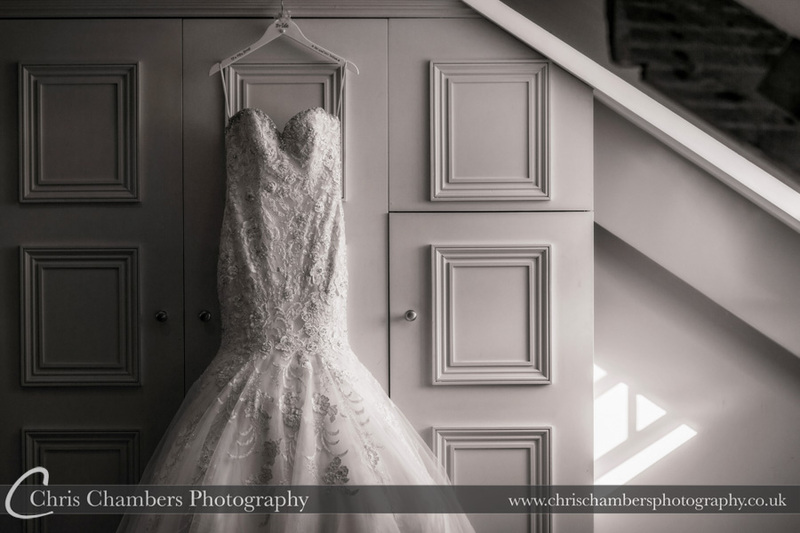 Bagden Hall wedding of Stephanie and Donald in February. After dark we ventured back down to the folly for some more photographs including this one taken from the far side of the lake. 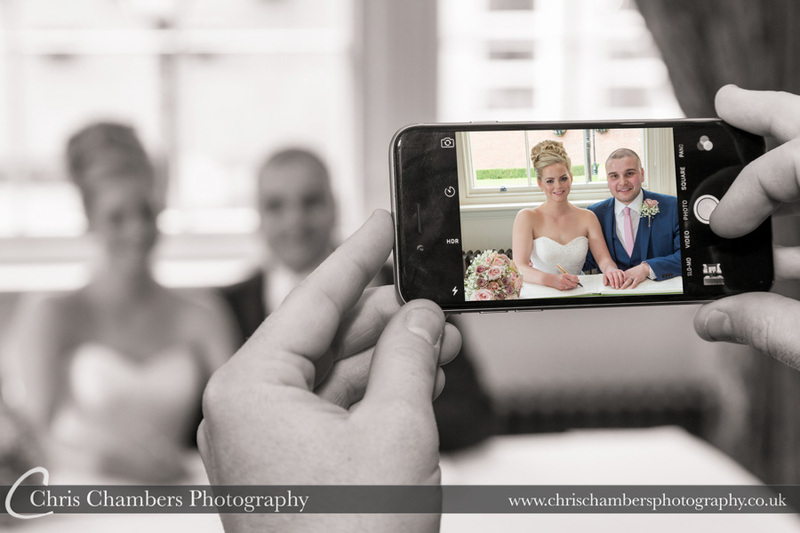 Bagden Hall wedding photographer. 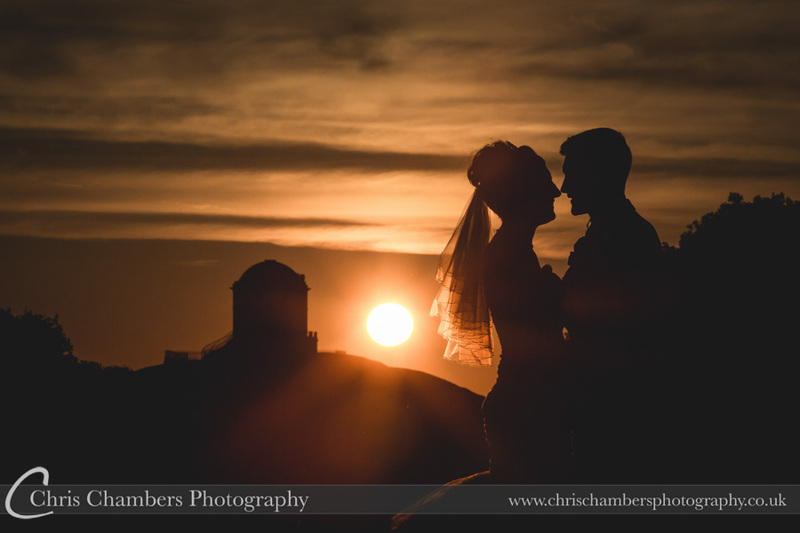 Bride and groom silhouettes near St Pauls in central London. 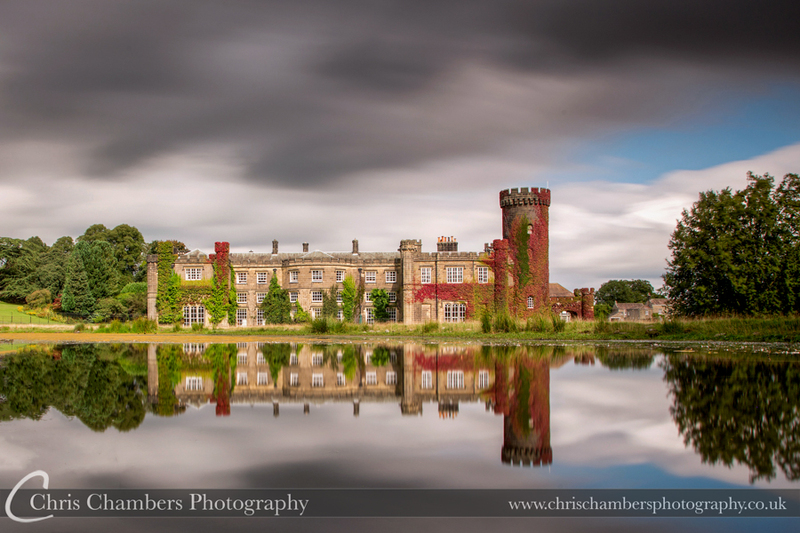 Allerton Castle reflected at night. 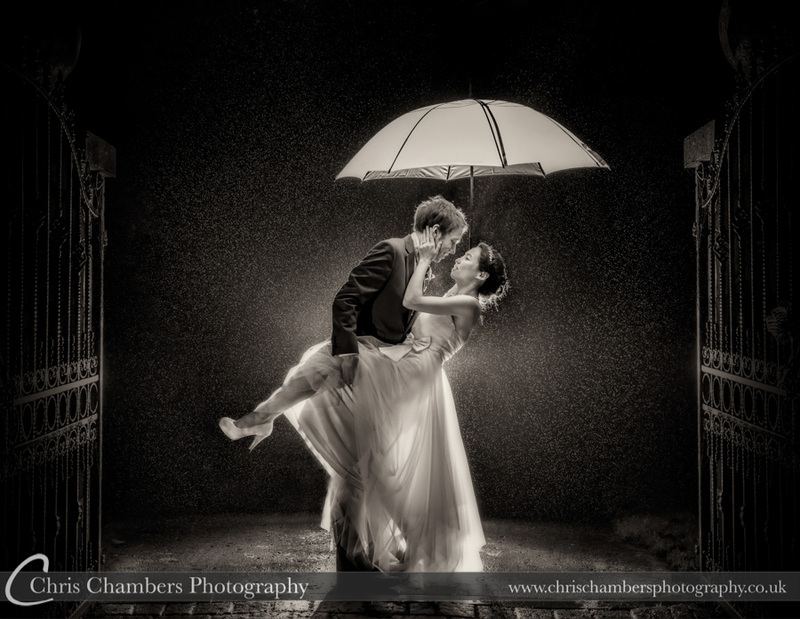 This photograph involved wading into a large puddle with camera, tripod and flashes. 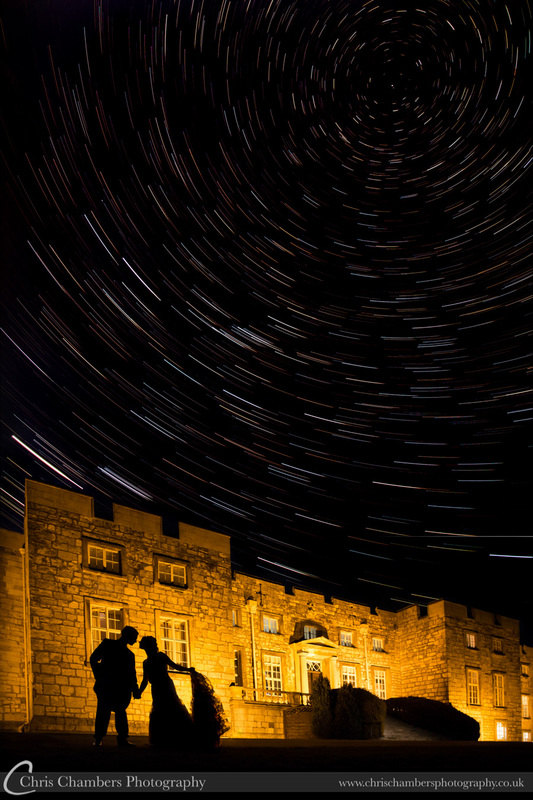 Hazlewood Castle and a star trail. This is the culmination of 92 photographs all merged together in photoshop to create the natural track of the stars as the earth revolves. A clear night and lots of time was required for this photograph. 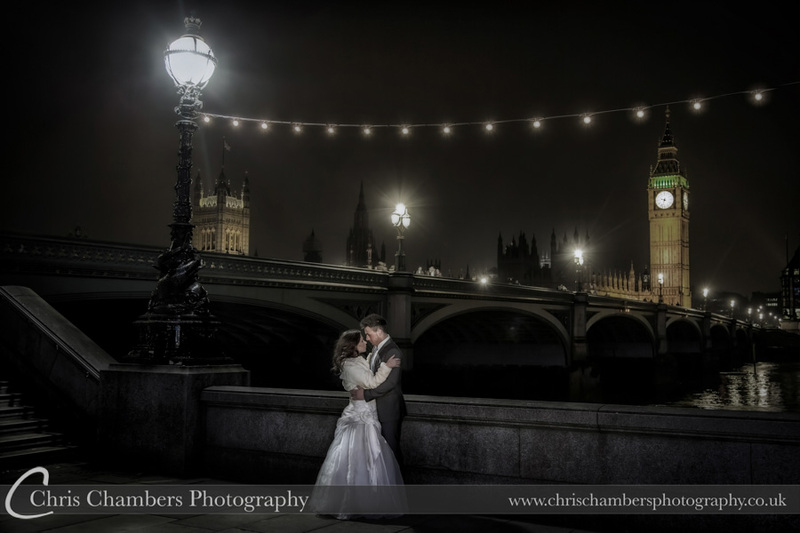 Overlooking Parliament in central London, it’s hard to dodge the crowds and so usually these shoots take place a long time after dark. Standing on the banks of the river Seine in paris with the Eifell tower behind them. Kenneth and Eve on their pre-wedding photo shoot. 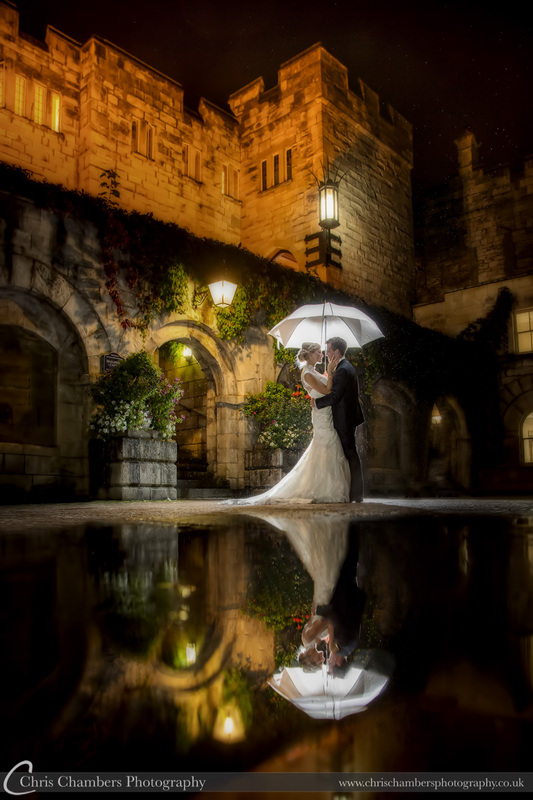 Reflection evening photograph of the bride and groom in Hazlewood Castle’s Courtyard. 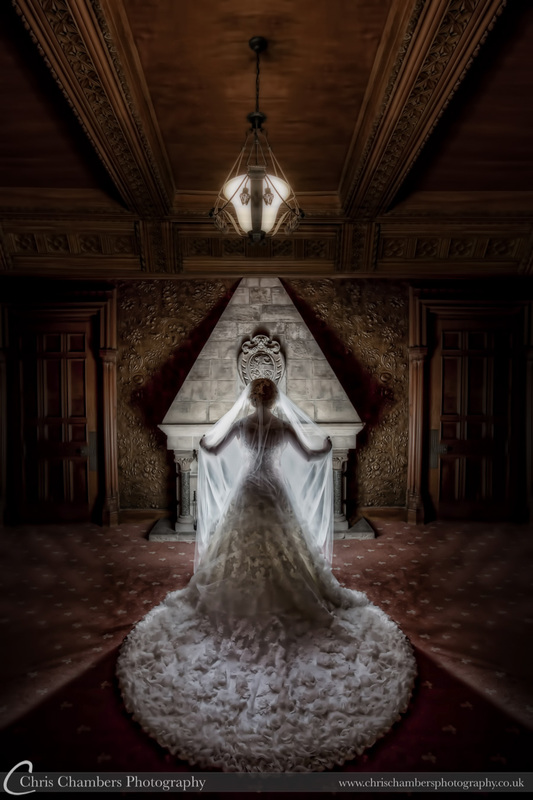 This wedding photograph was awarded a Gold by the Guild of Photographers and was also voted as members choice photograph of the year. 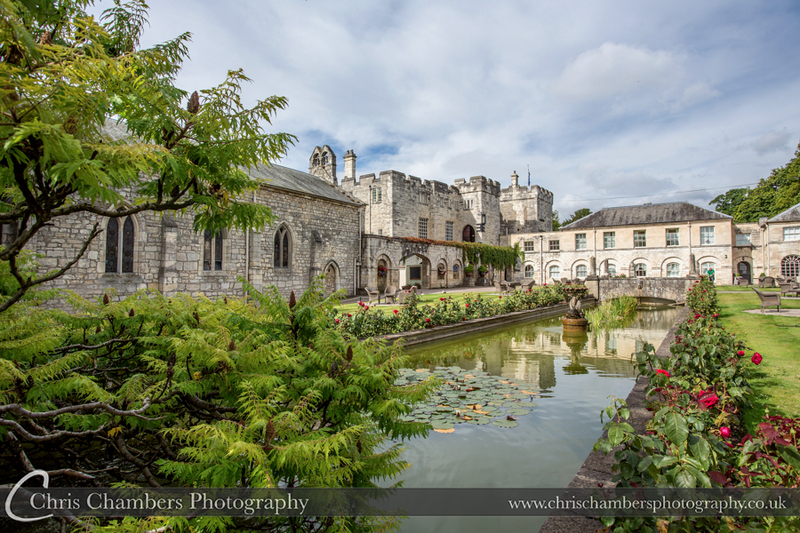 Hazlewood Castle wedding photography. 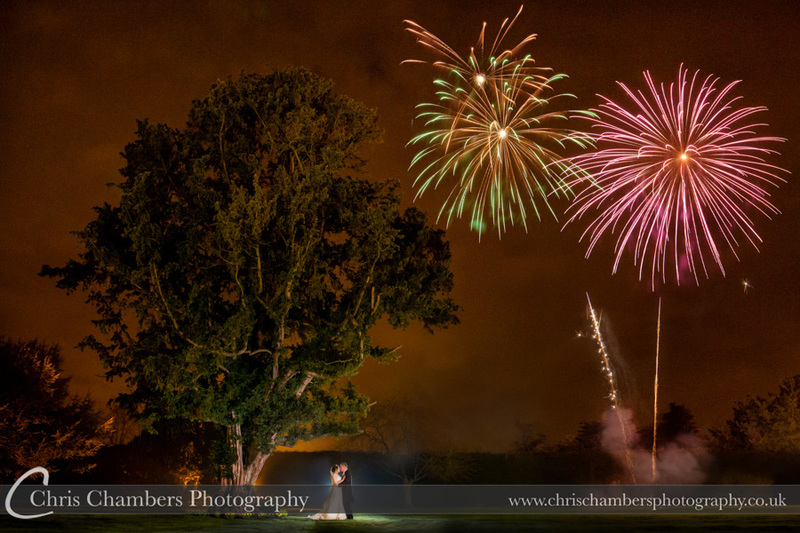 Firework display outside Ripley Castle for Katie and Davids wedding. 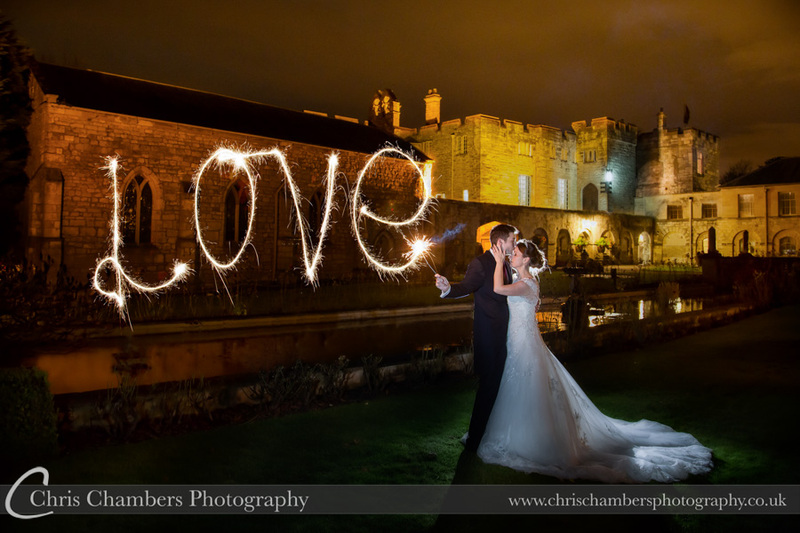 Hazlewood Castle firework display for lump and Peter’s wedding. 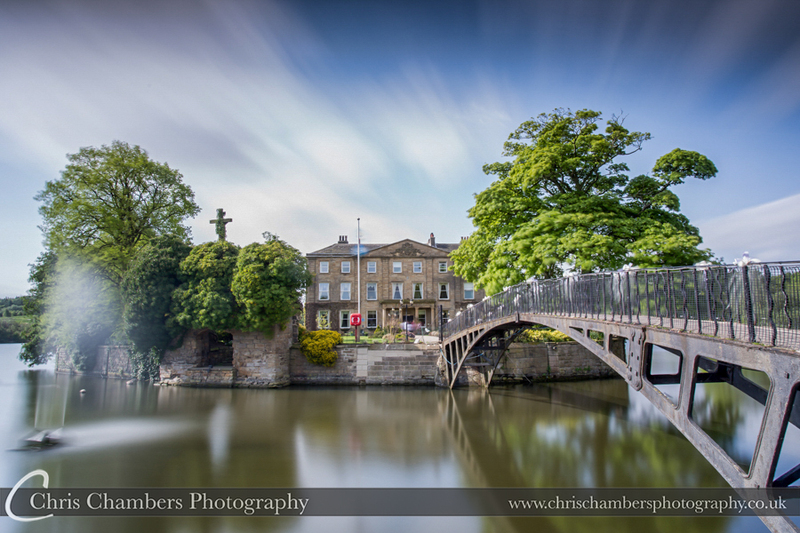 The was a wedding photograph I hadn’t tried before and wasn’t sure it would work, thankfully it did. 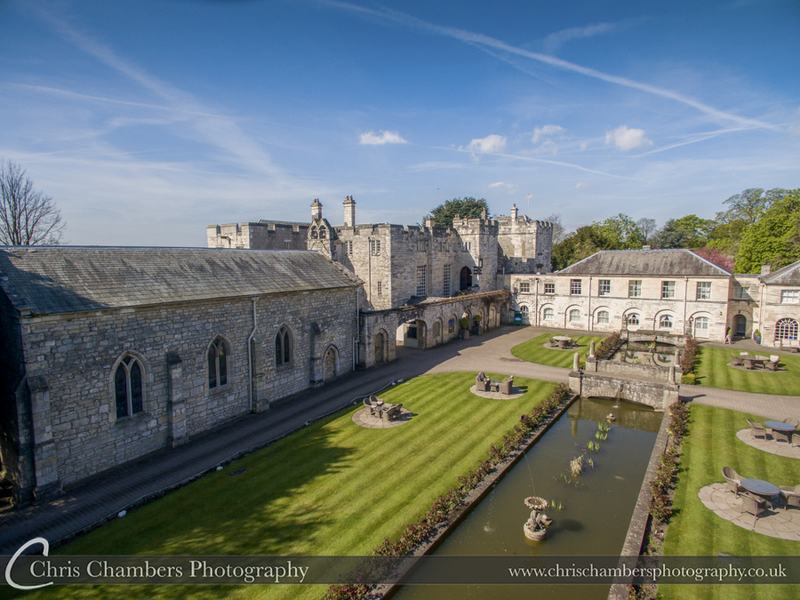 Hazlewood Castle wedding photography. The last photo in their wedding album. 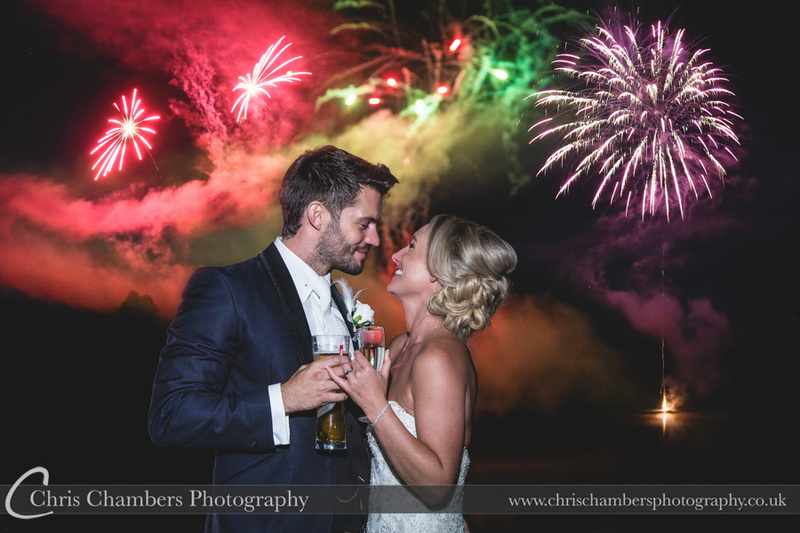 Katie and David enjoying the fireworks at their wedding at Ripley Castle. 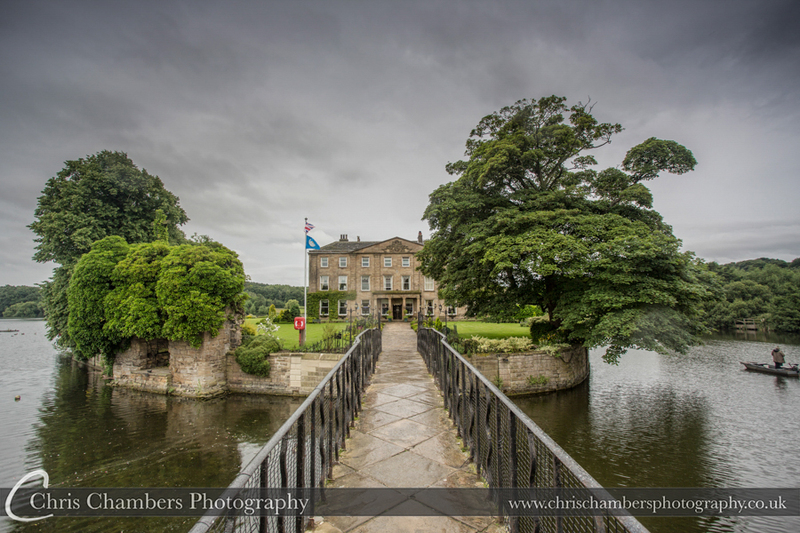 Ripley Castle wedding photographer. 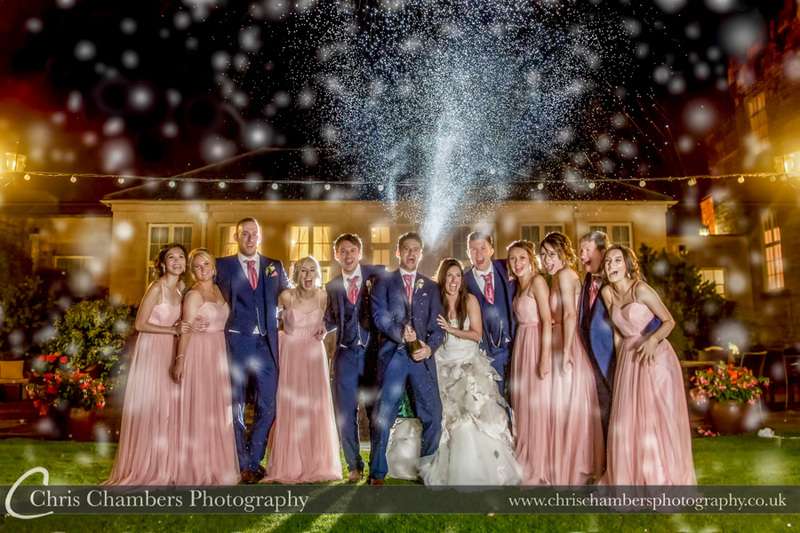 The bridal party spray champagne at me at Hazlewood Castle in North Yorkshire. 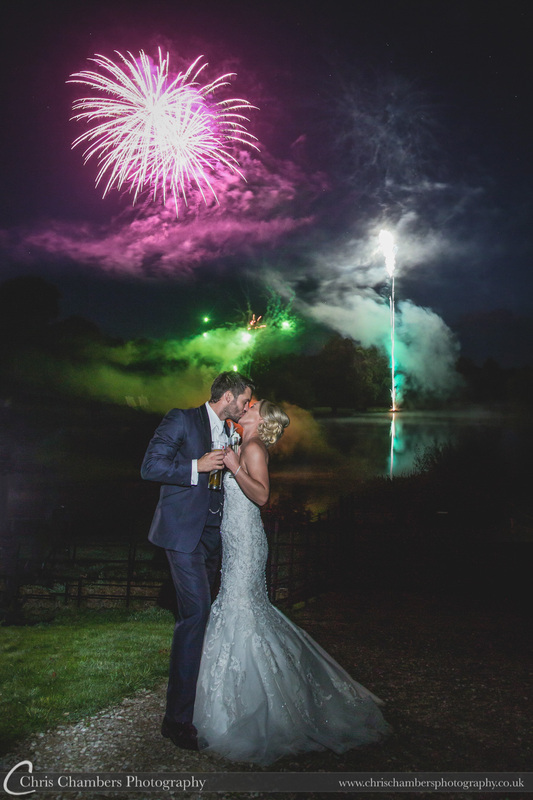 I had suggested this photograph to Gary and Sally before the wedding day and just after the firework display we all got together to create this wedding photograph. 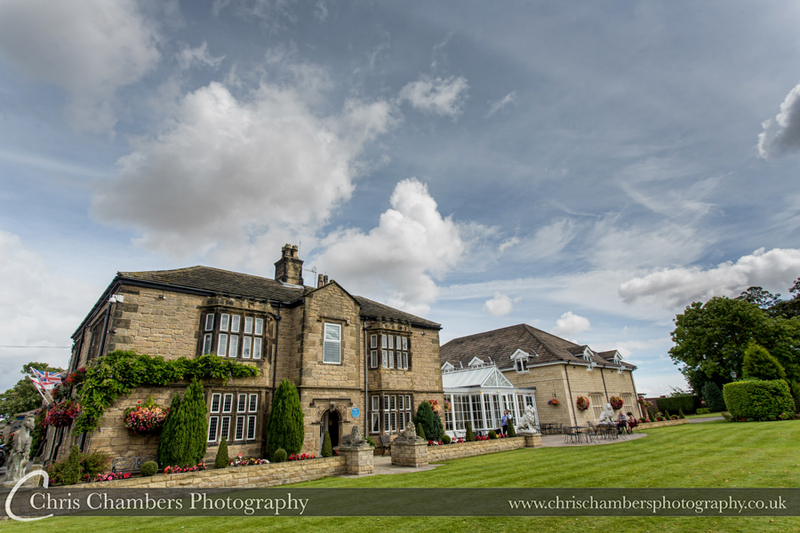 Amy and David recently collected their wedding album featuring their wedding photographs from Gomersal Park Hotel in West Yorkshire. 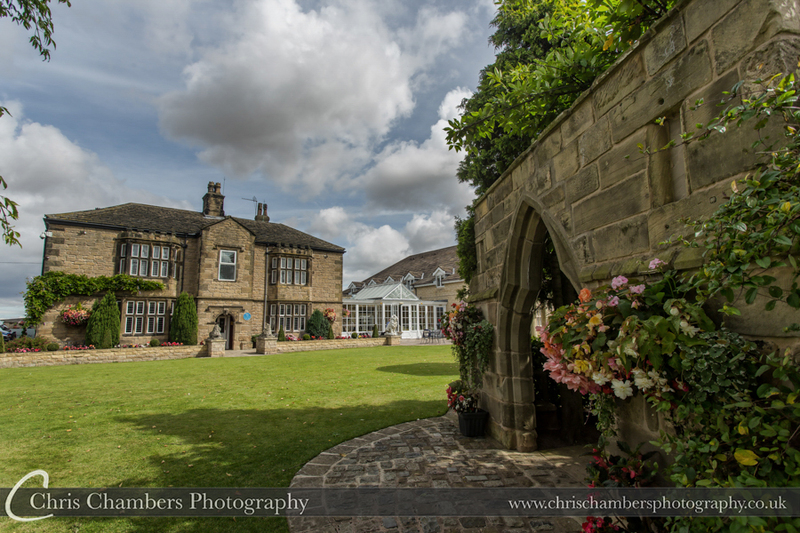 Married in the summer at Gomersal Park Hotel, their stunning Reportage wedding album features white core black bevel pages in a plain black leather cover. The matted reportage albums have a timeless feel with the traditional photographs mounted behind the mat overlays. 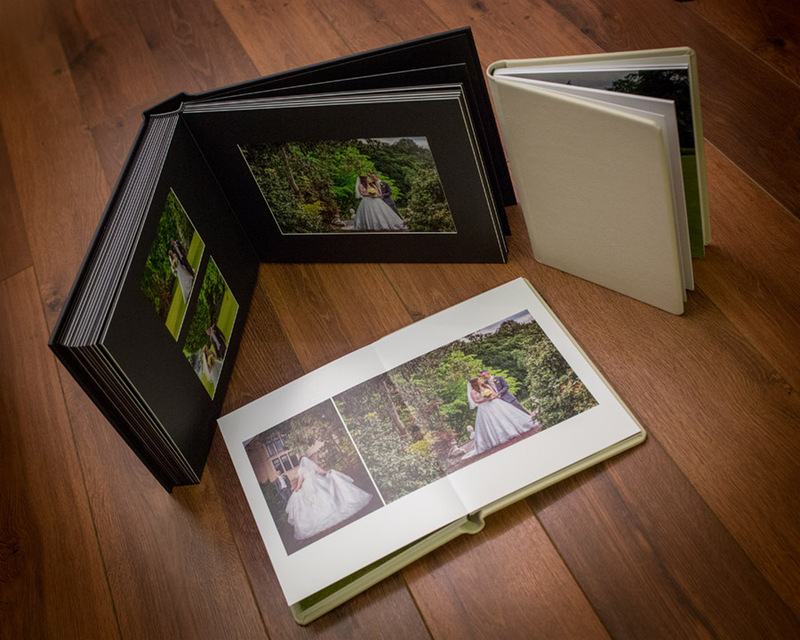 David and Amy also ordered two bespoke parent copies, the parent copies are Italian made storybook wedding albums with cream leather covers. 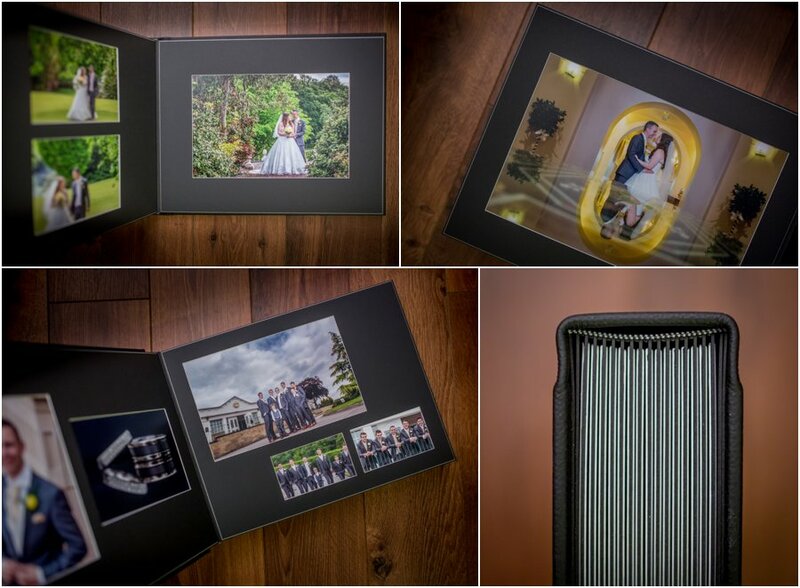 The reportage wedding album features black bevel cut overlays with a white core centre. 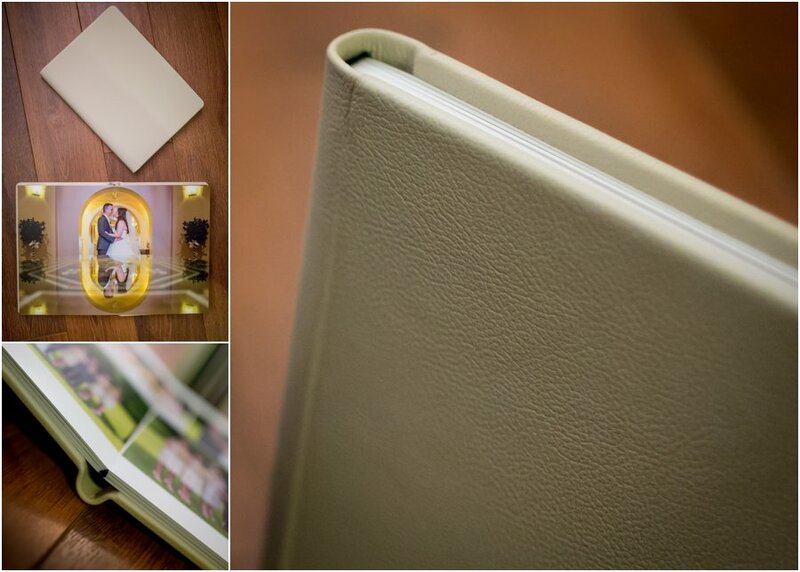 The album will display upto nine images per page, hand made and wrapped in a soft black leather cover. 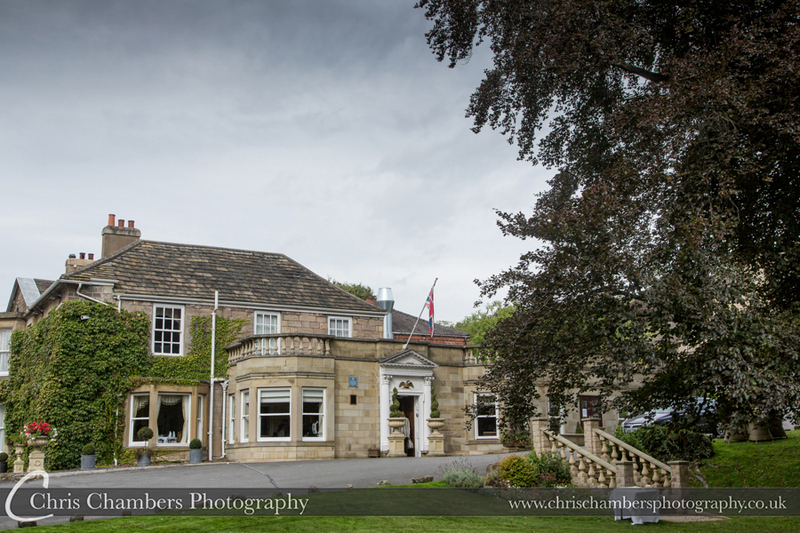 David and Amy’s main wedding album and two parent copies from their wedding at Gomersal Park Hotel. 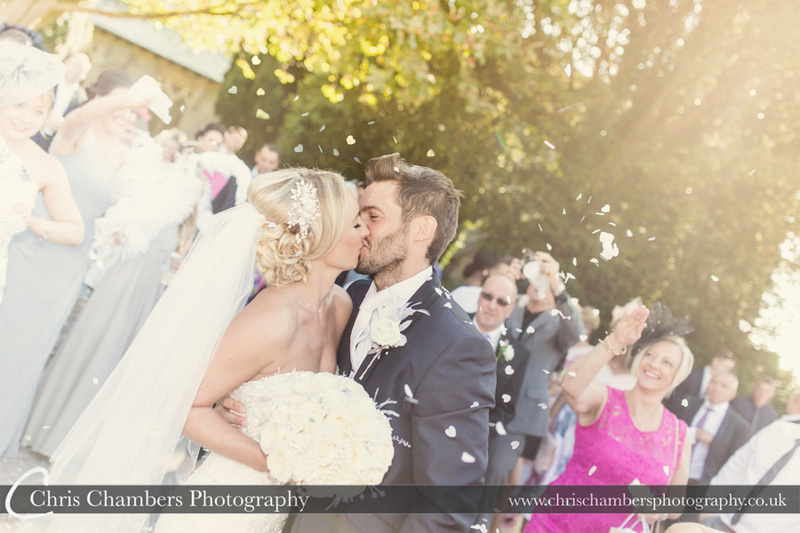 All photographs copyright Chris Chambers Photography. 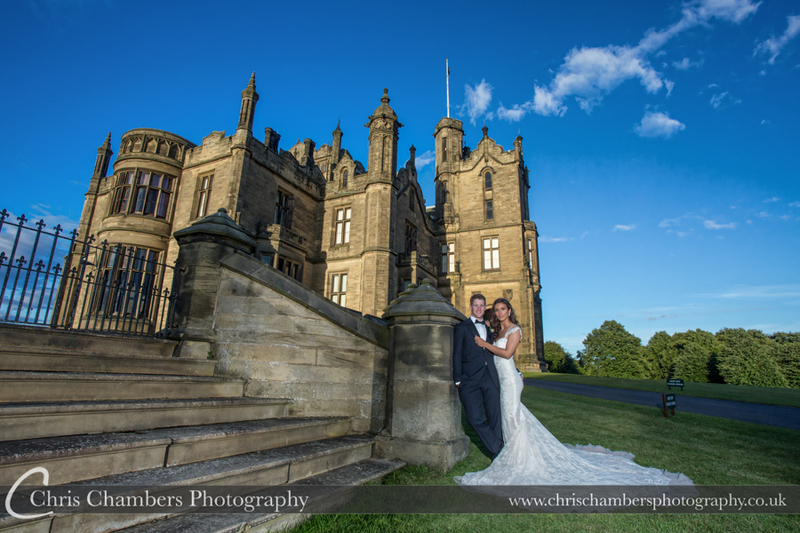 Matt and Elles were married at the stunning Allerton Castle, North Yorkshire at the end of July this year. 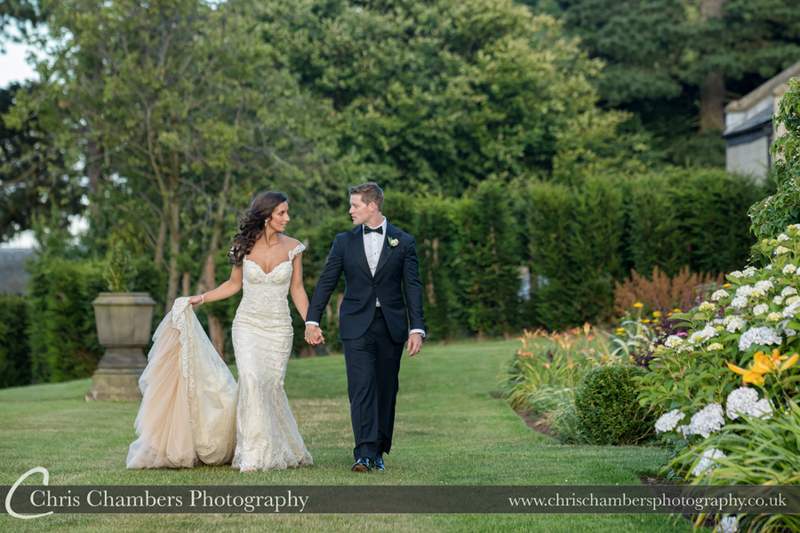 Amazing weather complimented a superb day with the guys in black tie and Elles wearing a truly stunning wedding dress from Galia Lahav. I won’t bore you with words, look at the photos! 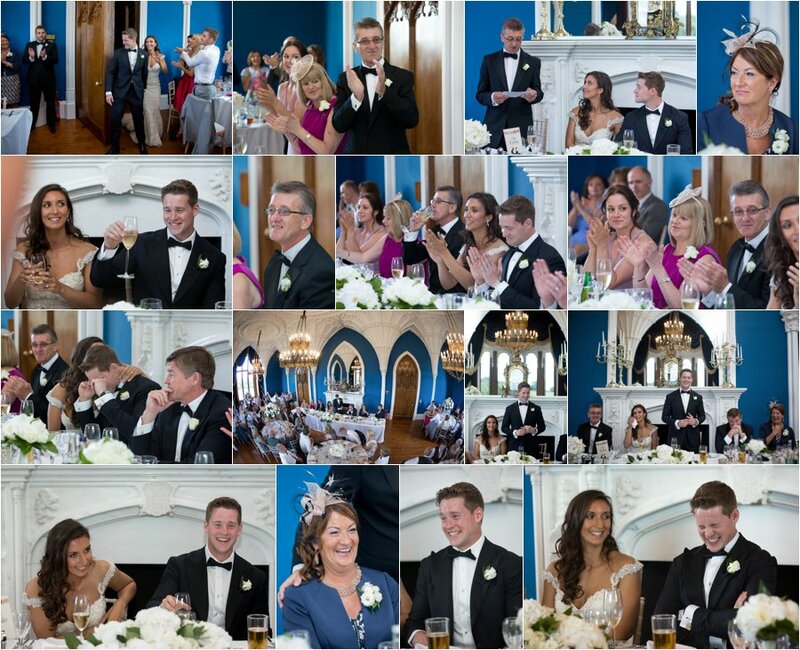 The images we have featured in this blog post include many of the wedding photographs that we used on the same day slide show at Matt and Elle’s wedding. 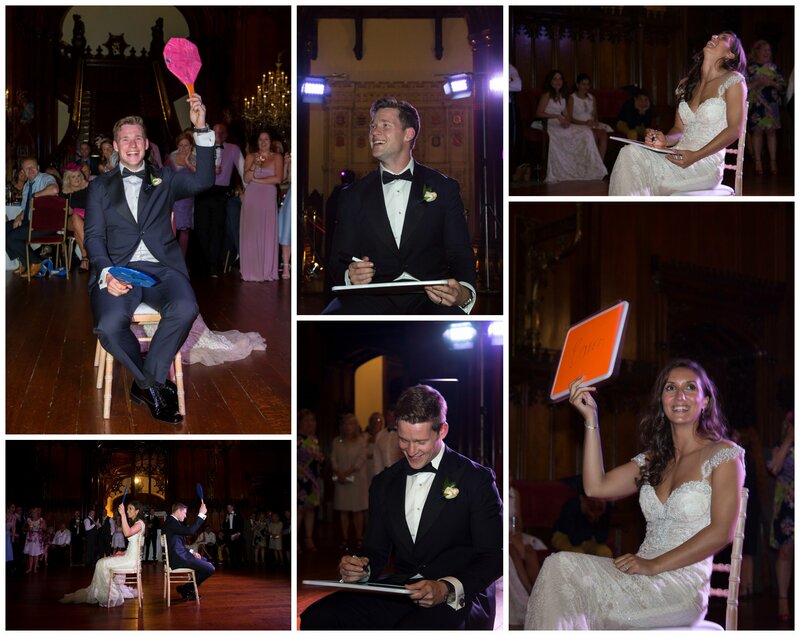 The same day slideshow is included with all Allerton Castle wedding photography packages. Full details here. 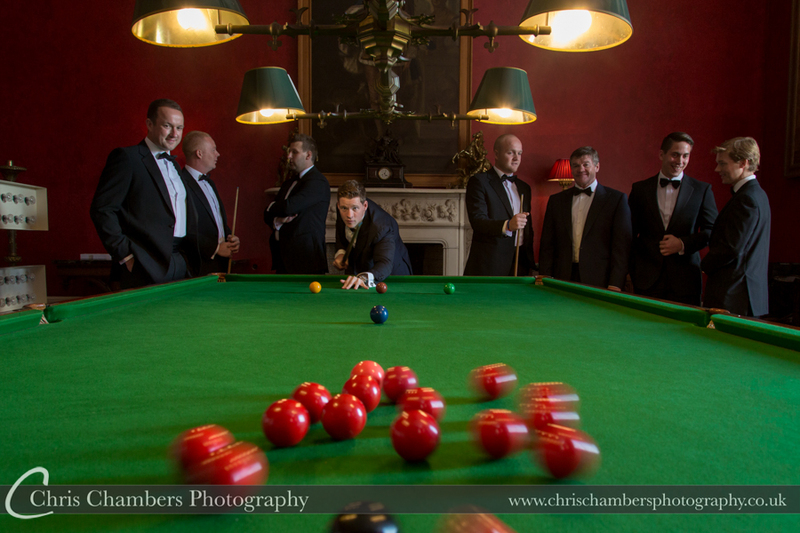 Matt and the guys getting ready in the billiard room before the wedding ceremony. 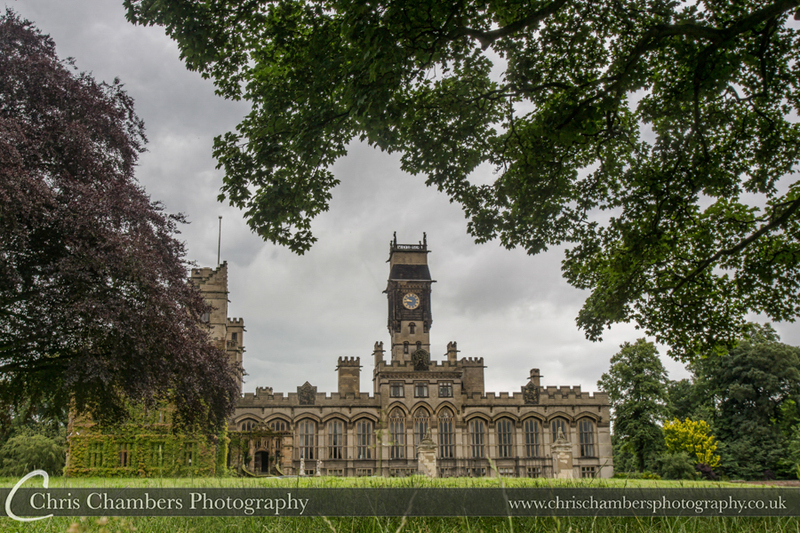 Wedding Photography at Allerton Castle. Bridal preparations in the Palace Suite at Allerton Castle – Where possible we like to capture the reaction from the father of the bride when he first sees his daughter, often this is an emotional moment and over the last few years we’ve seen many a father in tears, today was no exception. 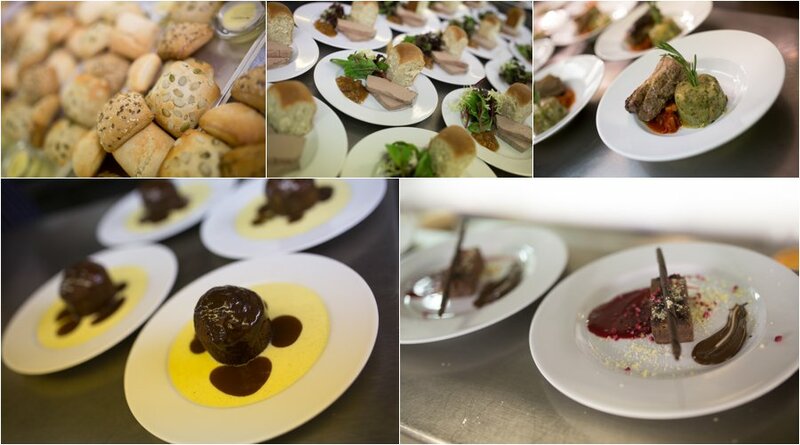 We don’t often include photographs of the wedding breakfast food but had been asked by the caters at Allerton to create images of the wedding breakfast before it was served. 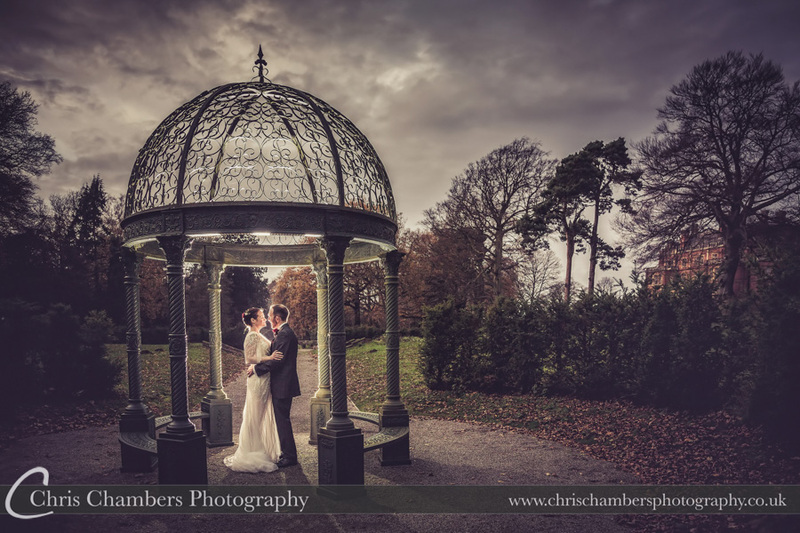 Chris Chambers Wedding Photography are proud to be recommended by Allerton Castle for our wedding photography services. 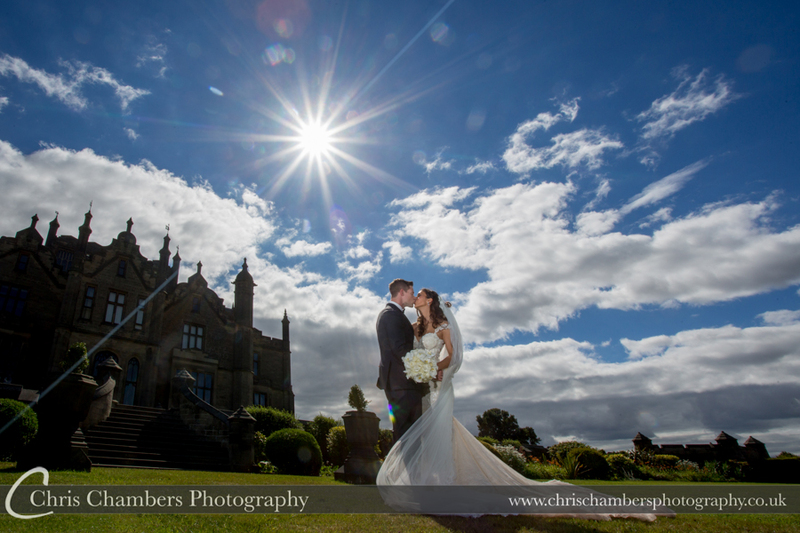 You can find more examples of our wedding photographs at Allerton Castle here. 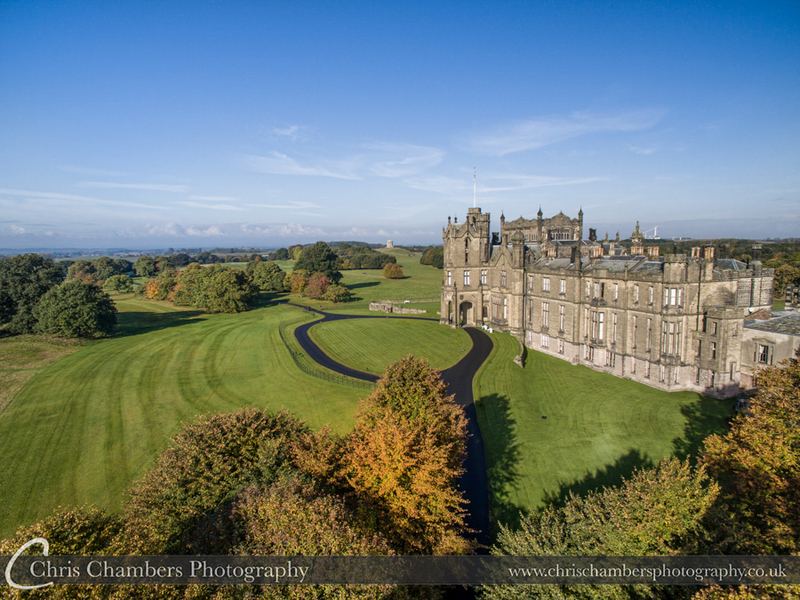 For details of weddings at Allerton Castle the website can be found here. 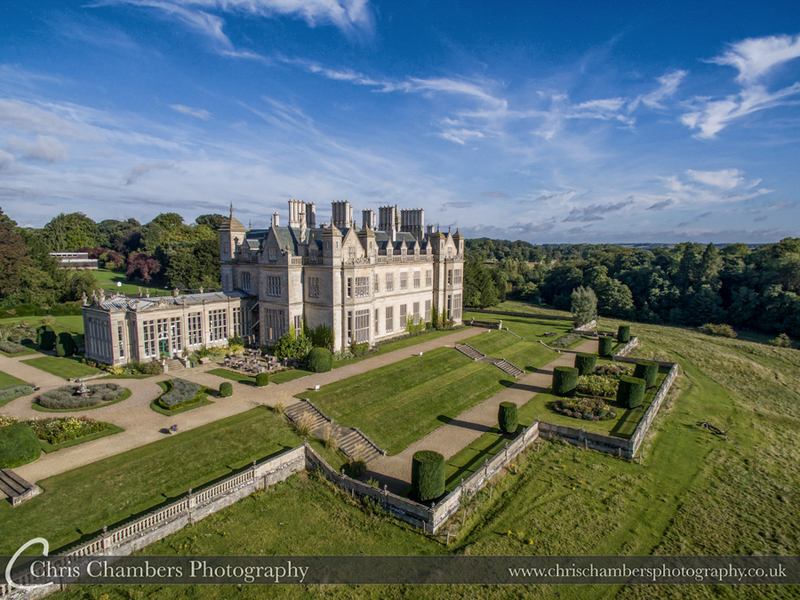 Allerton Castle a picturesque North Yorkshire wedding venue that offers a grand and elegant backdrop for your perfect wedding photographs. 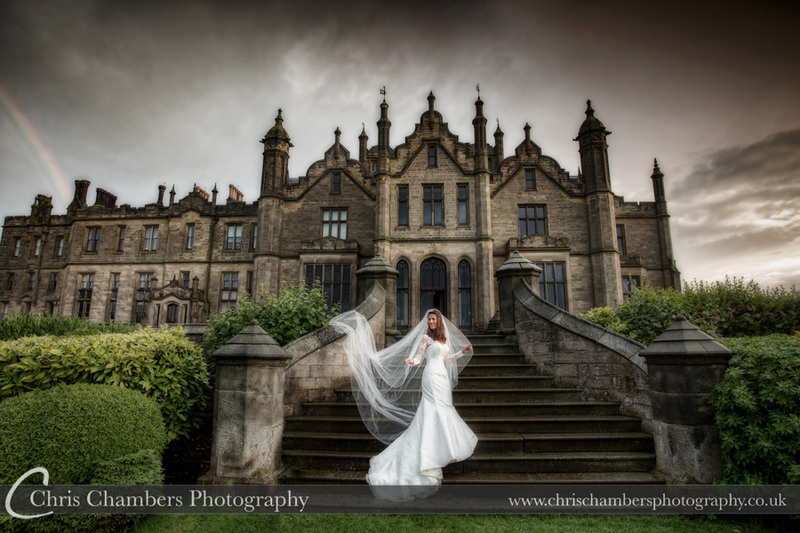 The 19th Century gothic house is set back in the rolling Yorkshire landscapes offering endless possibilities of photographic locations regardless of the weather on your wedding day. 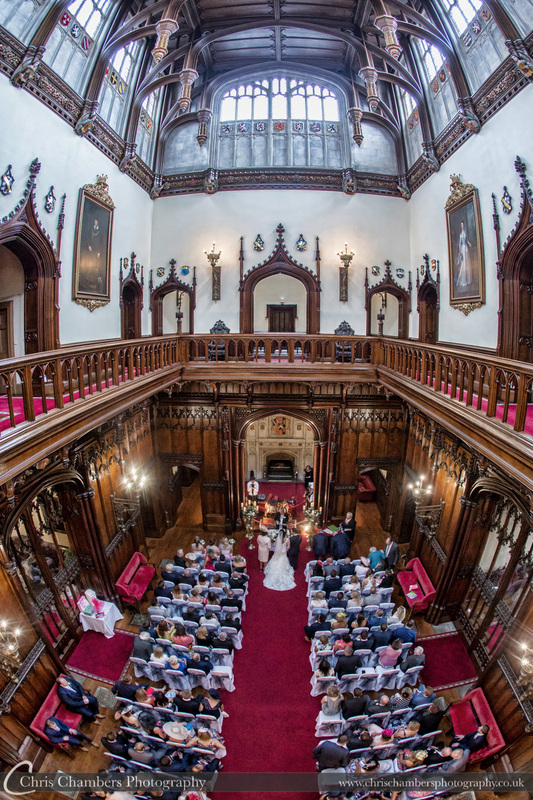 Allerton Castle in Allerton Mauleverer offers the perfect escape from the hustle and bustle of the outside world as you feel like royalty in the grand hallway as you say your ‘I Do’s’. 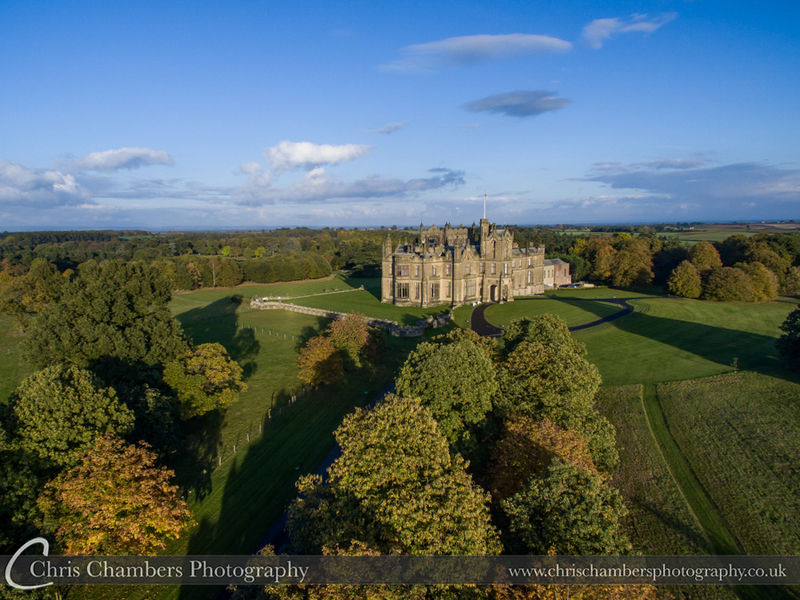 To see more photographs of Allerton Castle click here. 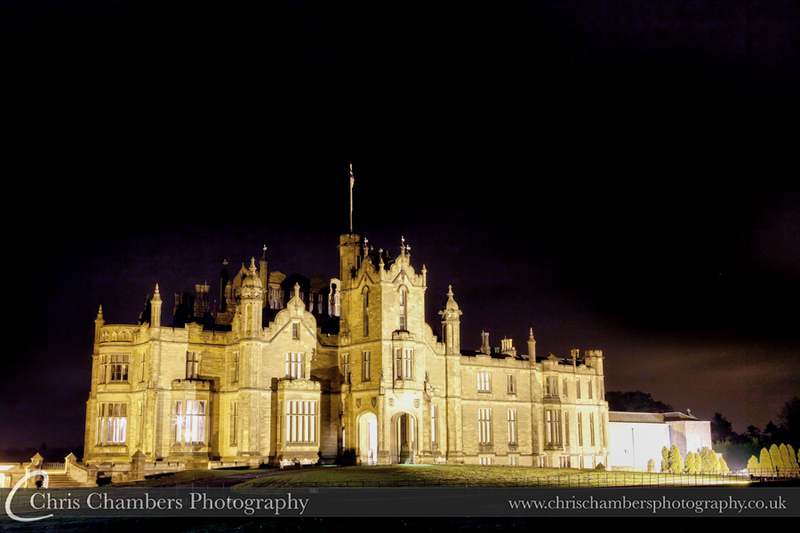 A stunning backdrop to night time photographs, Allerton Castle after dark. 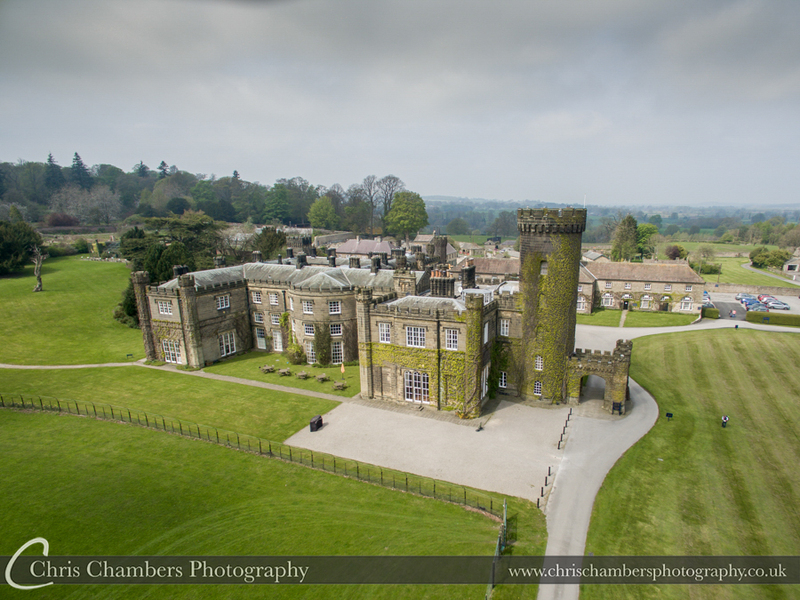 Allerton Castle is set in acres of stunning grounds with amazing views and a historic castle backdrop. 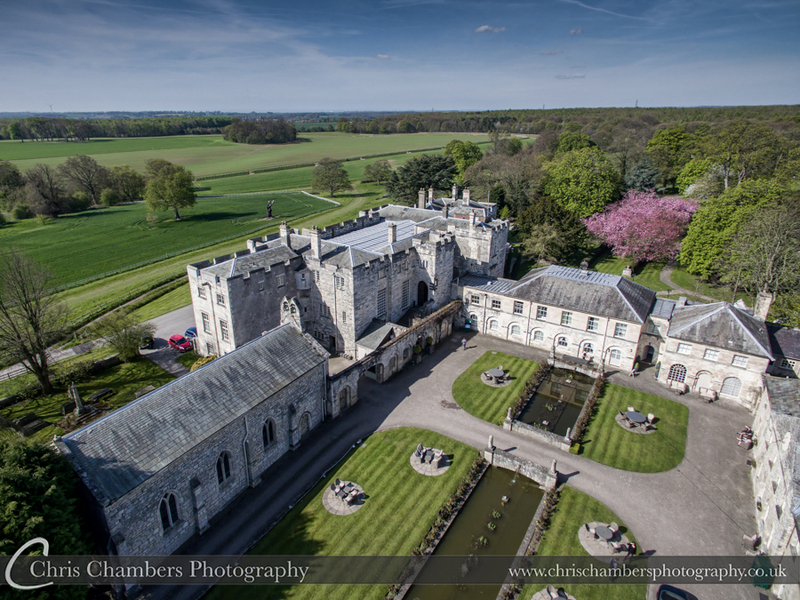 Hazlewood Castle set back in North Yorkshire, surrounded by stunning landscapes offers a dream location for your perfect wedding day. 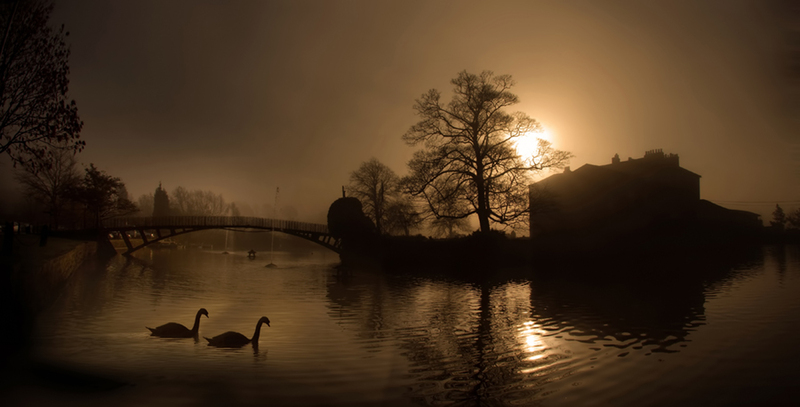 With a close by location to Leeds and York it offers plenty of access to nearby cities without feeling like it’s near to anything at all. 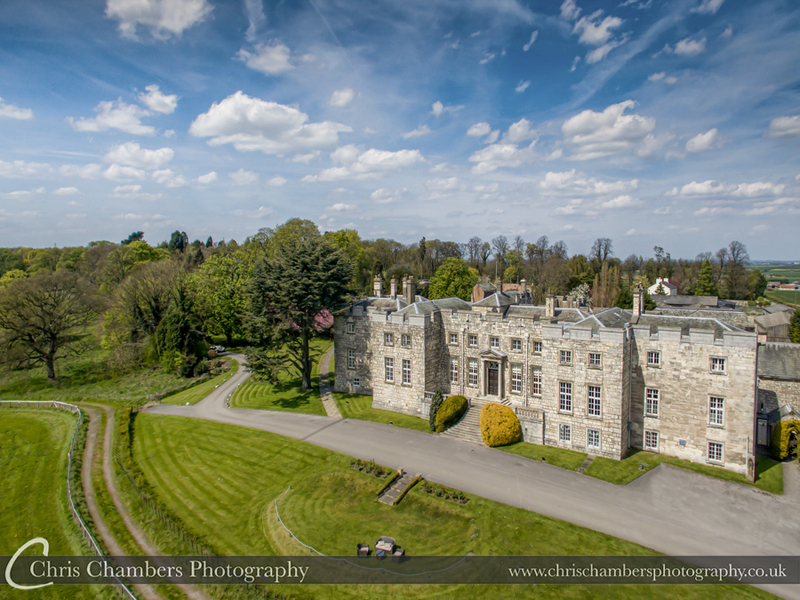 With a long winding driveway towards Hazlewood Castle on Paradise Lane it transports each and every bride and groom into their Hazlewood Castle wedding day. The courtyard offers the perfect location for your drink reception, whilst the Victoria Room offers a warm and cosy location to put up your feet after a long evening of dancing. 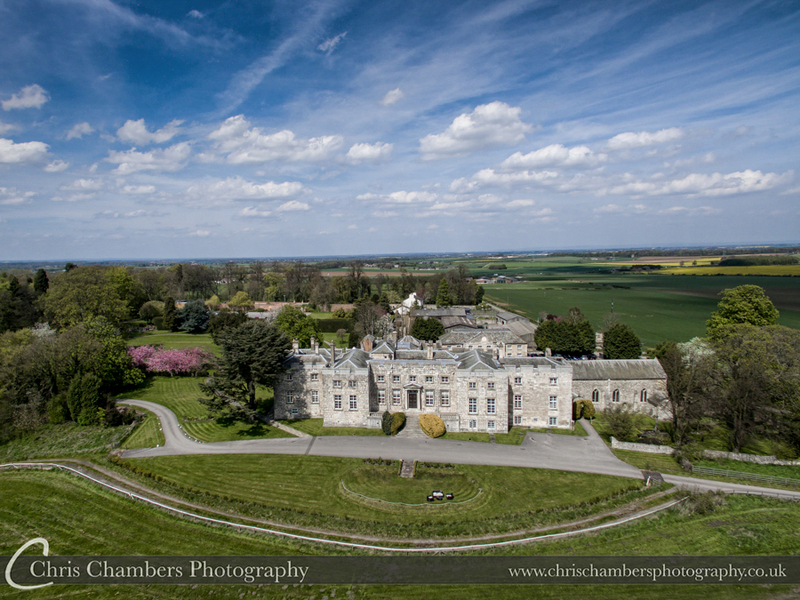 To view more of our Hazlewood Castle photographs click here. 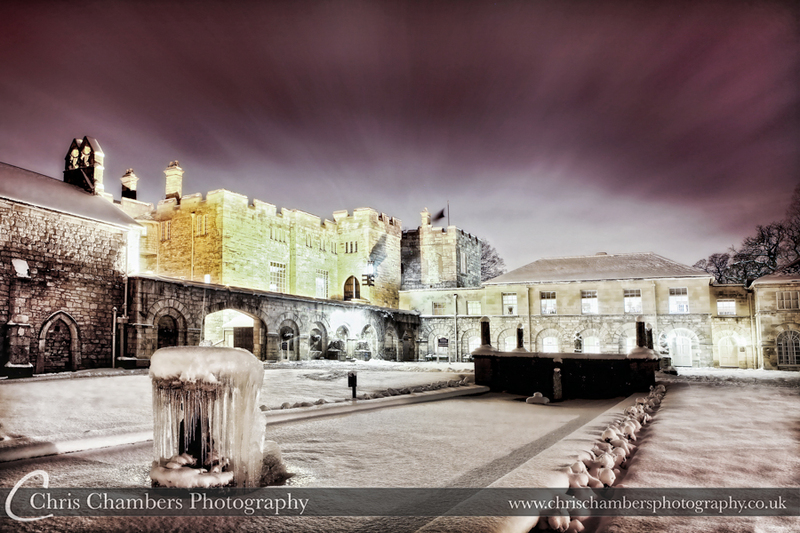 Christmas Card scenes at Hazlewood Castle with a snow covered castle and courtyard. 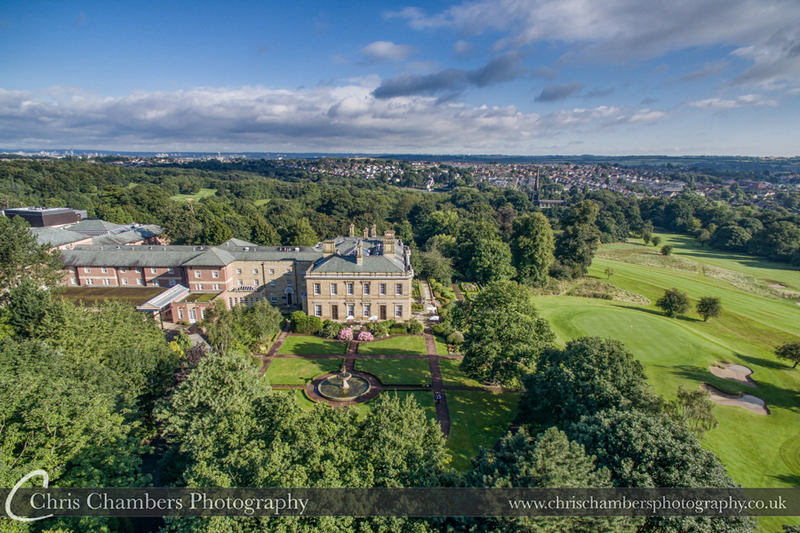 Woodlands Hotel in Leeds offers picturesque gardens and luxurious interior in the boutique style hotel, Perfect for weddings in West Yorkshire, Woodlands has two elegant rooms which are licensed for civil ceremonies and the marquee that can all be used for your wedding day. 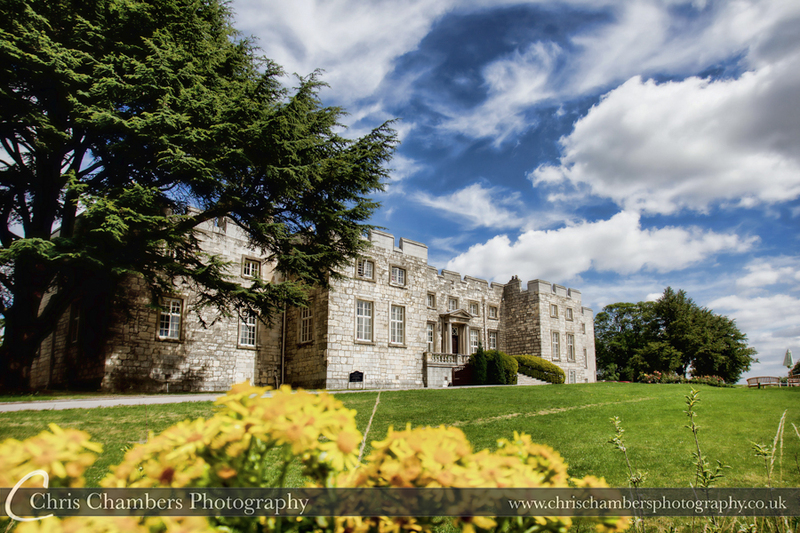 Woodlands Hotel in Gildersome is a stunning location for your wedding and provides the ideal backdrop for your wedding photography. 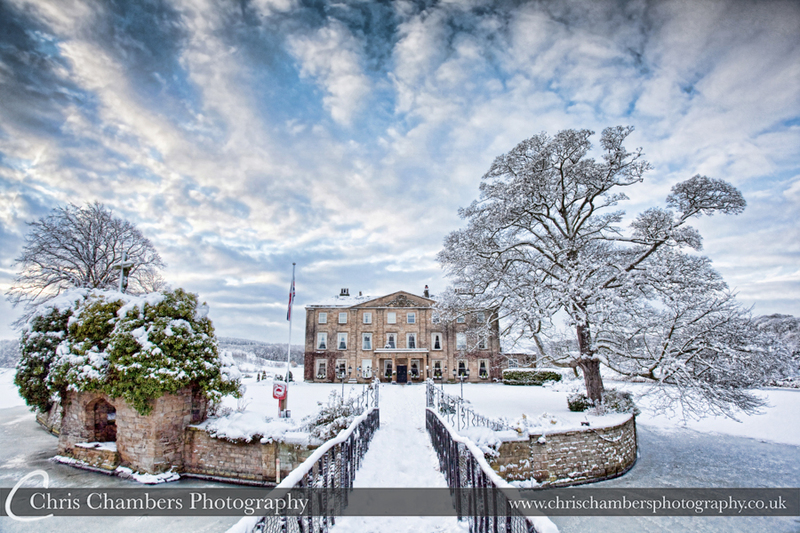 Wentbridge House Hotel is the picturesque intimate wedding venue set back in 20 acres of countryside and surrounded by the breathtaking scenery of West Yorkshire’s Went Valley. 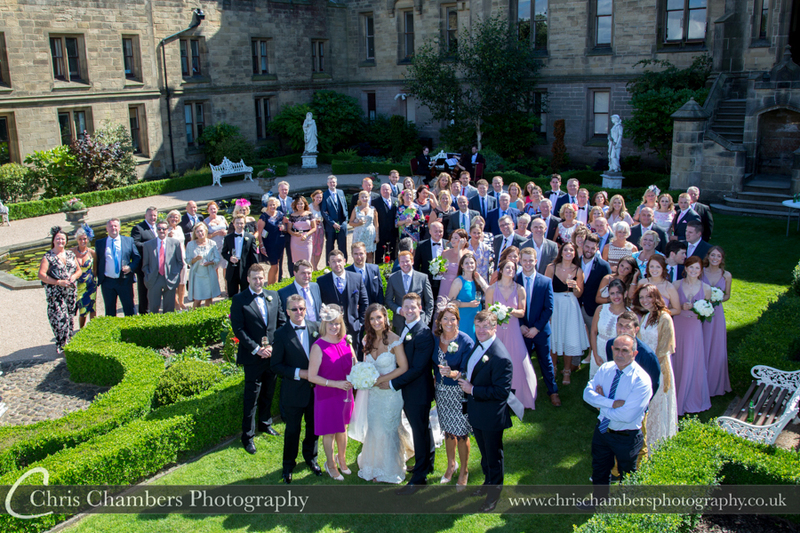 The West Yorkshire wedding venue offers indoor and outdoor wedding ceremony opportunities to suit any season on your dream wedding day. 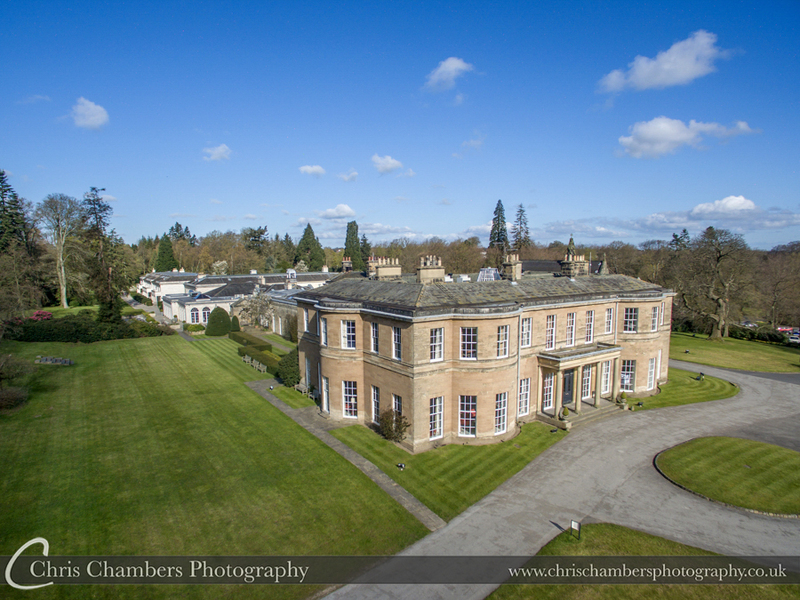 Wentbridge House provides the perfect place to escape in Pontefract. 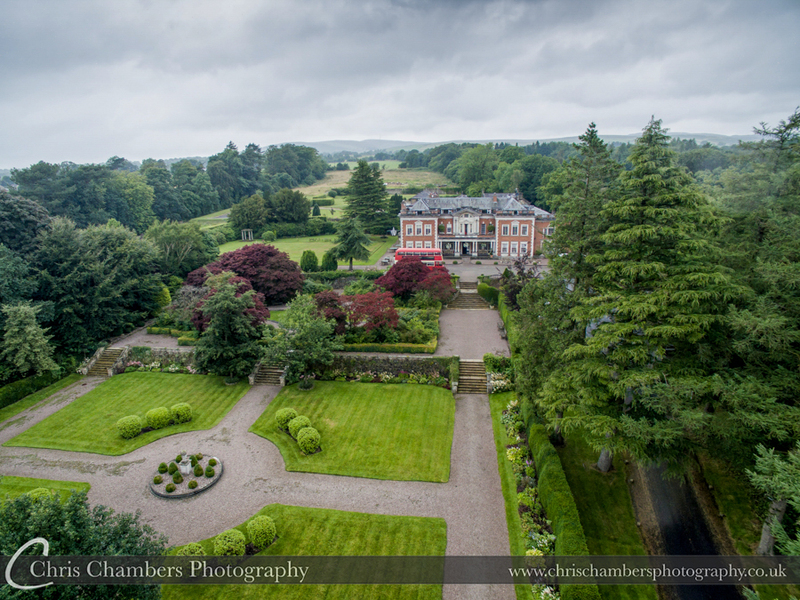 To view more Wentbridge House Hotel photographs click here. 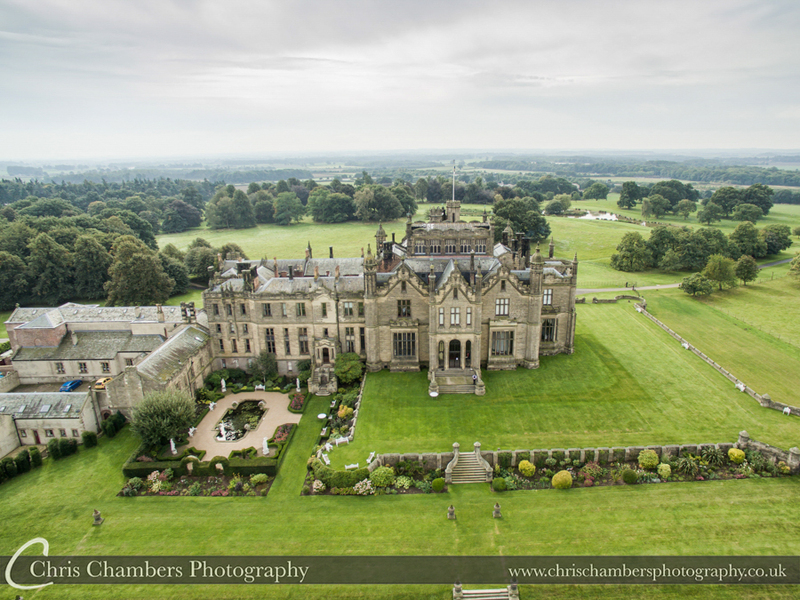 Rossington Hall in Doncaster is a lovely venue which combines a scenic and picturesque locations that makes for the perfect backdrop for your wedding photographs in South Yorkshire offering rolling grounds and plenty of greenery which offers a surreal location for your dream wedding day. 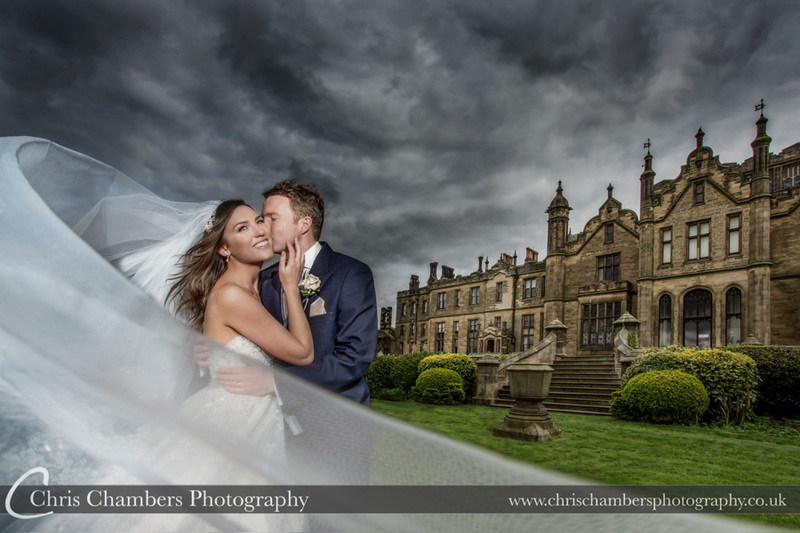 With experience of photographing weddings at Rossington Hall and I can assure that I know the best places for photographs regardless of weather and the time of year. 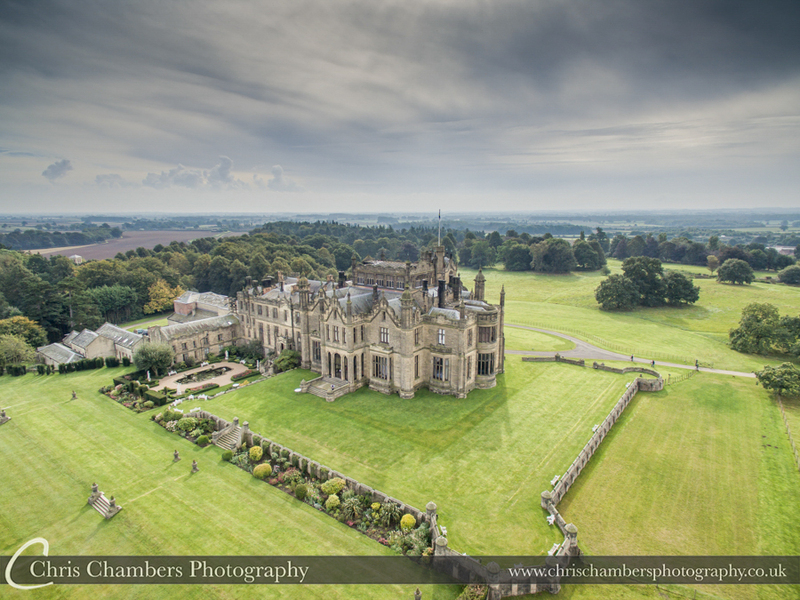 For more photographs at Rossington Hall click here. 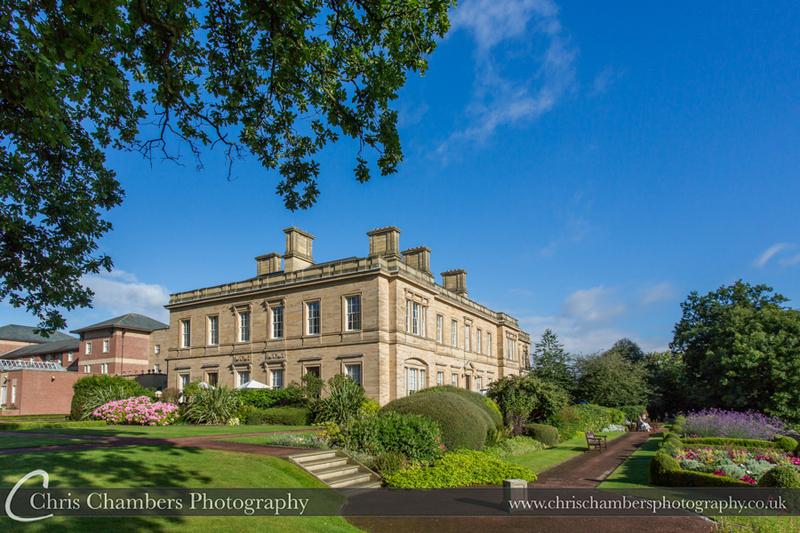 Rudding Park hotel in Harrogate offers beautiful North Yorkshire landscapes around our Grade I listed Regency House, wether a civil ceremony inside Rudding Park or a church wedding in the 19thCentury Chapel it offers a historic and memorable location for your wedding day. 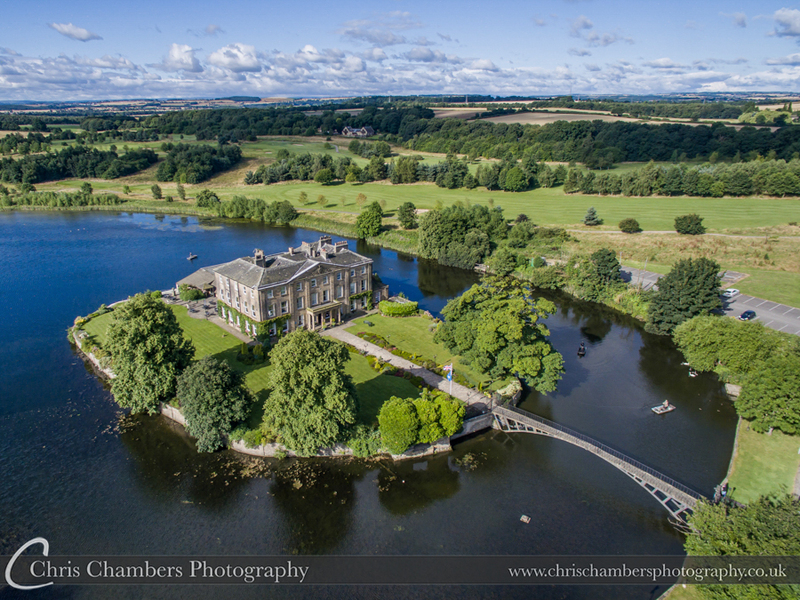 Outside the landscaped gardens and mature woodland make Rudding Park one of the most beautiful wedding venues in Yorkshire. 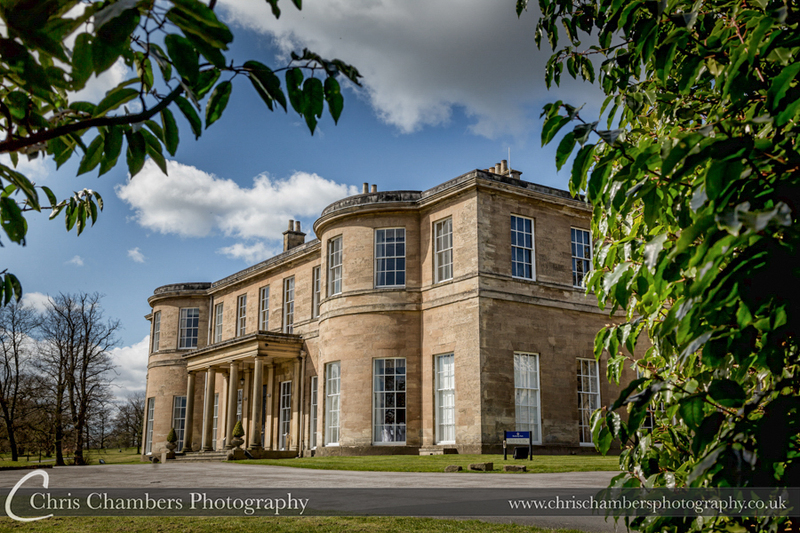 To view more photographs at Rudding Park click here. 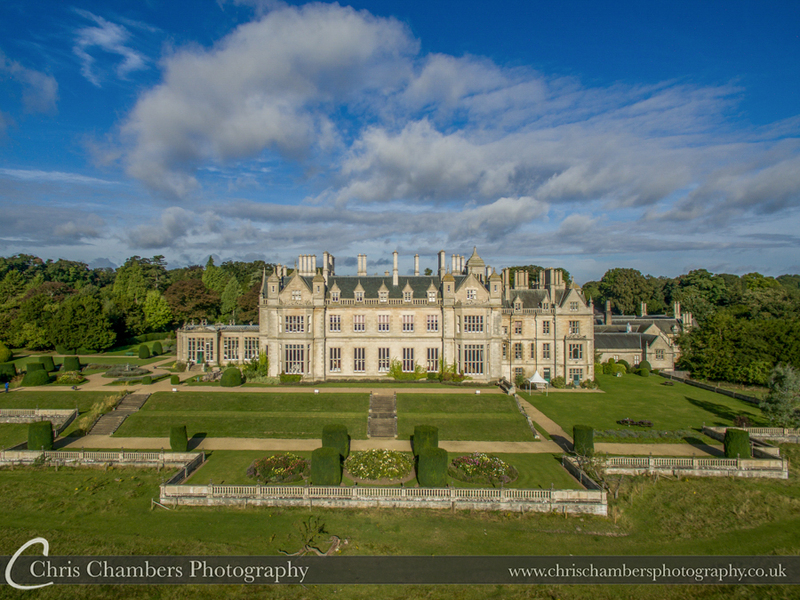 Stoke Rochford Hall the stately rural Hotel in Grantham, Lincolnshire with vast picturesque landscaped gardens offers plenty of wedding photography locations perfect for every season in the twenty eight acres of parkland. 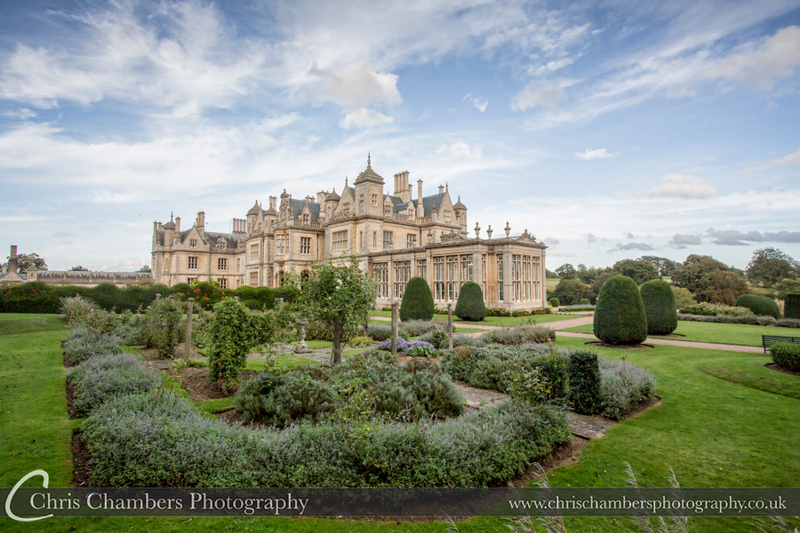 Stoke Rochford Hall is a superb Victorian country mansion and set within formal landscaped gardens. 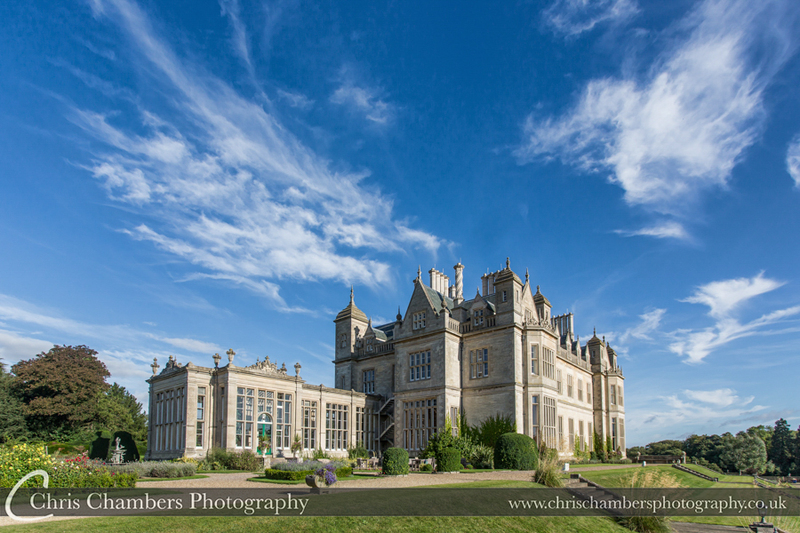 For more wedding photographs at Stoke Rochford Hall click here. 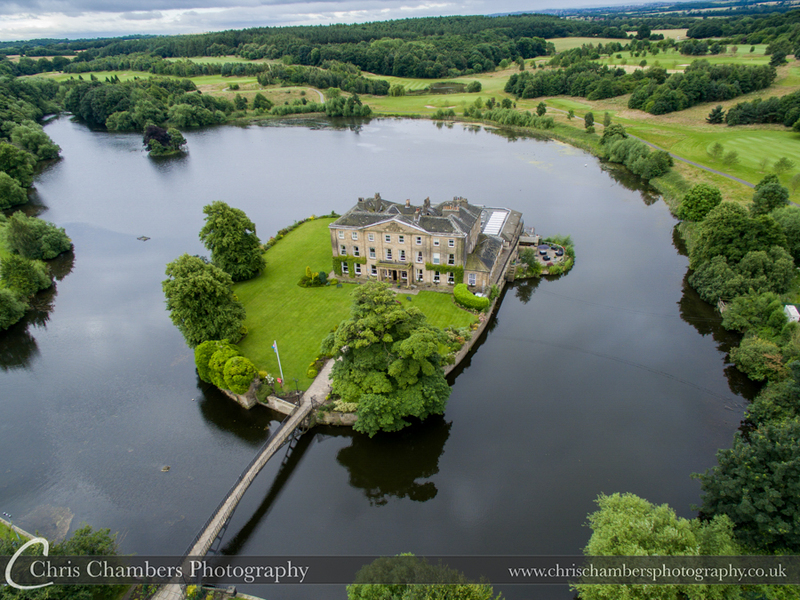 Part two of our wedding venues with images of more local Yorkshire wedding venues with Walton Hall at Waterton Park, Swinton Park near Masham and Rogerthorpe Manor near Pontefract. Scroll down for images of each venue throughout the year. 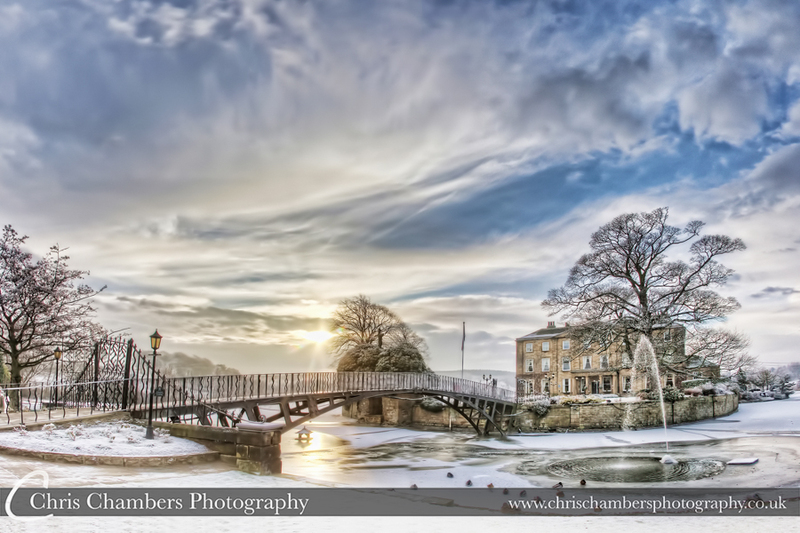 Waterton Park Hotel in Wakefield offers a surreal location either side of the bridge, whichever side of the bridge you chose for your West Yorkshire wedding day the stunning photography locations on and around the island make for the perfect backdrop for your wedding photographs. 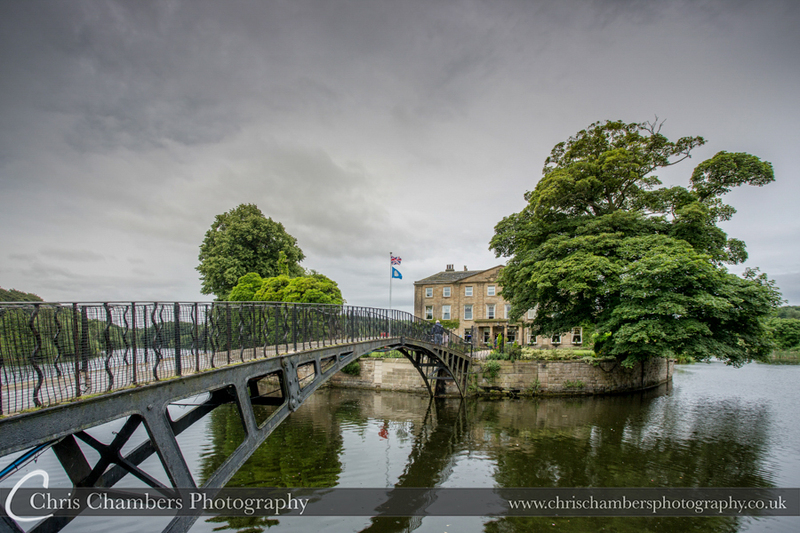 The bridge and archway are prefect for bride and groom wedding photographs, whilst inside on the grand staircase of Waterton Park Hotel, or outside looking out over the lake the Wakefield wedding venue has everything a bride and groom would desire for their dream wedding day. 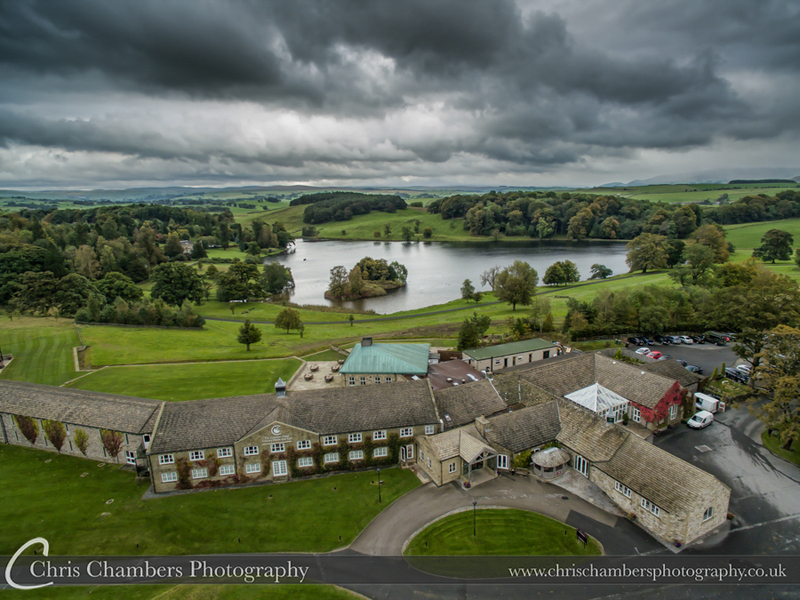 For more photographs at Waterton Park Hotel click here. Above: Autumnal scenes. 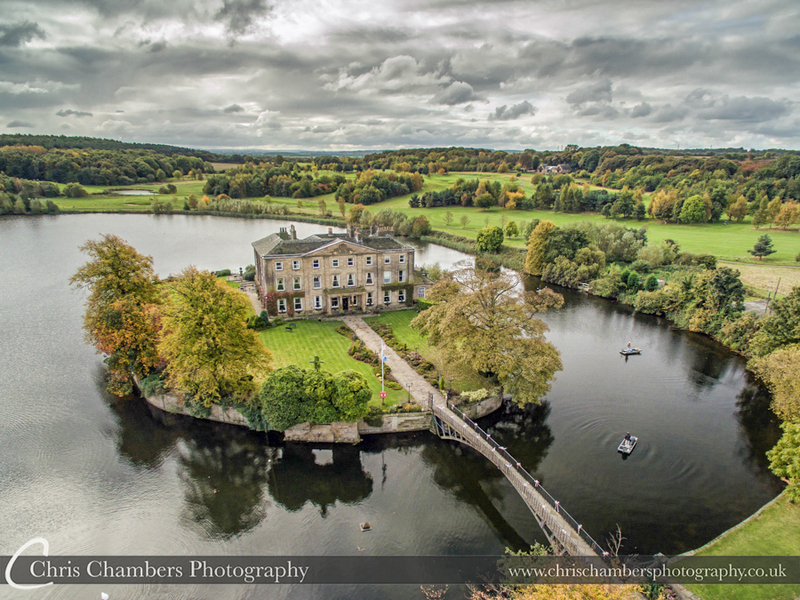 The Walton Hall and the island in October this year ahead of Chris and Emma’s wedding. 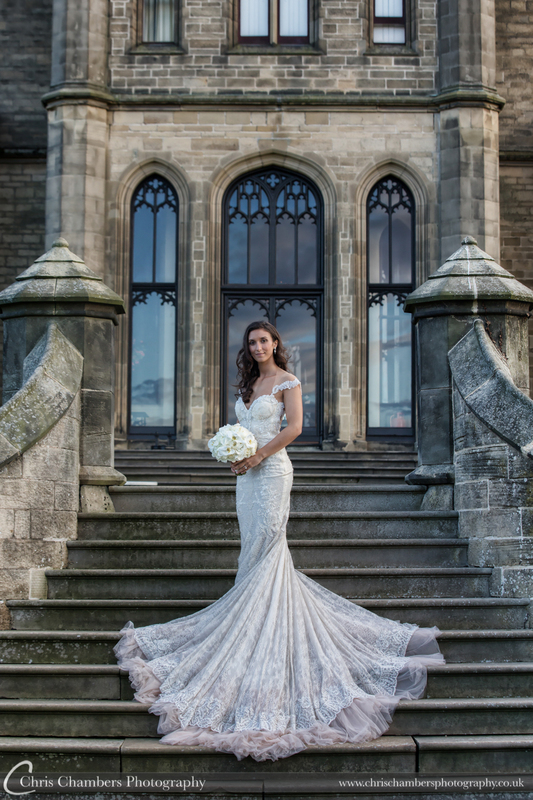 Swinton Park Hotel in Ripon offers an ancestral stately home with grand interiors and exteriors making for an outstanding wedding venue. 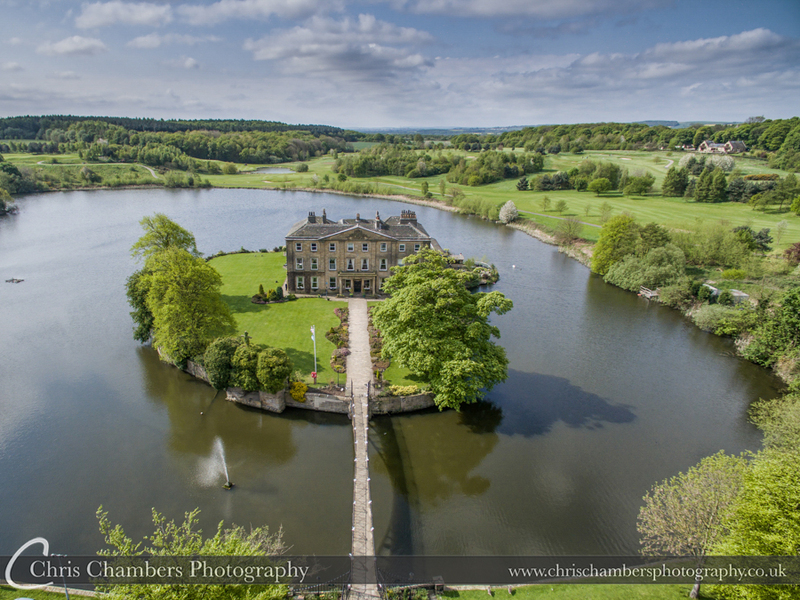 Surrounded by 200 acres of picturesque parkland in the beautiful North Yorkshire Yorkshire Dales, this secluded, luxury hotel and grounds enjoy a spectacular setting. 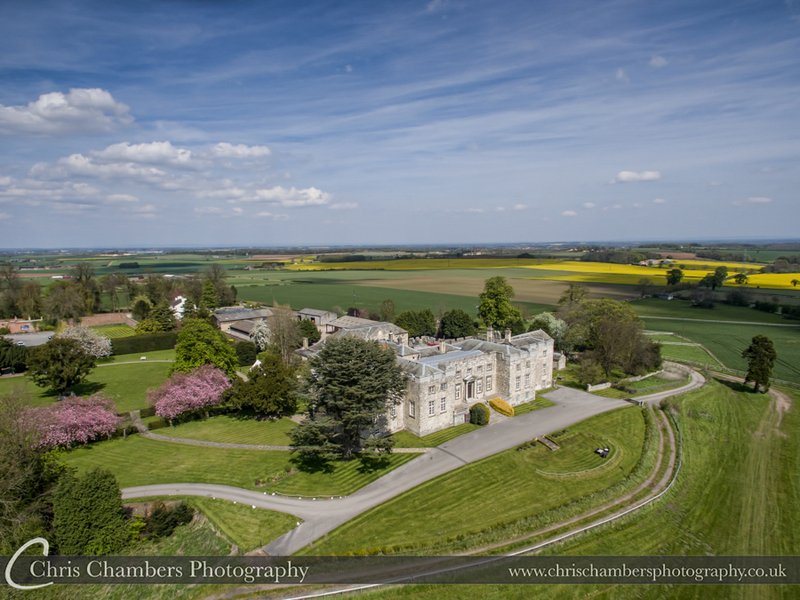 The grandeur of a historic building is complemented by the grand gardens, with deer roaming around and a bird show to allow every bride and groom a close link to the beautiful North Yorkshire nature. 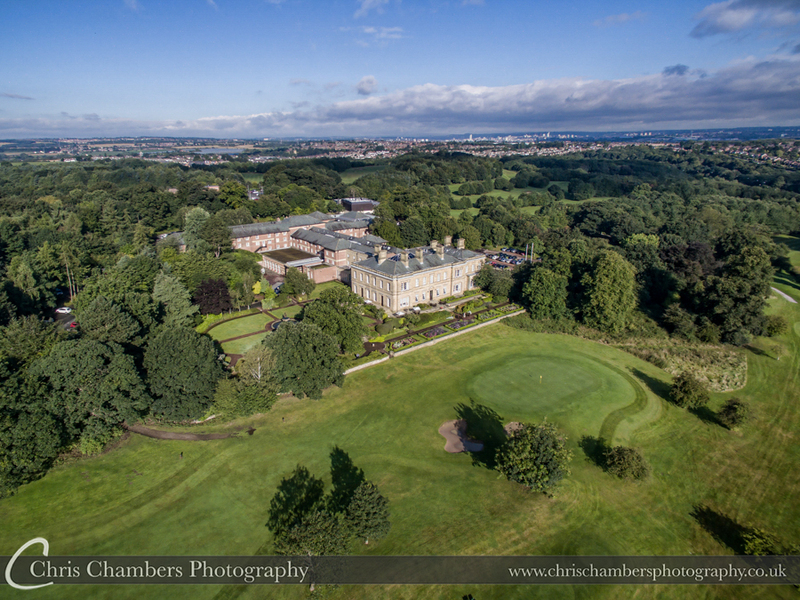 For more Swinton Park Hotel photographs click here. 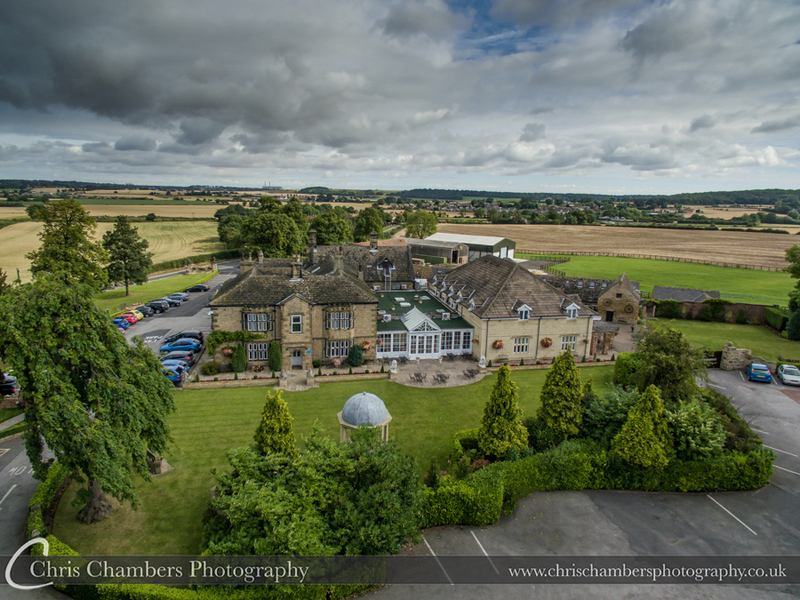 Rogerthorpe Manor wedding venue in West Yorkshire set back in the Yorkshire countryside offers an ideally located wedding venue perfect for every bride and groom in the quiet countryside away from the bright city lights. 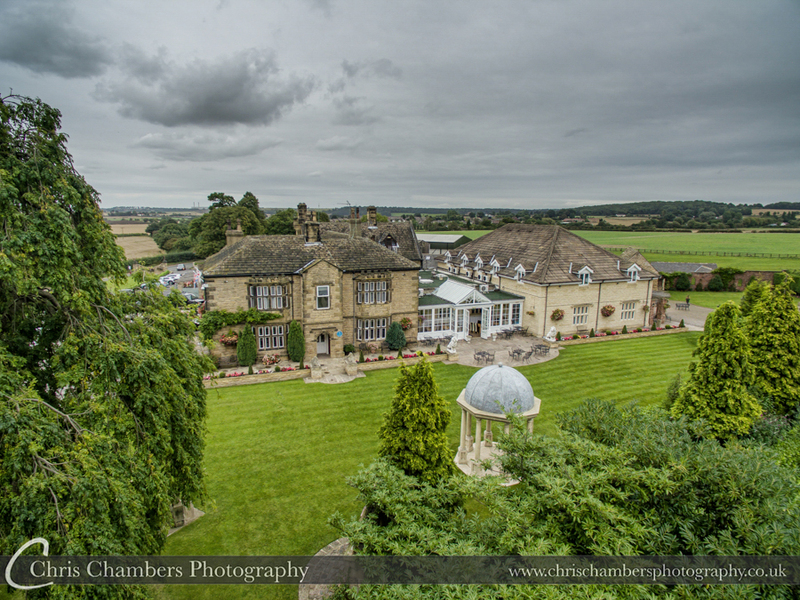 You’ll feel transported into the quiet surreal whirl of your Rogethertorpe Manor wedding day far away from the hustle and bustle of busy towns yet it is close enough to major road links such as the M62 and A1 for ease of access for not only the both of you but all of your wedding guests too. 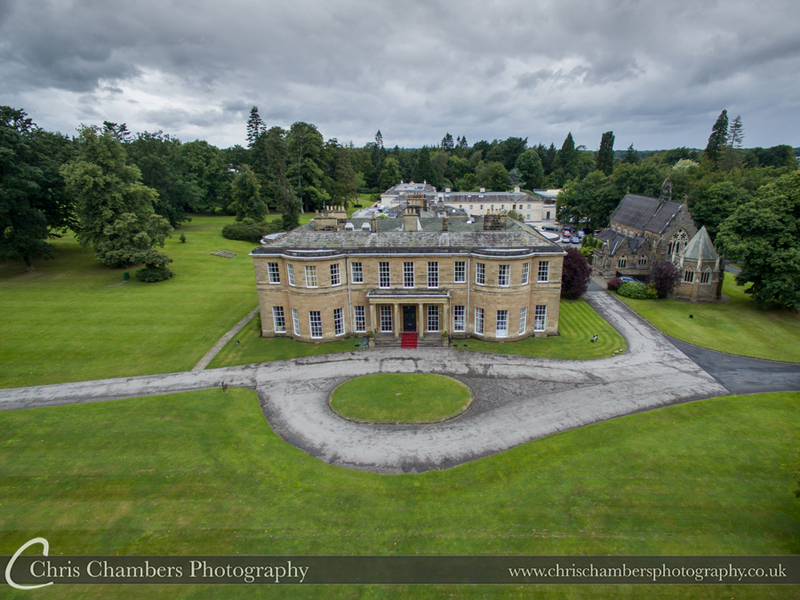 Part three of our wedding venues with images of more local Yorkshire wedding venues with Carlton Towers, Eaves Hall, Denton Hall and Oulton Hall. Scroll down for images of each venue throughout the year. 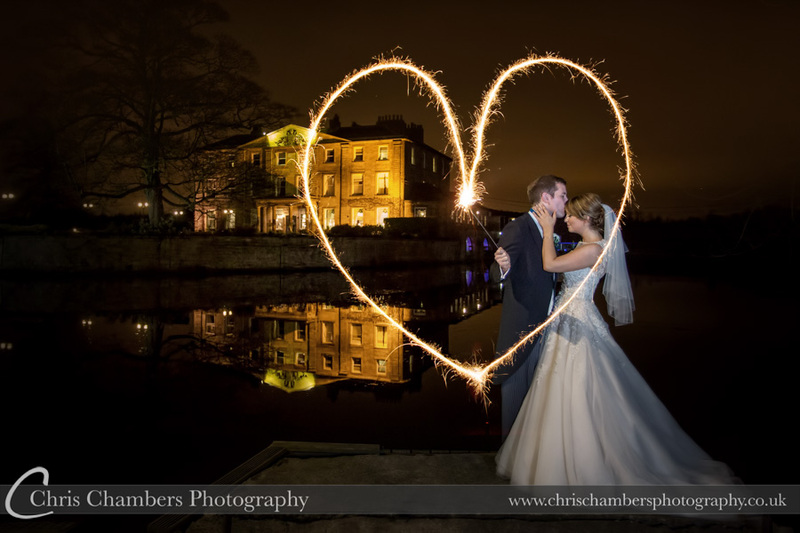 All photographs copyright Chris Chambers wedding photographer Wakefield. 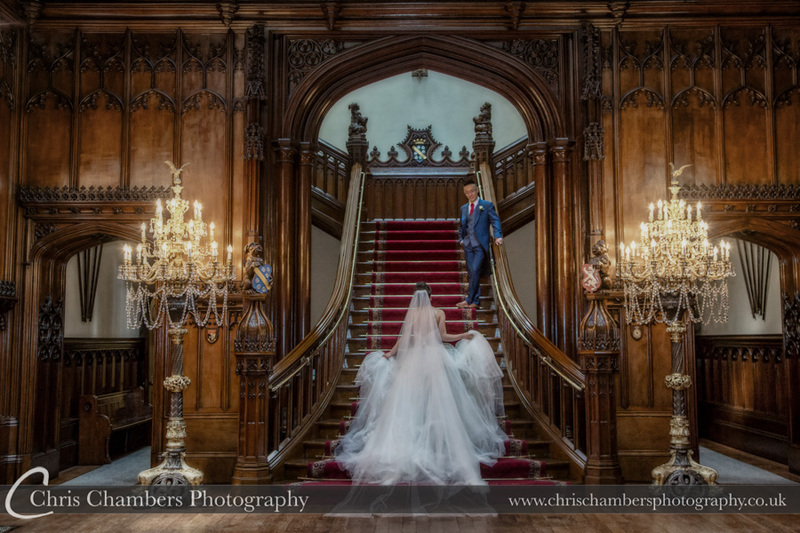 Carlton Towers offers a grand and gothic location for your wedding day, the Grade I listed Victorian gothic country house in Carlton, North Yorkshire offers large chandeliers offering an elegant backdrop for your wedding photographs. 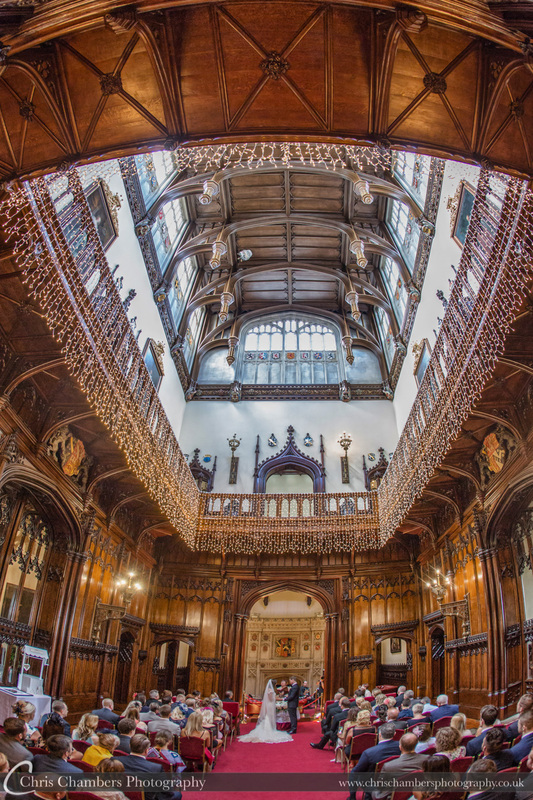 You’re sure to be enchanted by the elegance and beauty of this 17th century hidden gem with both it’s inside and outside. 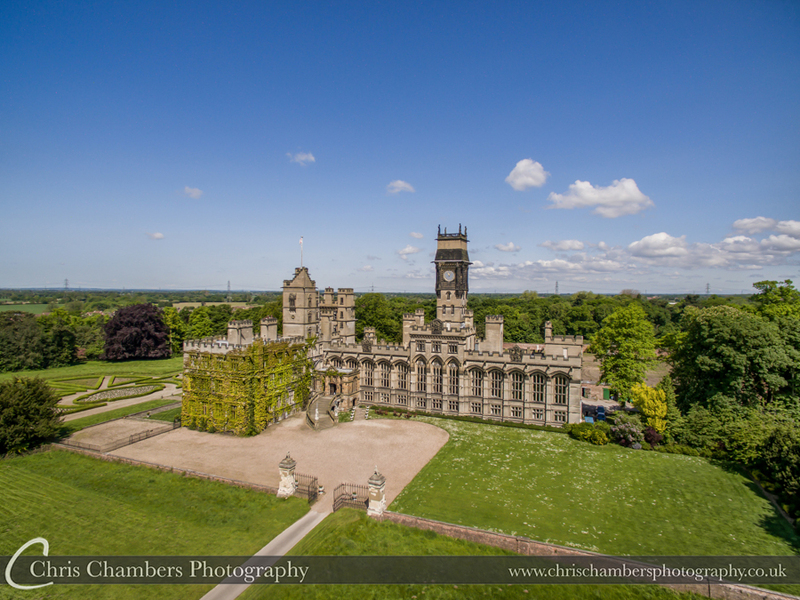 Set in 250 acres of Yorkshire parkland, Carlton Towers is an historic treasure. 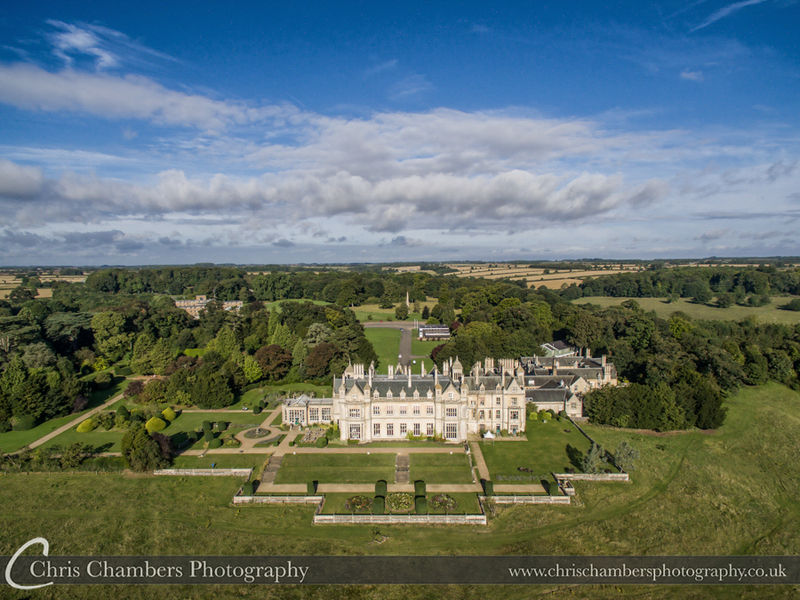 For more Carlton Towers wedding photographs click here. 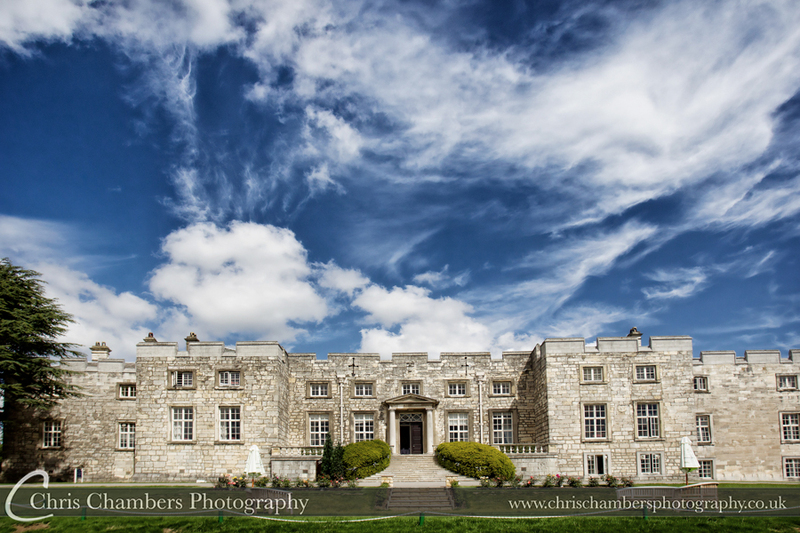 The picturesque Coniston Hotel Country Estate & Spa set back in rolling landscapes is one of the most romantic settings imaginable for your dream wedding day. 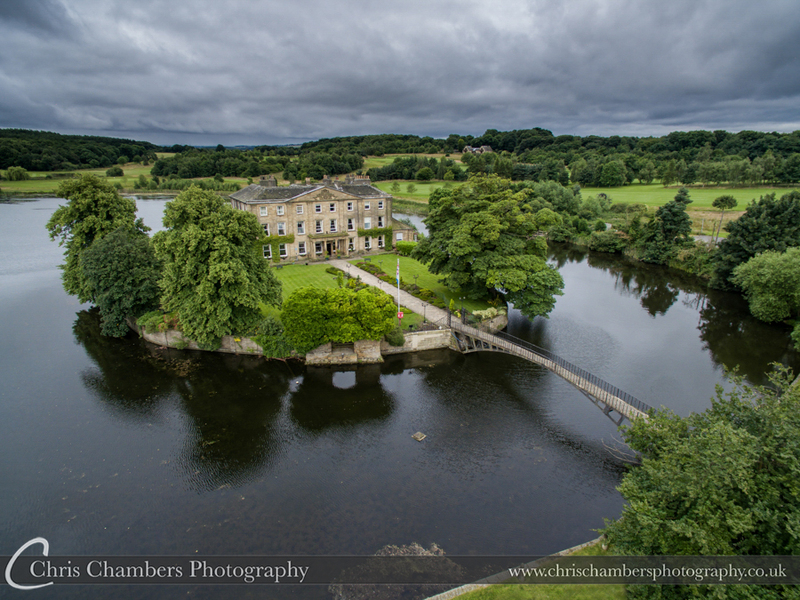 Set back in over 1400 acres of stunning scenery with photo ready lakes for your wedding backdrop, this is the perfect Yorkshire Dale setting for your special day. 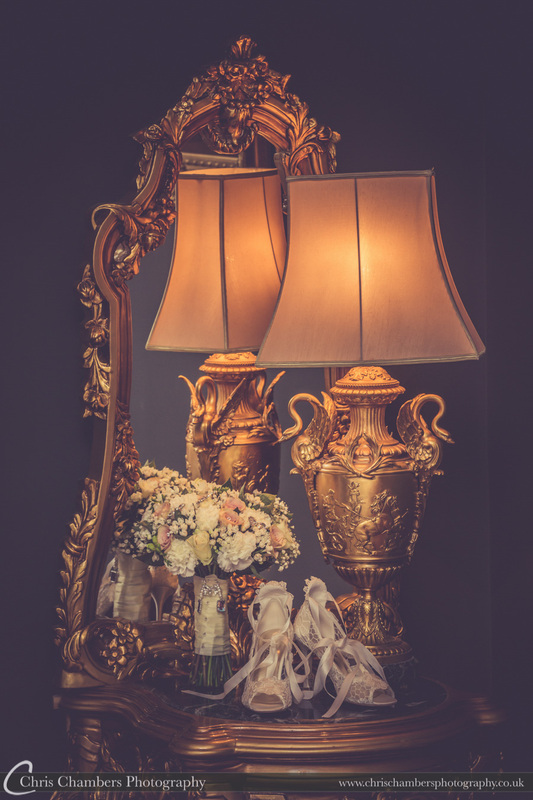 Yet the location is only part of the story – a warm welcome waits, delicious locally sourced food, a fine selection of wine and luxury accommodation for you to relax in and reminisce on your wedding day. 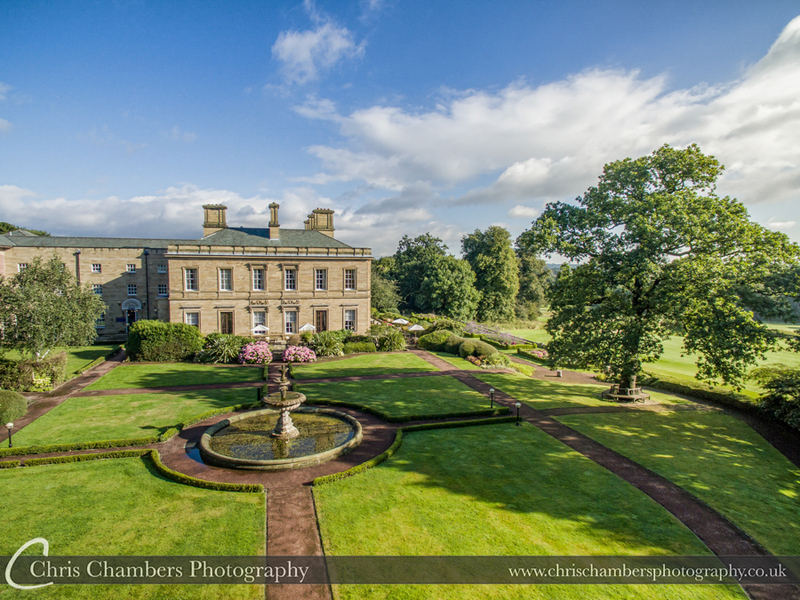 A colourful and glorious building surrounded by beautiful picturesque gardens which are set amidst the simply stunning countryside of the Ribble Valley. Eaves Hall has stunning and luxurious interiors have been designed to bring out the best of the original features on Eaves Hall Lane to create a unique contemporary country house ambience and atmosphere in Lancashire. 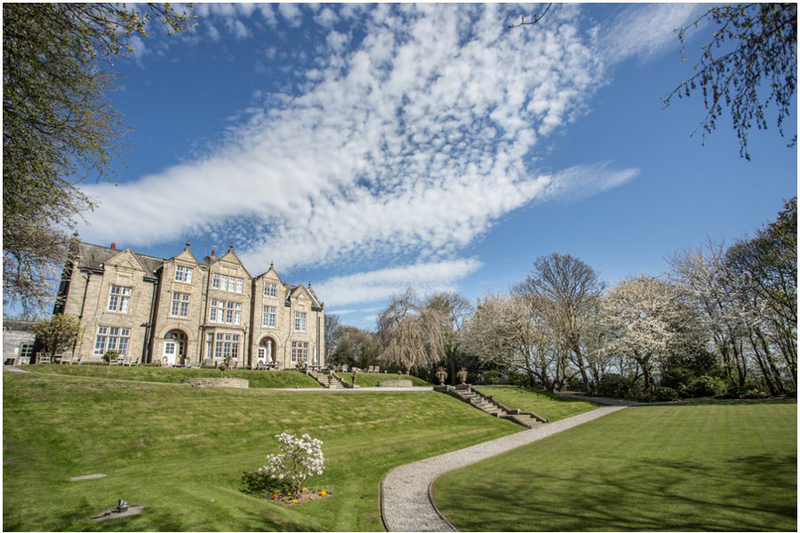 Denton Hall in Ilkley offers a charming interior and picturesque exterior set in an elevated position in West Yorkshire high above the historic spa town of Ilkley. 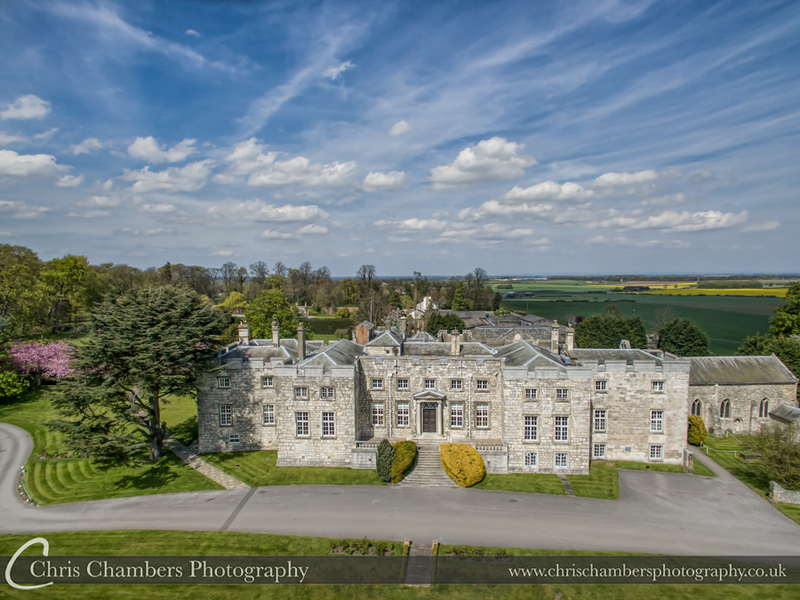 Denton is a Grade 1 listed Georgian country house which is perfect for every bride and groom’s elegant wedding day, Denton is home to the finest examples of 18th century décor and elegance. 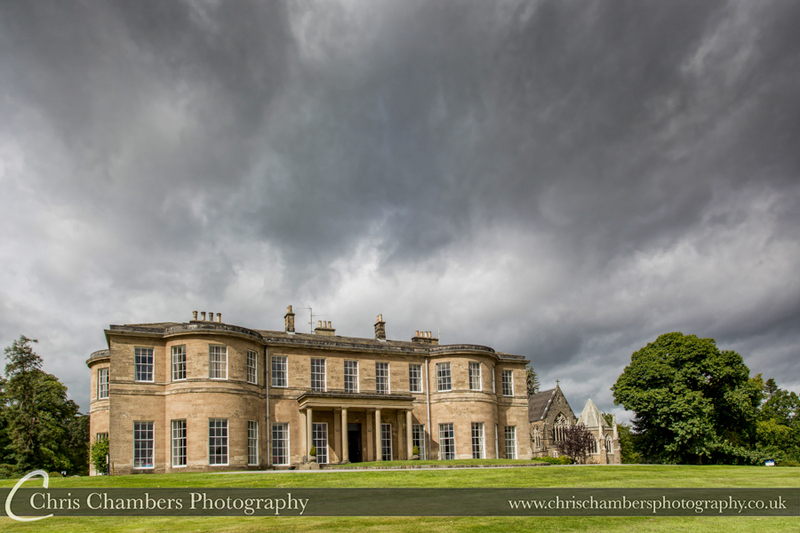 To view more Denton Hall wedding photographs click here. 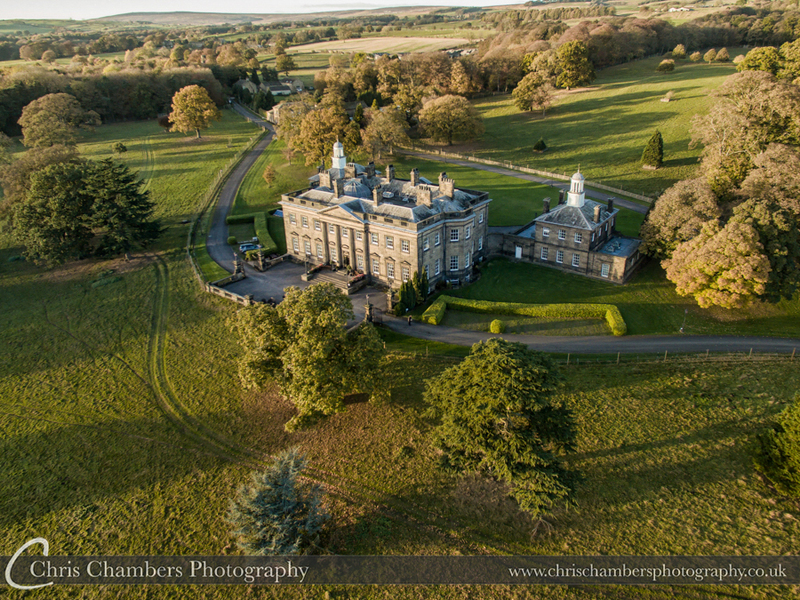 Below, late Autumn at Denton Hall. Long shadows and a golden glow mid afternoon. 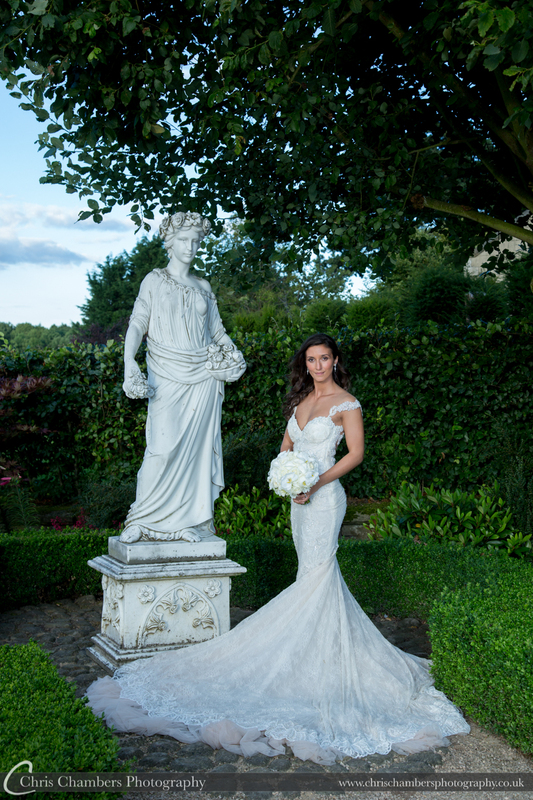 Oulton Hall in Leeds offers colourful and elegant gardens, and a luxurious boutique style interior. 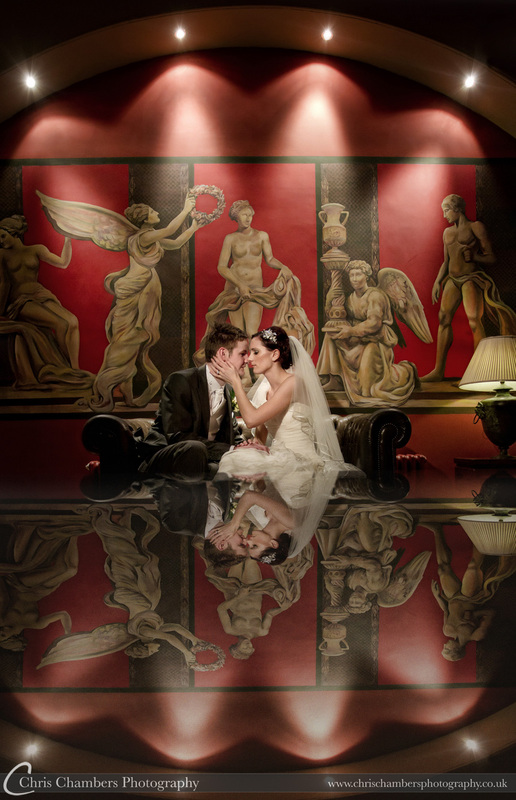 With grand interiors and elegant decorations it offers a picturesque background for your perfect wedding day photographs. Oulton in Leeds offers a set back location from the hustle and bustle of leeds city lights. 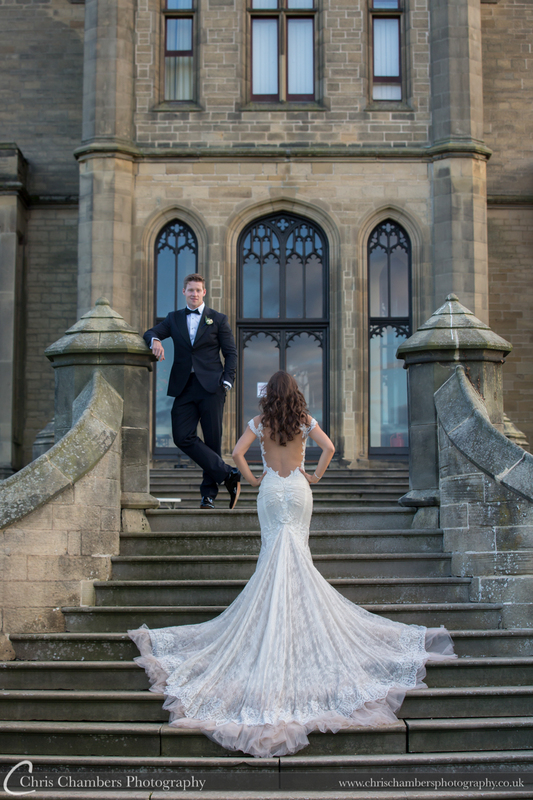 The long sweeping driveway that leads up to Oulton Hall’s grand mansion separates the busy world of Oulton with the surreal bubble of your dream wedding day. This unique 18th century former family mansion is the perfect choice for leisurely beauty. 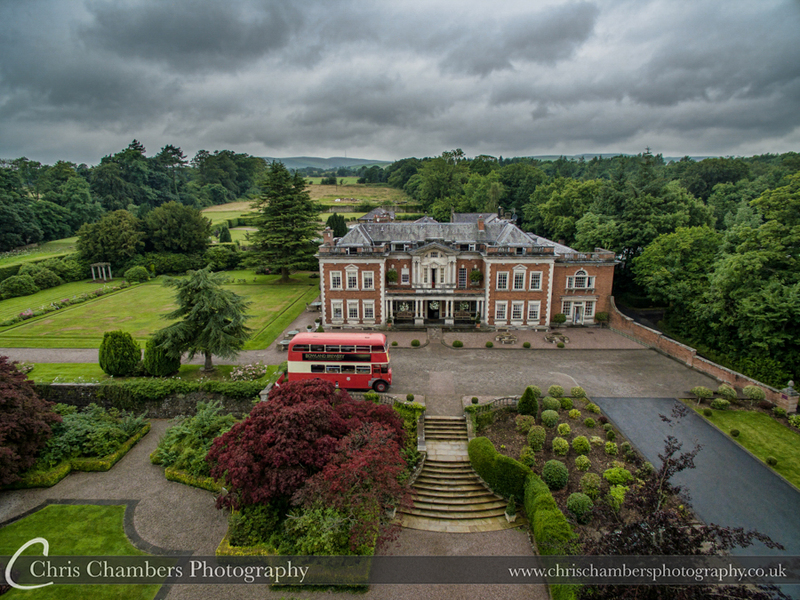 For more Oulton Hall wedding photographs click here.